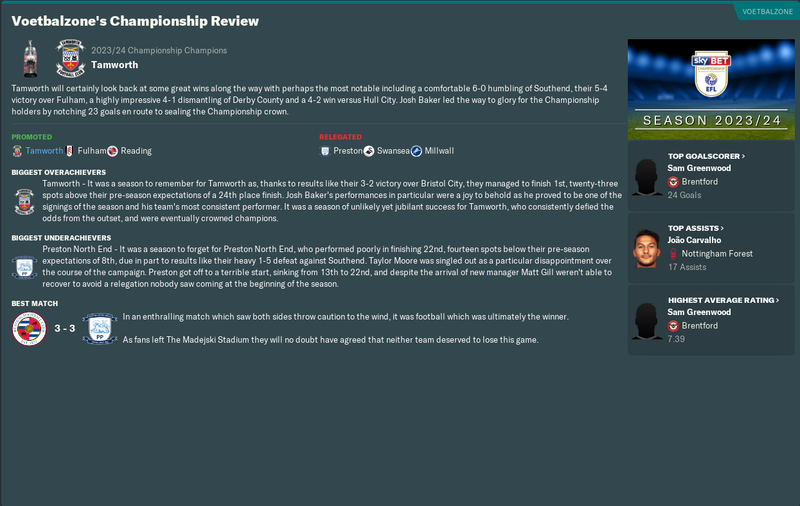 "All of Tamworth's dreams came true this season as they defied expectations suggesting that they would be relegation certainties and instead mounted an almost unbelievable promotion-winning campaign. 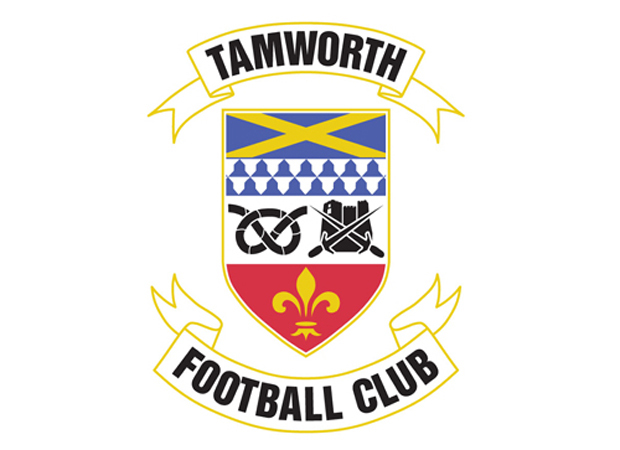 It was a season of unlikely yet jubilant success for Tamworth, who consistently defied the odds and enjoyed a strong spell of form around January that would ultimately carry them to a finishing position few would have predicted." The board did not have high expectations from us as we were expected to fight relegation, even the media did not place any confidence in us but I knew for sure that it was going to be a fight at the other end of the table as we had a very good transfer window. 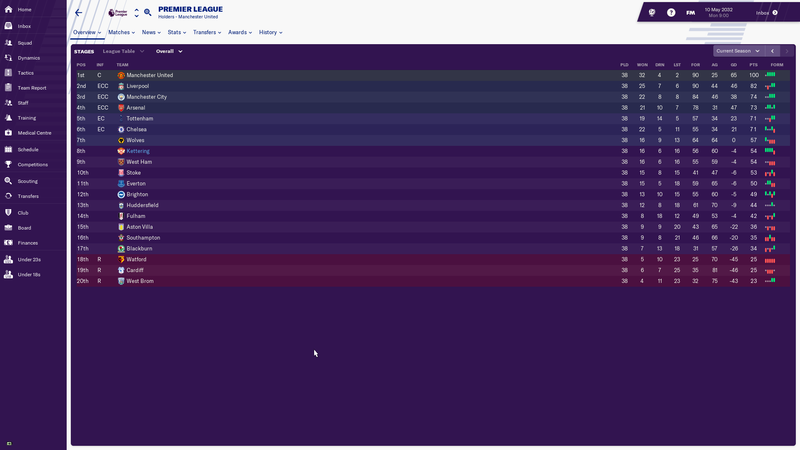 The season started on a high note as we ran riot winning the opening 5 games and continuing an unbeaten run of 16 games into October before we lost against title favourites Swansea City, ending the month with 2 defeats in the league. Our early run had us leading the table before a run of 5 straight draws August end and September pushed us down the table to 4th, where we remained till the second half of the season as we chased early leaders Bolton Wanderers, Southend United and AFC Wimbledon. We would be defeated only once in the run-up to the final month of the season, with that defeat changing the course of our season like no other match ever in our history. And our life was made difficult by an amazing disappearance of form from all our strikers where between 5 strikers we managed only 6 goals since January, such bad was the form of the strikers that last year academy graduate was also given a look in even being nowhere close to being a National League striker. The wingers and the attacking midfielders played a huge part in keeping us afloat by contributing ably with goals, but the strikers' bad form was going to bite us. 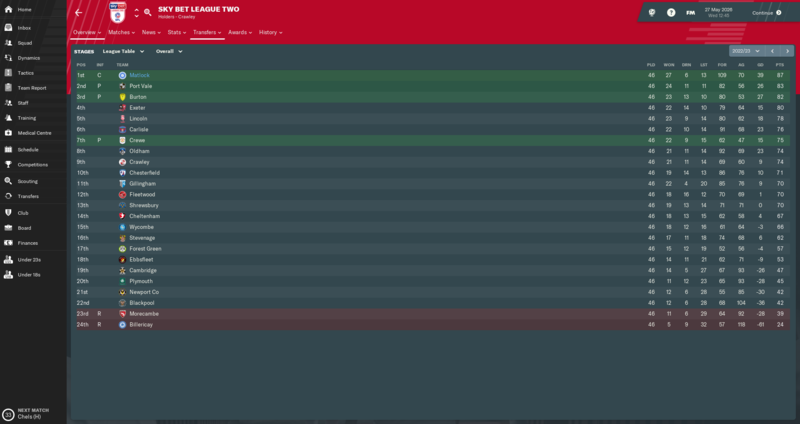 Somehow with four games to go in the season, we were comfortably placed to win the league title, if we continued the form of our season. Swansea City and AFC Wimbledon had fallen off the chasing pack. Bolton Wanderers had the worst form in the last leg of the season as they did not win a single match in April, leaving Southend United as the only credible challenger. We could have made the task easier for us if we had won the home match against them giving us a big points cushion but we laboured to a 1-1 draw. The last match of the season away at Doncaster Rovers we still held a one-point lead in the table. Our opponents had won only 1 game against relegation fodder in their last 11 matches, and we needed to win the match to secure the title. Even a draw would have sufficed for us if Southend United did not win their last match. We were comfortably controlling the game and were leading 1-2 against a ten man opponent before the sides were levelled as well when we were down to ten men as well in the 87th minute. Going into injury time it seemed the players were already celebrating as we were winning with our title challengers drawing but in a crazy 4 minutes of injury time, we blew our title hopes to smithereens as the opponents scored two goals to hand us a 3-2 defeat. The final day results meant that we finished on level points with our title opponents but lost the title on goal difference, in what has been a crushing end to the season. 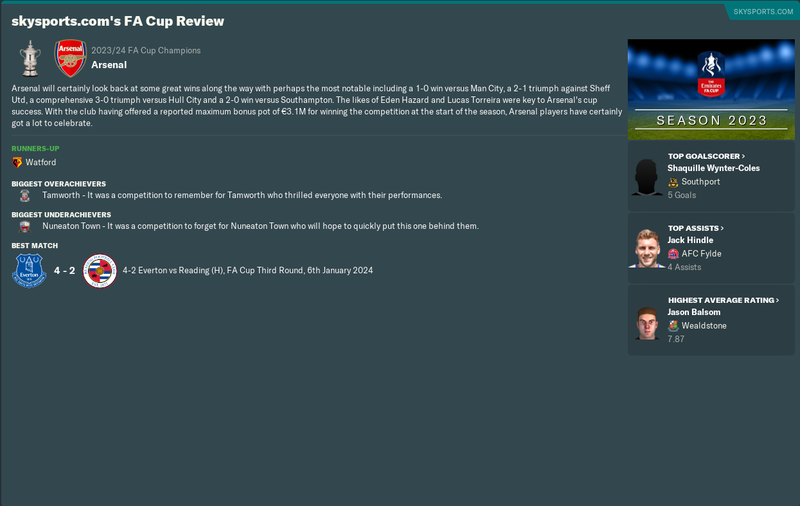 The FA Cup was nothing much to write about as we needed a penalty shootout against league two opponent Notts County at home. 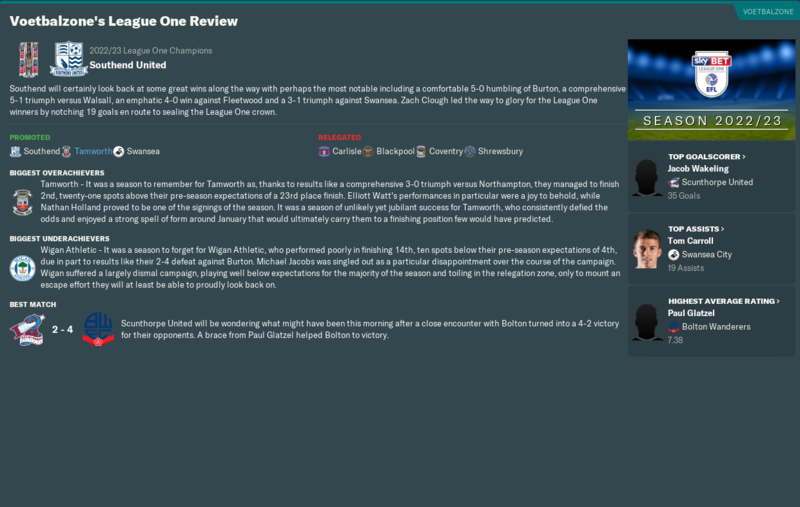 The second round saw us play Burton Albion at home where we were pretty much outplayed by the opponents but somehow survived to take the match into extra time before coming away with a 1-0 win. Round three Newcastle United visited us in what was a dirty and physical match with the opponents outplaying us till halftime leading 0-2. In a fantastic spell of 15mins after halftime where we outplayed and outclassed our fancied opponent, we had scored 2 goals in space of 5 mins to draw level. We lost too a silly goal as an indirect freekick saw the ball into the box where a shot took deflection falling at the feet of an opposition player who put the ball into an undefended goal as our goalkeeper could not recover from the dive to save the deflected shot ending the match with a 2-3 defeat knocking us out. 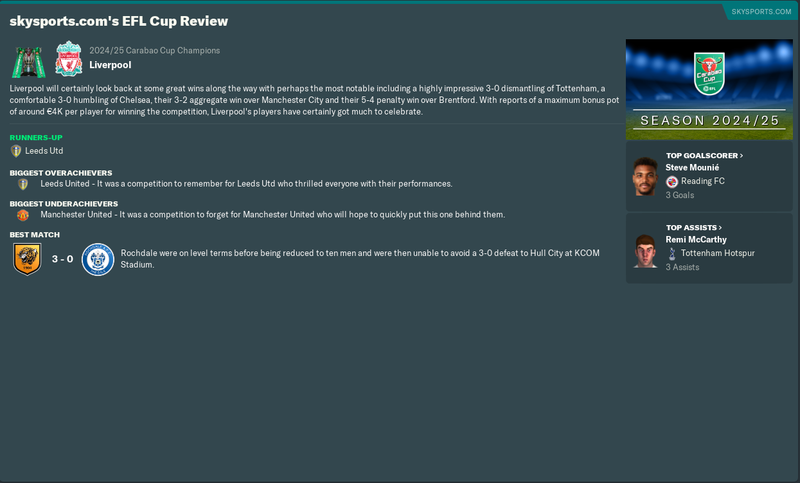 The Carabao cup had us a difficult draw throughout as in the first round we needed a penalty shootout to win at home against fellow league one team Burton Albion. The second round saw us visit championship side Aston Villa in one of the memorable matches of the season for me which saw us play a beautiful possession passing game as we completely outclassed them as we won 0-2. We visited Manchester City for the third round and gave a good account of ourselves as we matched them across the pitch only to be defeated 0-1 thanks to the brilliance of one individual who hit us on the counter to score a goal from the tightest of angles. Our league trophy performance in the group was a bag of mixed performances as we got knocked out in the group stages finishing last. We scored the highest number of goals including a 6-1 mauling of Blackpool but our defence did the disappearing act against Manchester City U23s and the striker disappeared in the next match again eventual winners Bolton Wanderers. 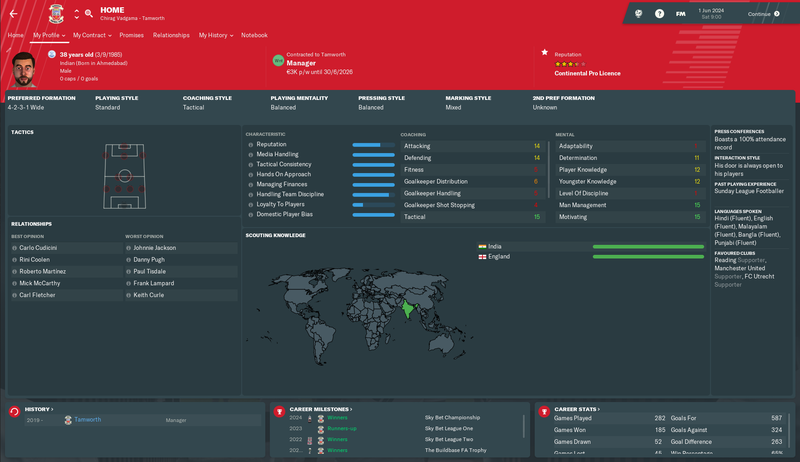 Tamworth FC most capped player at 123 appearances and first choice goalkeeper Henrich Ravas is leaving us on a free transfer after refusing to sign a new contract but that did not stop him from putting his finest performance in 3 years with us as he set a new club record of 17 clean sheets. Slowly, the squad is growing into a team which conforms to a certain DNA and players are performing to the philosophy I would like them to achieve. Defensively the back four was able to play well at a higher defensive line yet getting back well in time to be able to handle the crosses. No single player was able to dominate the defensive stats which is not to say no one was good but rather every one of them performed at a very high level however special mention must be made for Jordan McGhee who still performed above the rest. Club captain Jordan Rossiter has been a fantastic performer as a box to box midfielder and along with Elliott Watt has enabled to play a more passing oriented play from the midfield. Elliott Watt, Reece Cole and Jordan Rossiter contributed 23 assists from the midfield as for the first time in our history our play developed more from the midfield rather than wing play. Despite that Nathan Holland was impressive on the wing as he plundered 13 goals and 13 assists while academy graduate Jon Osman made the left wing his own with 6 goals and 6 assists as last season first choice David Olaoye faded away. Our poor finishing by the strikers in the second half of the season contributed to some extent in our failure to win the league, because if they had performed to their ability and the first half season form we would have been far away from the chasing pack. Joe Quigley finished the season with 23 goals to his name, he could have easily breached the 40 goal mark if he did not lose form in the second half as he scored only 2 goals in early January and none for the remainder of the season after that. Kyle Taylor performed fantastically as a shadow striker contributing 15 goals and 8 assists, which along with midfield and wingers goal contribution helped us during the strikers' drought. Henrich Ravas, Jordan McGhee and Jordan Rossiter were selected in the League One Team of the Year. Dave Gilchrist and Emmanuel Woodward both made only one appearance, each being taken off after 45 mins. Jon Osman was retrained as an Inside Forward on the left and is flourishing in the role as he made 30(2) appearances scoring 6 goals and 6 assists. Even though the coaches rate him as decent League two player he performed admirably in League One finishing the season with the 4th highest average rating in the squad. 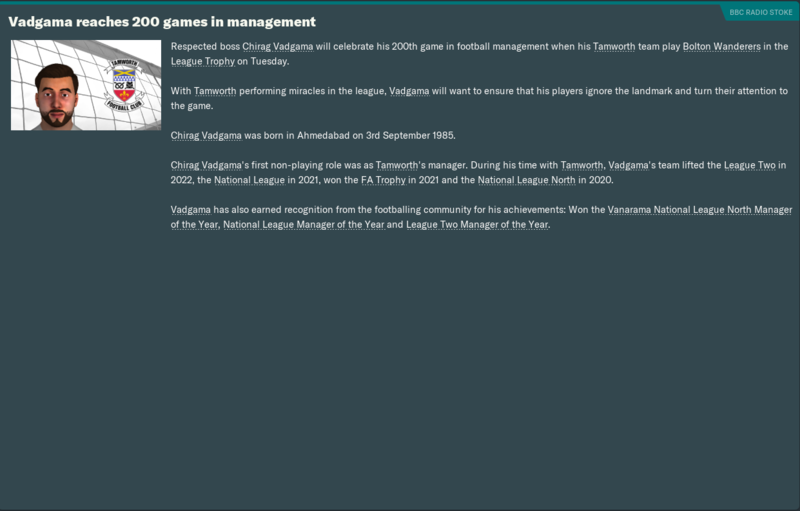 Yours truly won the League One Manager of the Year as well reached 200 games in management during the course of the season. The board announced the club is planning to build a new stadium. With the club now also under a takeover bid, let's hope it sorts out before the transfer window and does not cripple me in the market next season. 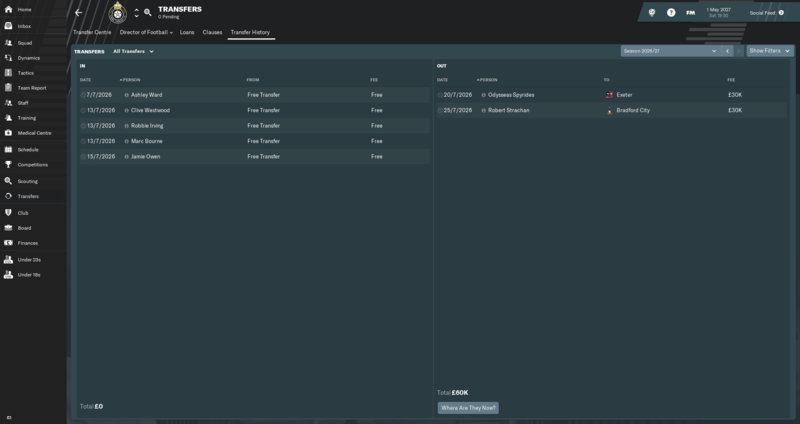 I have the core of my recruitment list ready and plan to launch on it right away before any curbs are placed on the club with the goalkeeper the highest priority as first choice and second choice are both leaving on a free transfer. The recruitment focus this season on is going to be more future-oriented as we start to compete with other clubs for higher potential players and start to build our core team to serve us for a long time rather than build a squad of journeymen. Next season I am hopeful of challenging for the playoff spot if all my transfer targets are successful. Manager favourite Reading FC never found any consistency in the league as they finished 4th in the league earning themselves a playoff spot. However, they could not beat the Play-off curse as they lost in the final, making it an interesting next season as we compete in the same league with them. Manchester City, Real Madrid, Paris SG, Juventus, Bayern Munich, FC Porto, Ajax, Anderlecht won their respective leagues. Bayern Munich won the UEFA Champions League and Sevilla winning the UEFA Europa League. India is ranked 105th in the world. A long overdue update due to too much work irl. It was a season where York and Dorking were fighting alongside to see who would win the league. On the very last matchday York were 1 point up. We recieved the help we could have needed to lift the title, as York drew their last game. Unfortunately, we lost our game. This placed us in the dreaded playoffs, despite having amazed an incredible 104 points. We played Alfreton at home in the semi, and won 1-0 in extra time. The final saw us play Bromley and in a 1-sided show we beat them 4-0. The Cups were good enough, although not producing the same income as last season. We lost in the 3rd round in the FA to Cheltenham, where we played 1-1 at home, and 1-1 away followed by a loss on penalities. In the FAT we marched all the way to Wembley. In a game where Wrexham insisted on playing with a lot of fouls, we won 1-0. 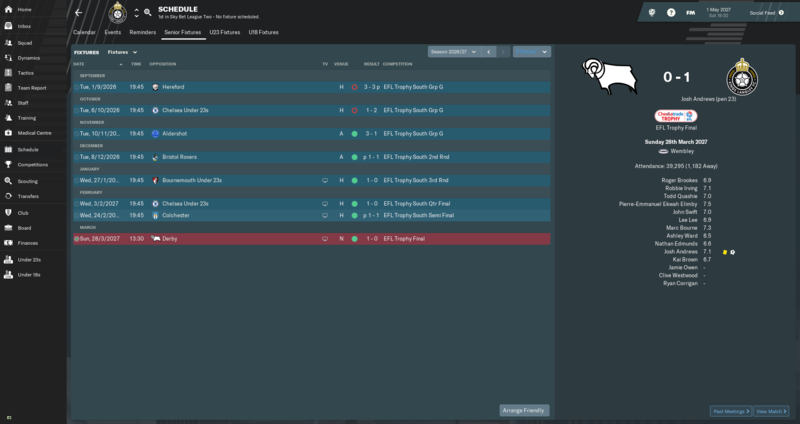 Despite going to League 2, board only agreed to improve the youth facilities. Many of our staff saw improvements to their abilities including myself a few times. Last two years amazing goal machine Alex Gilbert had a bad season in comparison to the previous. He was tuted as this years league top scorer. That he did deliver on that with a total of 28 goals and 8 assists. At the start of the season he was tuted as potential CH striker, but during the season that changed to a leading VNN/S striker only. Only positive from this, were that clubs started to loose interest in him. Owen Gallacher (SC), who hasn't had much luck first in Newcastle, then Forest and and finally QPR - without playing a single game, found a new home with us and scored a solid 22 games in 42 matches. Josh Pask (DC) played his career at West Ham without breaking through the ranks, but played a great season for us with a tackling % of 96 and passing of 76. Adam Maguire (GK) had 3 years of training with the Wolves before they let him go. 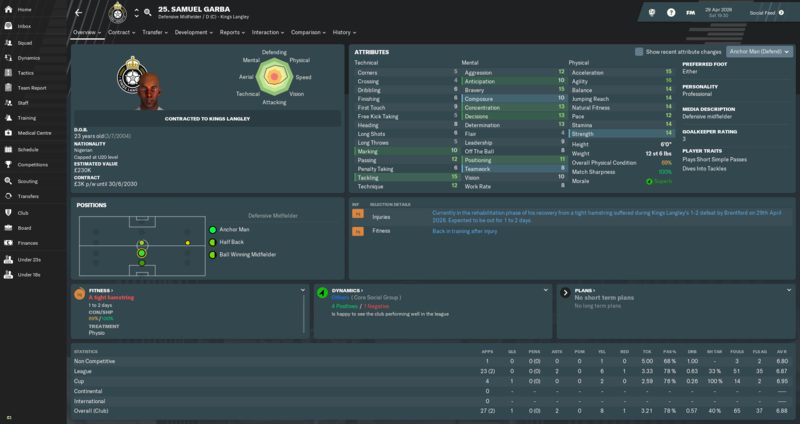 He went straight in a first choice keeper and had 27 CLN in 53 games. Stanley Mohammed (AMR) previously Arsenal, and our first U19 internation (from Nigeria), was a much needed fresh breath on our flanks. 34 games 8 goals and 10 assists. One of this seasons highlights, were the FA Committee actually rescinding a ban. 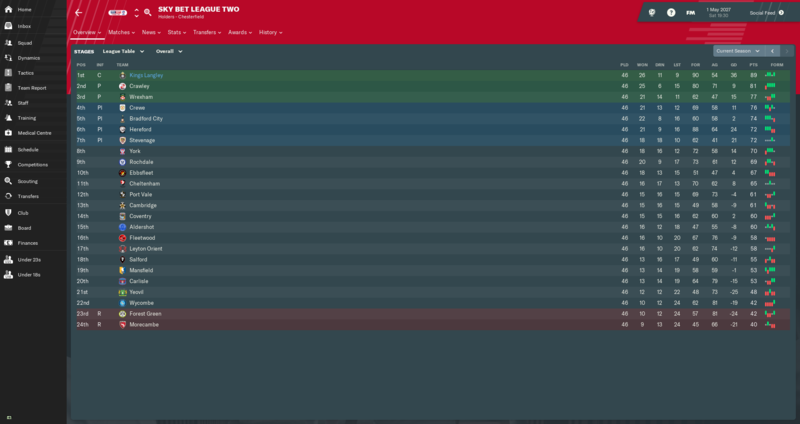 League - First season in professional football and what a great first season we had in League 2. We proved that we could compete in this league and always had chance to win the 3 points. Up until December we had a realistic chance of gaining automatic promotion but ultimately this proved to be too much for us. 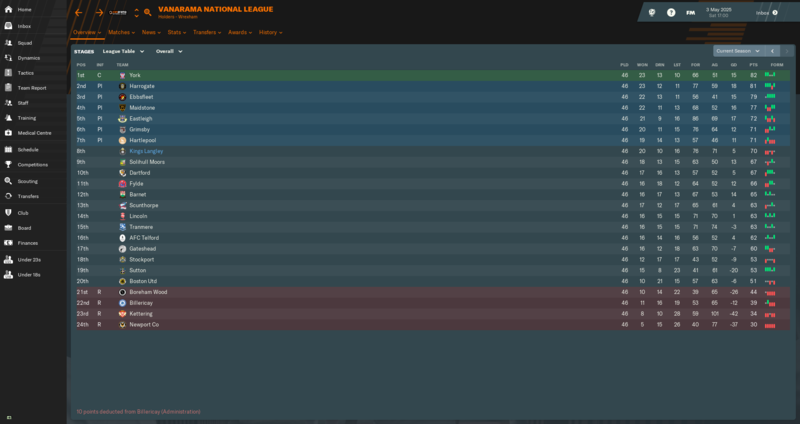 Instead we stayed in the promotion places and ended up finishing 5th. Unfortunately we came up short losing to Leyton Orient in the play off final by a score of 2-0. That of course was disappointing as we put together a fantastic season considering we weren't able to add that much more talent. 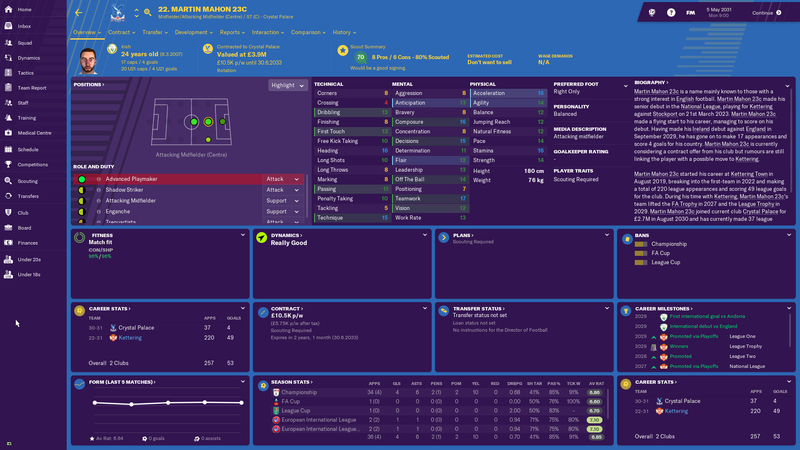 Our best striker is still Zane Banton who I signed in our first season, and he is definitely not League 2 standard but I wasn't able to find a better replacement that was worth the wage they demanded. Cups - League football means new and more cups. In the EFL Cup we faced Cardiff City in the first few weeks of the season and thoroughly got beat 3-0. In the EFL trophy we finished first in our group before losing to Northampton in the Second Round of the South section in a close 0-1 game. The FA Cup with disappointing as we swiftly crashed out in our first game against Peterborough with a 1-3 defeat. Need to do better! 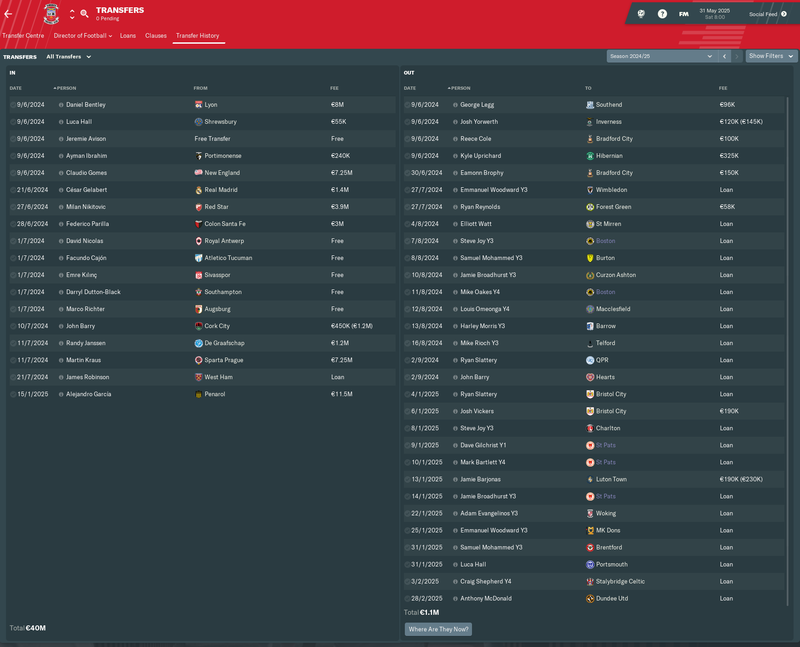 Transfers - Added more midfield players and am really happy with my options here. Loaned in 2 players for the first time and both played big parts. Got Lee back for next year and will continue to be first option at LW. Villa wants Bytheway to play at a higher level now which is disappointing as he was a rock at CB. Finances - For the first time we have(had) money! I quickly put this into both our facilities and even got a new coaching badge on the way. With our profile rising we should continue to see our attendance go up but still see our average home attendance around 1,500 which hurts. Last season we finished in the top half, so I was hopeful that we could make the playoffs this season. League Table - we actually topped the league for a lot of the season but fell apart when it really mattered, missing out on the playoffs on the final day. FA Trophy - this didn't last long. FA Cup - we were five minutes away from the holy grail of an away tie at a Premier League side. 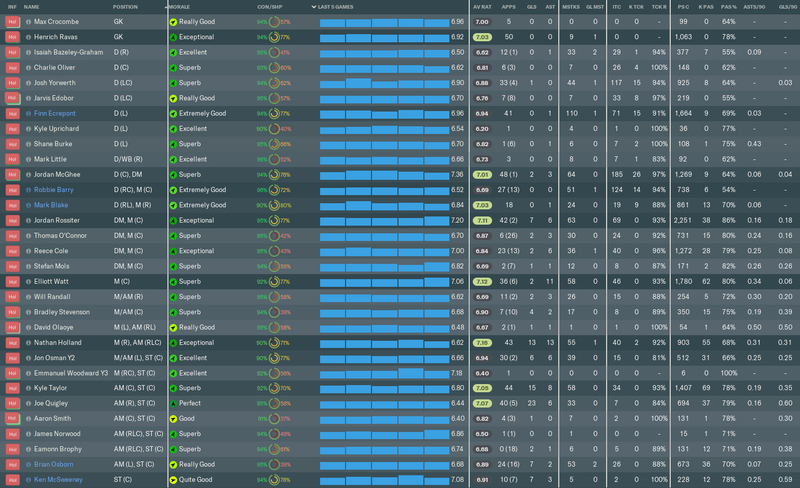 Squad - the squad is far too big so I'll be looking to offload a few for next season. Transfers - the usual mixture of brilliant and not so brilliant signings. Finances - we are losing money badly. Odysseas Spyrides - top scorer, but not an automatic first choice. Kai Brown - finally settling into the supporting role. 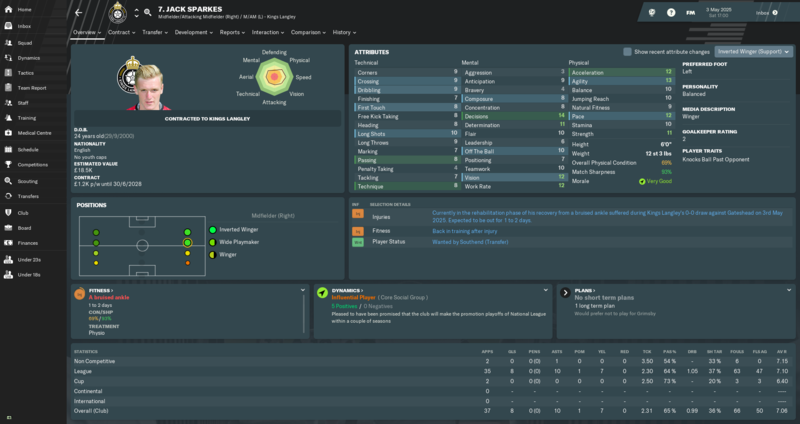 Jack Sparkes - a great new signing. Ryan Corrigan - another huge new signing. Pierre-Emmanuel Ekwah Elimby - the pick of the new boys. I guess we are aiming for the playoffs again. Could anyone explain this, I organised a bunch of high profile friendlies as I usually do to balance the books. On the countless occasions I've done this before, I've always managed to make a very large profit. I was expecting to go from -96K to at least 200K. However, there's large amounts going on 'other' expenditure meaning, the income generated by these friendlies has been nullified. 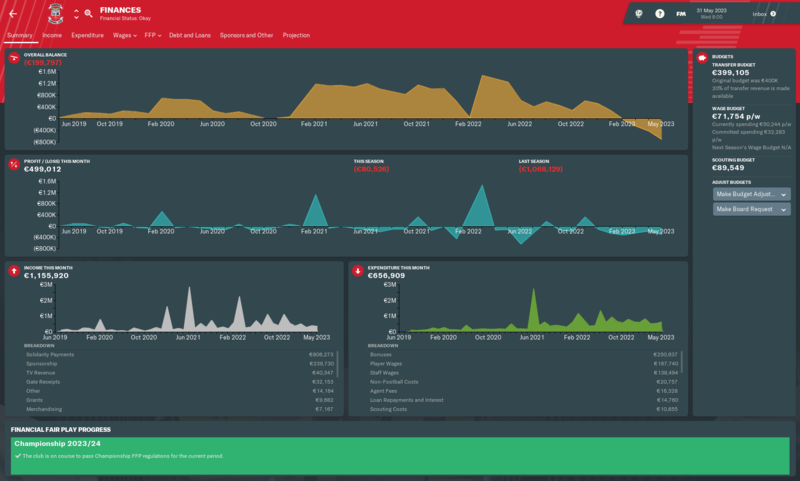 The club is in discussions in regards to a takeover, does anyone know if this could what is affecting this income. I've just noticed the same thing. 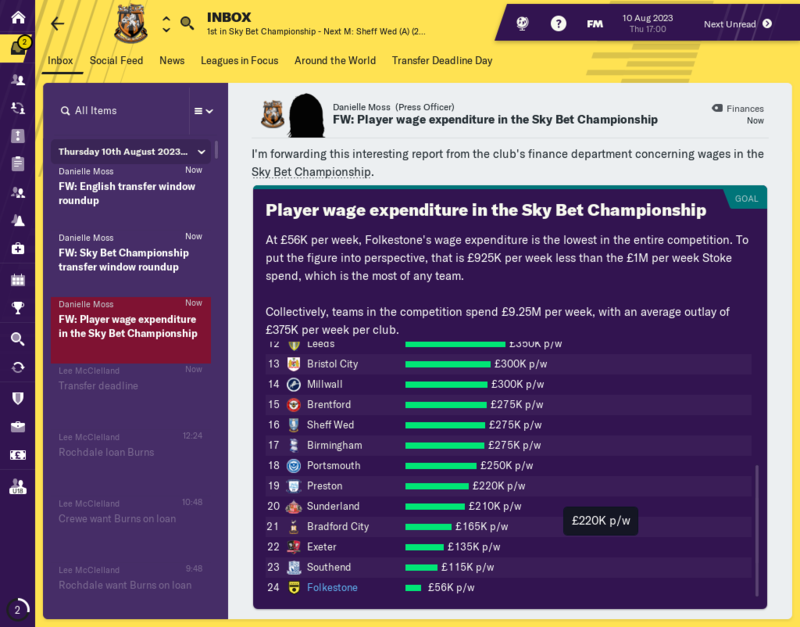 I've just played a hectic pre season to try and clear the debt, but it barely made a difference. 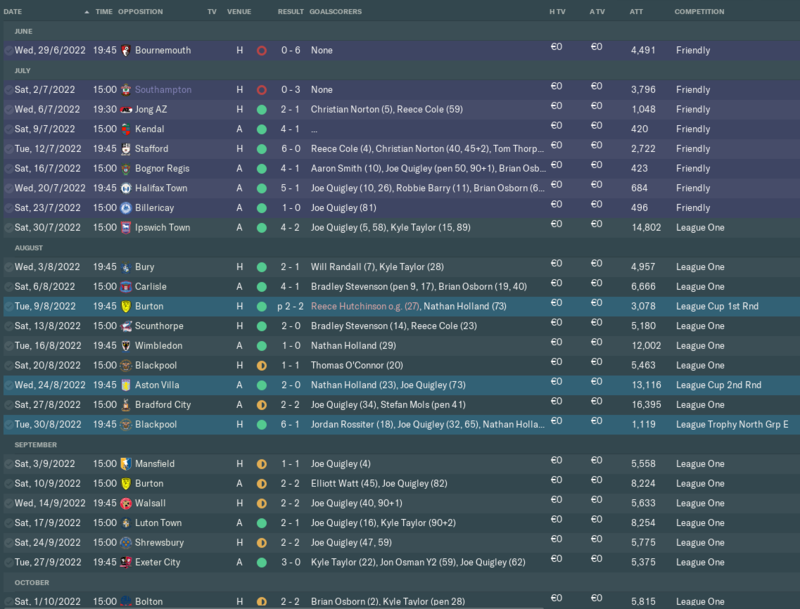 Started the season slowly but got into mid table, started to think about the playoffs but a run of 7 without a win in feb/mar left the team in the middle. Defensively the team conceded the same number of goals as last year but scored 25 goals less. In the cups, the team lost out to L1 Bradford in the FA cup 1st Rd. 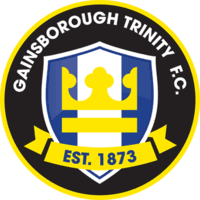 In the FA Trophy the team made more progress getting to the 4th Rd. Losing to VNN Telford was disappointing although they did go on to win it. 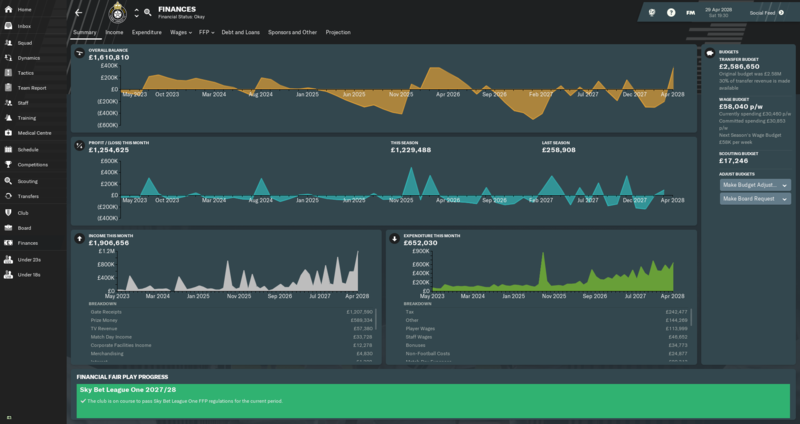 Finances were again strong and the team turned professional at the end of the season. The defense was generally pretty poor with Agbontahoma an exception thanks to his goal scoring efforts from set pieces. Youth player Vernon was given a few games at the end of the season. In midfield Klass stood out although most of the CM's performed well. Up front Kealy chipped in and my best player Dongda He was very inconsistent. Started the season very poorly and was in the relegation zone for the first third of the season mostly due to poor away form and a lack of goals from the strikers. Bringing in George and changing Dongda He's position from an AF to DLF helped turn the teams form around. The goals stared to come with 55 in the last 28 games, unfortunately there were 45 conceded leading to 11 draws and 7 in a row. The team finished just above the relegation spots. The away form was the worst in the league with just 2 wins and 14 losses although 11 were by a goal and the other 3 0-2 defeats. In the cups the team again went out in the 1st rd of the FA cup, this time to L2 Billericay. 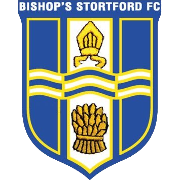 In the FA trophy the team reached the final where they lost 3-2 after George missed several 1on1's and Barnet scored twice in the last 10 mins. 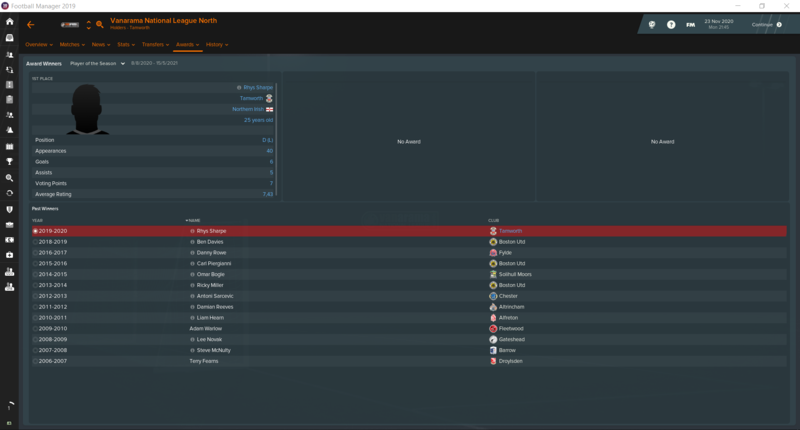 Due to turning pro my wages nearly tripled and finances really went downhill only helped by the trophy final. Not really seeing an advantage in being pro this season. 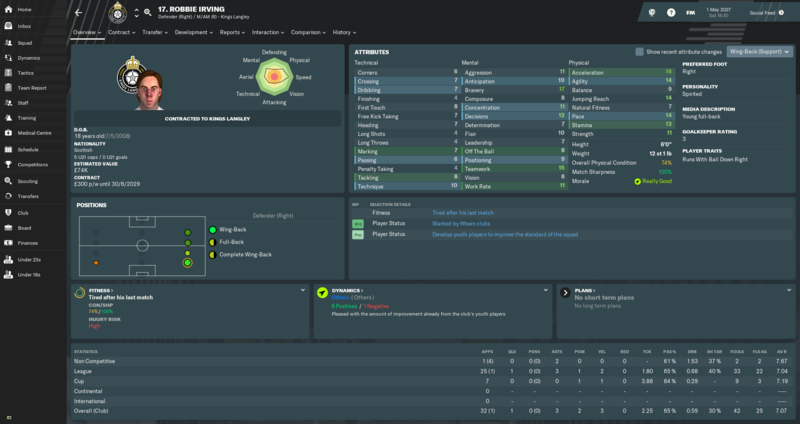 Vernon became first choice and ended the season as my best player. He was called up to the England u19 team after the season and as a result is now wanted by 20 premier league and championship teams. The defense still conceded a lot even though i improved the LB position but ended up playing my 3rd choice RB for most of the season. In midfield Klass and Payne were excellent with Klass scoring a lot from CM, mostly though direct free-kicks and penalties. Up front George started really well after signing but was in poor form by the end of the season. Dongda He by comparison started poorly with just 4 goals in his first 20 games but ended in great form with goals and assists. 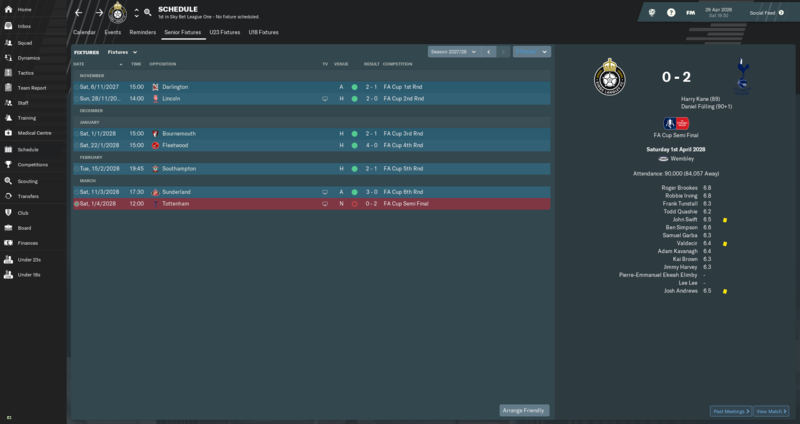 Not sure if I'll stick to updating in here, but thought I'd make a quick post as I do have some questions about managing this low in the leagues. League Table - Tinkered with tactics all season long, finally found a tactic that is super solid defensively and creates loads of chances, but we just can't score. We relied totally on set-piece goals, own goals and scraping home 1-0 wins and somehow we managed to win the league that way. 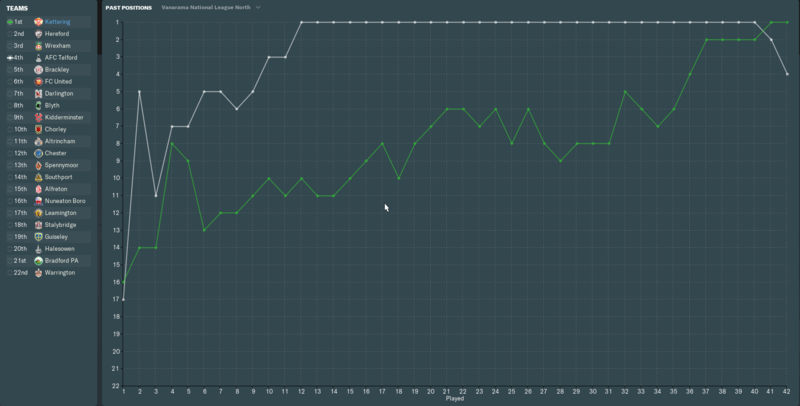 Shoutout to AFC Telford for an all-time great choke. 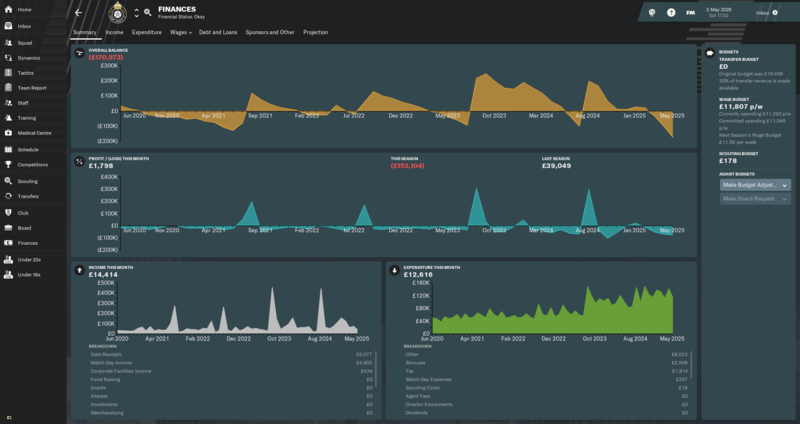 Just have a look at the past positions. FA Trophy / FA Cup - Out early in both, nothing to write home about. Squad - Not the best, but genuinly thought we had gotten together a pretty solid squad, but turns out only our defence works. Lots of work to do offensively. Anyway, I do have some questions for those of you who score goals galore. So the tactic I've found most of my success with looks like this. 9/10 games with it I dominate possession, barely let the opposition into my half (they usually have between 1-4 shots during the whole game, even less on target), my own shots are from decent positions, but my players just will not put the stupid ball in the back of the net. The screenshot of those shots are only from 1 game, but they are very typical for my team. Now I know players at this level are dire and there will probably be more than the usual amount of misses, but I very, very rarely score from something other than stupid rebounds, own goals or set pieces and very rarely do I score more than 1 goal in a game. It just doesn't happen for me. My players get into shooting positions in the box and then either shoot straight at their keeper, their keeper pulls out a worldie and ends the game on 7.5-8.5 rating (regularly - also why does this never happen to mine when he has an incredible game?) or the shot is blocked by a defender. 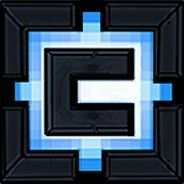 Now, I'm no tactical mastermind at all, so if someone has any feedback to what might be my problem that'd be suuuper appreciated. It's not just a few games this season where my team have played poor offensively and missed loads, it's genuinely every single game and I do not know what to do. I see people scoring over 90+ goals in a season on here, and have players who score 20+ goals or make 10+ assists and I just get so jealous, because I have players that are rated as good enough for the league above, but none of them post numbers that are remotely close to those. 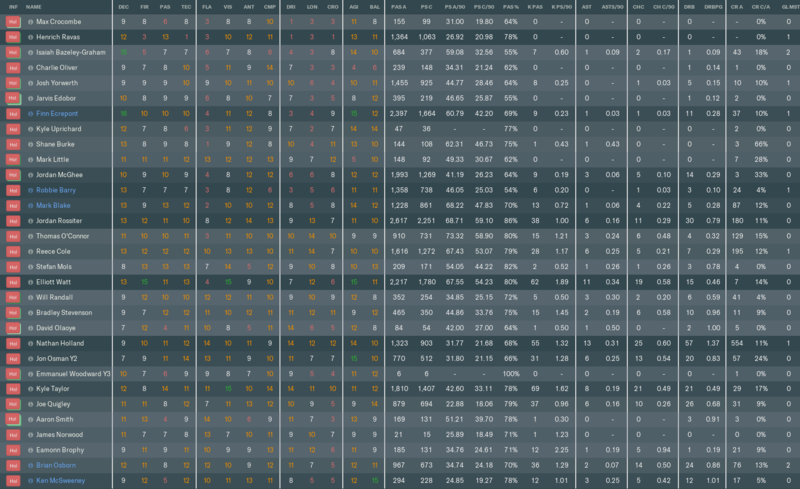 My top scorer ended with 14 goals during the entire season, 8(!) of those goals came from 3 games and no one else finished with more than 8. 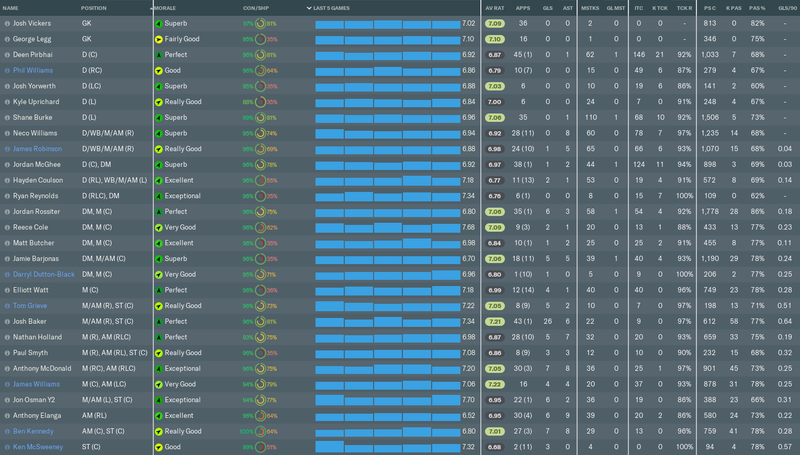 My top assist-maker had 10 (practically all of them from set pieces) and no one else finished with more than 6(!). It's a mindnumbingly boring only ever scraping home 1-0 wins and relying on pure luck to score when I play. 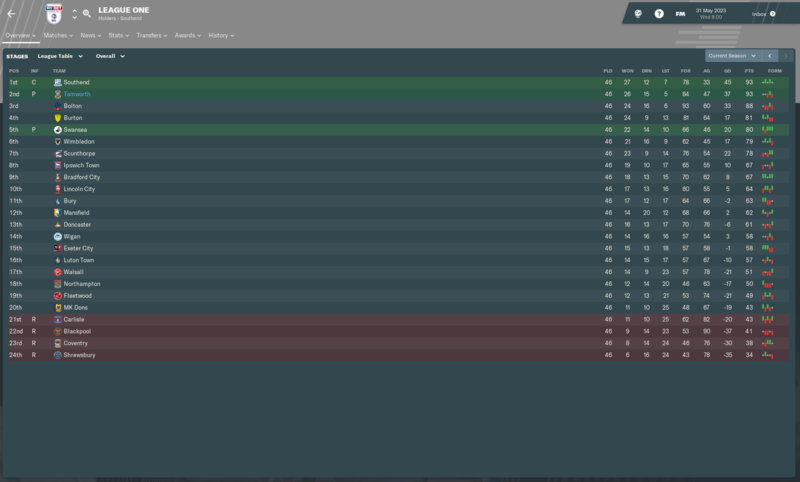 I know I won the league, but it took an incredible amount of luck in my last ~10 games and AFC Telford putting up a choke for the ages. Survival is the goal, but kinda hoping for a mid-table finish. 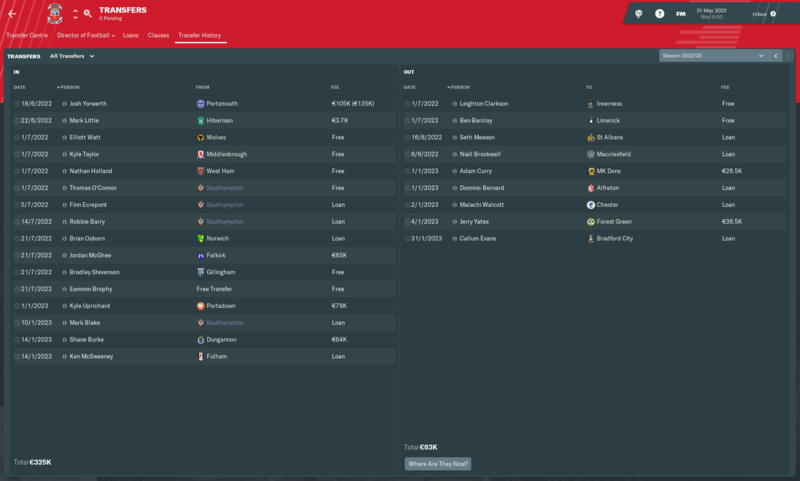 Was unable to get many of my players for this season to only sign 1-year contracts, so got quite a lot of useless players on the books until 2021 (unless I somehow manage to off-load them, but I doubt it). 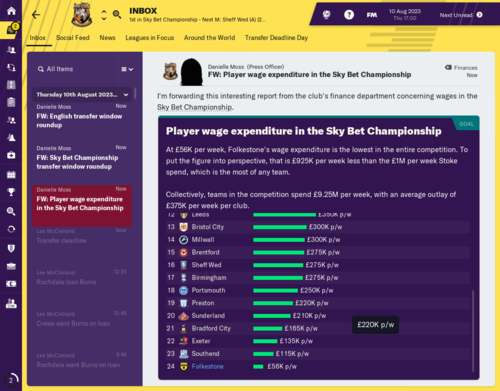 I do have around £10.000 available for wages next season, and so I might splash some of it on a few key players, but still unsure. Would end up with a stupidly big squad if I went out and signed several more players. I've been busy at work as well as a few other things so i haven't had time to update my posts. 22/23 season was great for Matlock Town, We got to the 3rd round where Everton put us out 3-4 after extra time. Our stadium now has 2,000 seats and a capacity of 5,050. Our other facilities remain the same. League one was easily won by Bolton, we managed to clinch 2nd In the league cup we were put out 1-0 by Walsall and in the 2nd round with a 4-2 loss against Luton. We were more successful in the EFL Trophy North, We beat Preston u23s, Man U u23s but Man City u23's put us out on penalties in the Qtr Finals. Nothing changed in our facilities as we are now heavily in debt, with a 1.9 million band loan and -1.7 million in the bank. Nial Brookwell is still with us and we have a few promising youth. We couldn't get any constancy in the championship but we did finish a respectable 10th. 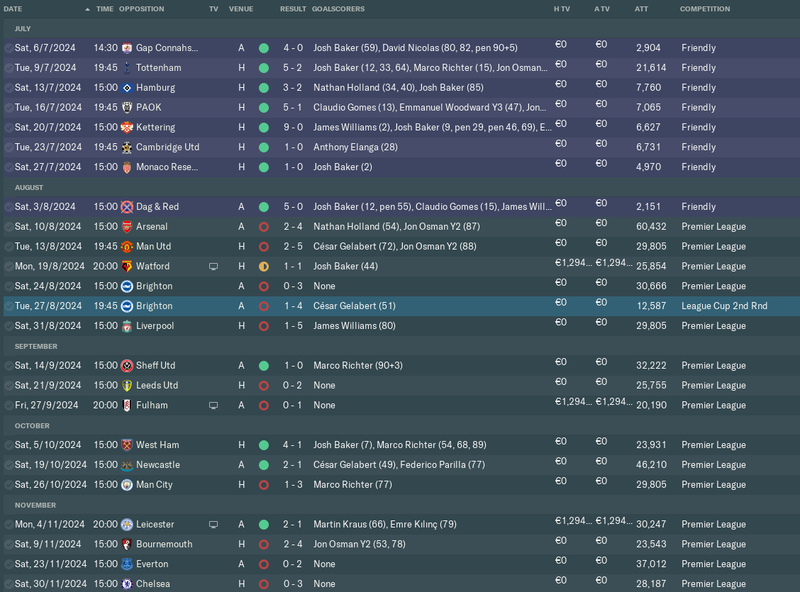 We got all the way to the Qtr Finals of the league cup with a 1-1 win in penalties against Liverpool, 2-1 win against Newcastle before Bournemouth put us out 3-1. In the FA cup Arsenal put us out with a 2-0 loss. Our facilities haven't changed and Niall Brook﻿well didn't progress as much as i wanted so was on the bench most of the season. I seem to have mixed up the pastebins so https://imgur.com/a/YiyYuuk has images of players from this season, this is why you should always make the post to the forum after the season ends. 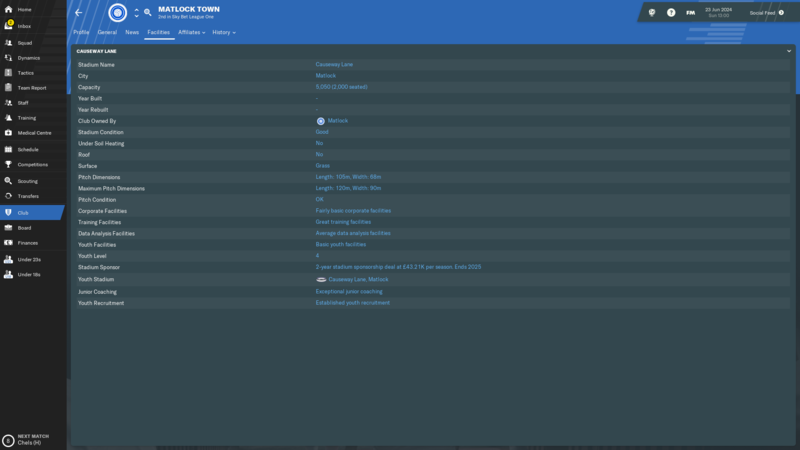 The latest season, we struggled badly this season, my youth players who were all out on loan at the start of the season came back and i wanted to start playing them, fortunately/unfortunately Stoke bought my leftback Dwayne Burgin for 1.6million (3.6million if everything goes well). My star defender Till Cissokho was bought for 800k. Norwich took David Rawden off me for 1million. This helped with finances but left me a bit short for quality players. 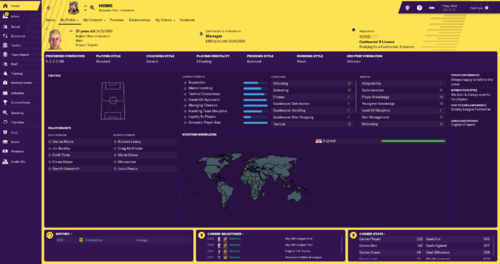 In January long time servant Niall Brookwell was let go to Rotherham, Hull bought one of my Senegal players recommended by my director of footy for 210k but by that point finances were bad again and i couldn't strengthen my team much. 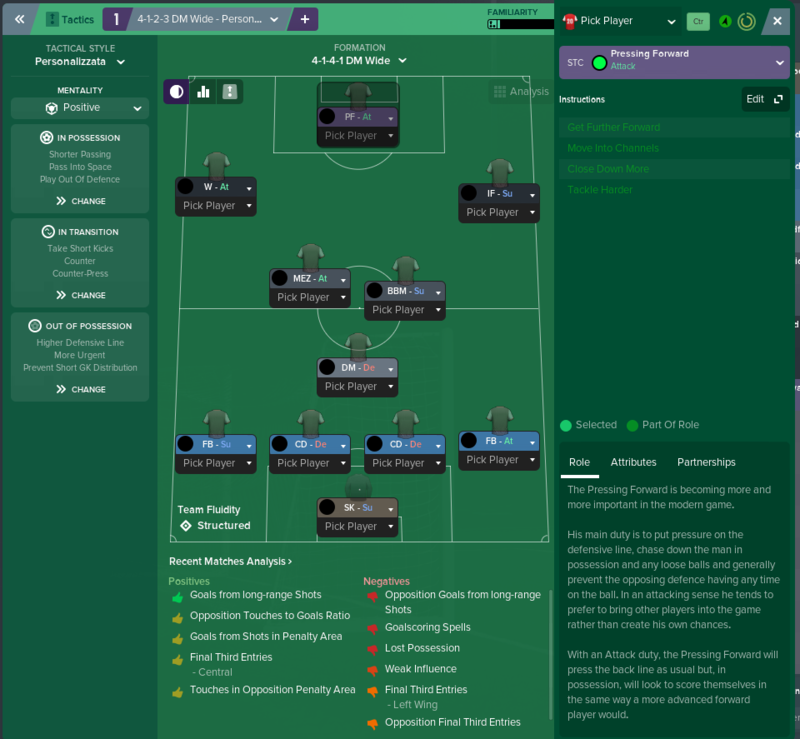 I chopped and changed tactics from 4-2-2-2 until eventually settling on a 4-2-3-1, and starting to win some games. Facilities haven't been upgraded due to financial problems but fingers crossed next season we can continue our good form from the end of the season. 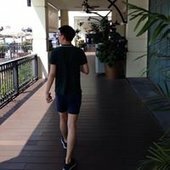 Here's a pastebin with imgur photos https://imgur.com/a/8vFa8mR and my Twitch channel where you can see my progress live. Goals were a lot harder to come by this season with two new signings topping the charts after it became clear the legend Sean Marks wasn't going to be able to make the step up with another year in the legs. The change of formation to 1 up top in January pretty much ended anymore starts for him and he became a late time wasting sub most weeks. George Saunders was again Mr Consistency in every field and is a great little player at this level no matter what role he is fulfilling out on the right of midfield. Time to give this another shot. Was hoping for Lancester City but couldn't get them to show up so this should be a decent alternative. Going to try playing some unpretty football in the mud. We did pretty well last season, so I was hopeful of making the playoffs at least. League Table - we ran away with it in the end. FA Trophy - we were a bit unlucky to lose out in this one. 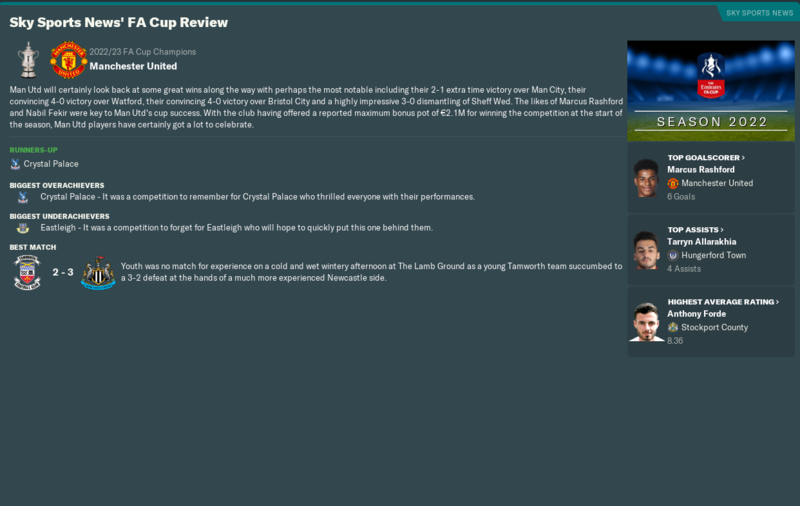 FA Cup - we had an amazing cup run, ended only by a penalty shootout. 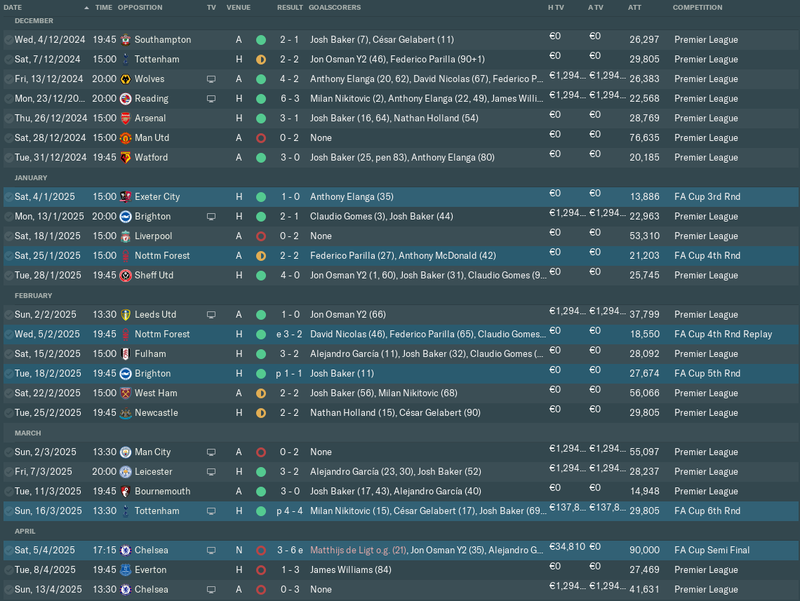 Squad - a lot of this squad should be good enough for next season, I just need a few new faces. 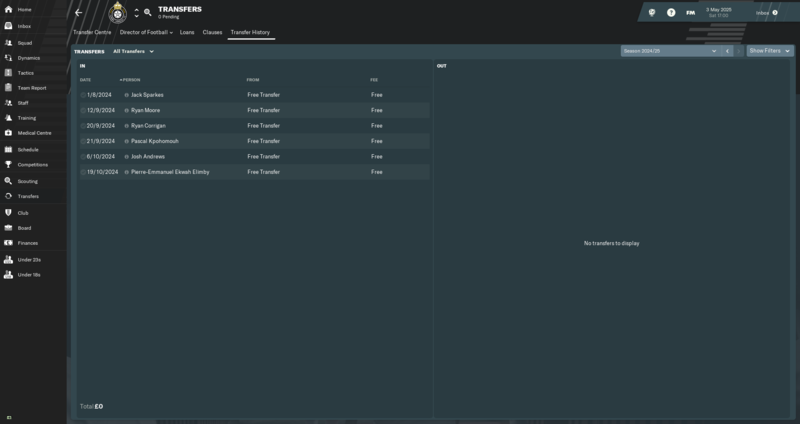 Transfers - one of my better transfer windows. 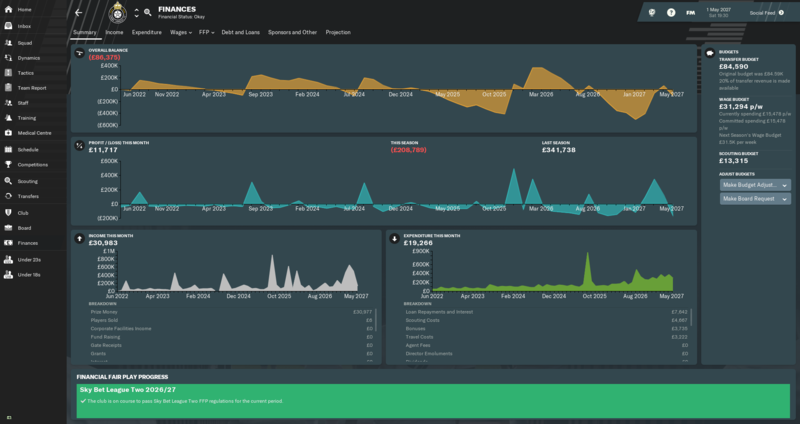 Finances - it looks good, but we are losing money at a rate. Josh Andrews - top goalscorer after a quiet first season. Kai Brown - did well in the supporting role, despite just one assist. Jack Sparkes - such an important signing. Pierre-Emmanuel Ekwah Elimby - our most valuable player. John Swift - he failed to impress, but he could still have a bright future at the club. With the club turning professional as we enter the Football League there will be a lot of work to do. Survival is all want for Christmas. 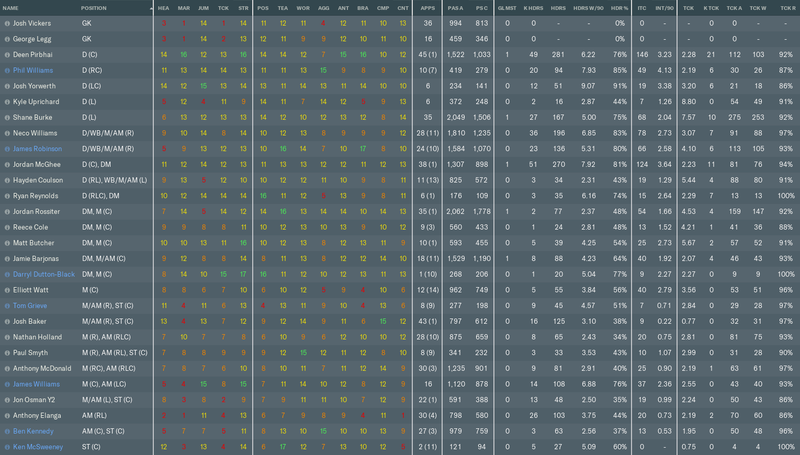 League - Another solid year in League 2 ended in playoff disappointment again. We had a real good chance of getting automatic promotion but coming down the stretch we let the nerves get to us and couldn't find a win. On the last day of the season we still had a chance to get automatic promotion with us sitting on 79 points and facing Rochdale. However we just couldn't find a way to get the ball in the net and we drew the game and Rochdale moved up above Ebbsfleet. 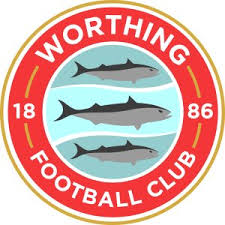 So off to the playoffs again and this year we face Eastleigh in the first round. Eastleigh have been following us the leagues being lead by my former assistant manager. They got revenge on us after we beat them in the National League playoffs a few years back. Next year we really need to push for automatic promotion to avoid this again. 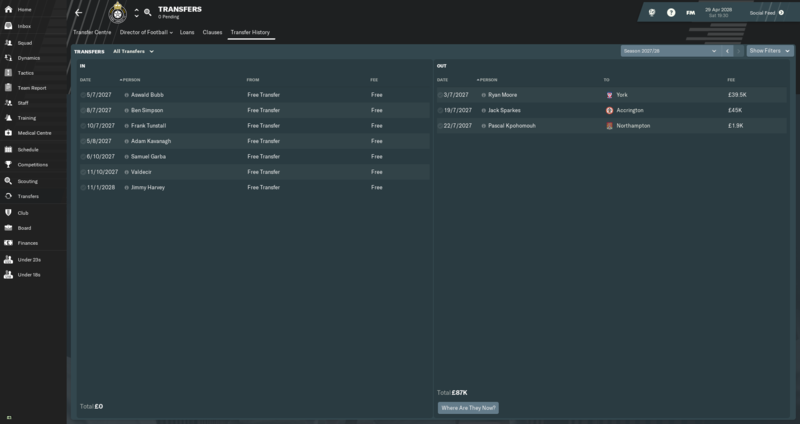 I have new faces coming in next year to add a bit extra quality and will look to find some loan players if any good ones are available on 0 wages as we are at our limit and struggling financially. Cups - Again we struggle in the FA Cup losing in our fist game. Simply not good enough and we really need to money. Not bothered about the EFL Cup and we lost to Wigan in the first game. 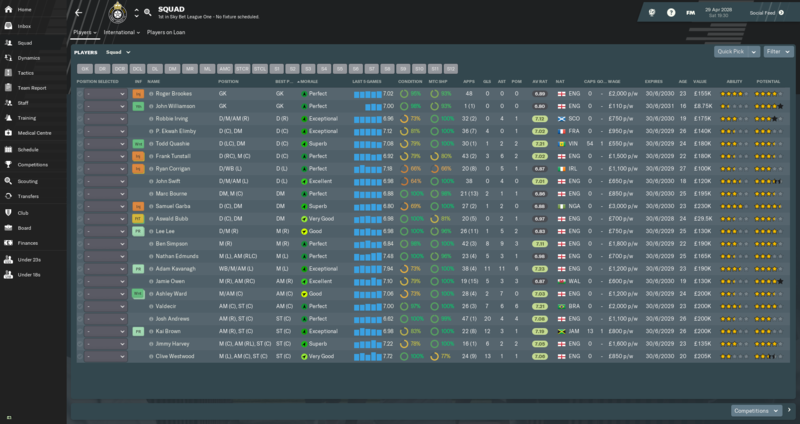 We did again have a strong showing in the EFL Trophy which is nice since I use this as a rotation to get some of our backups and young players game time. 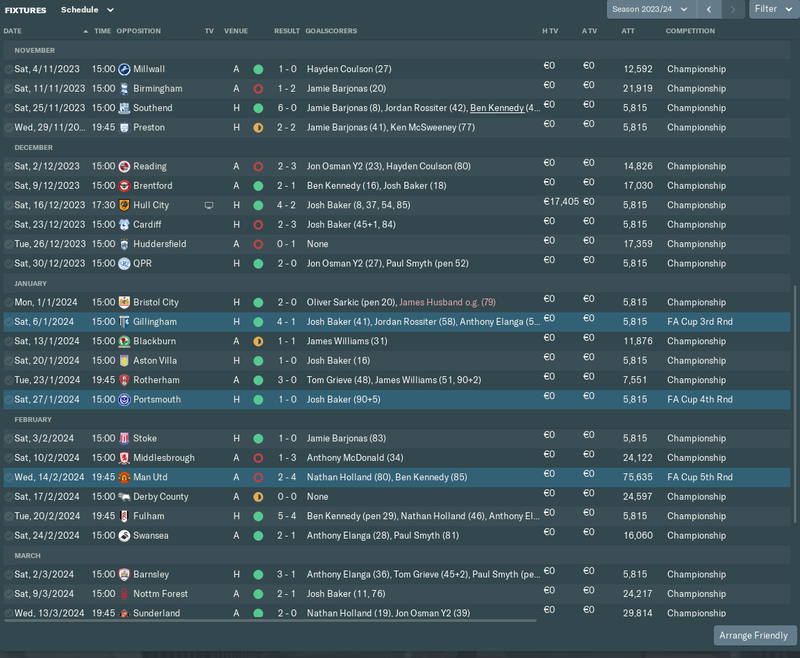 Ended up making it a round deeper this year and lost to Portsmouth on penalties. Transfers - Sold a young player who kept complaining about first team football but simply was not good enough for a decent price and got a clause in for future transfer money. 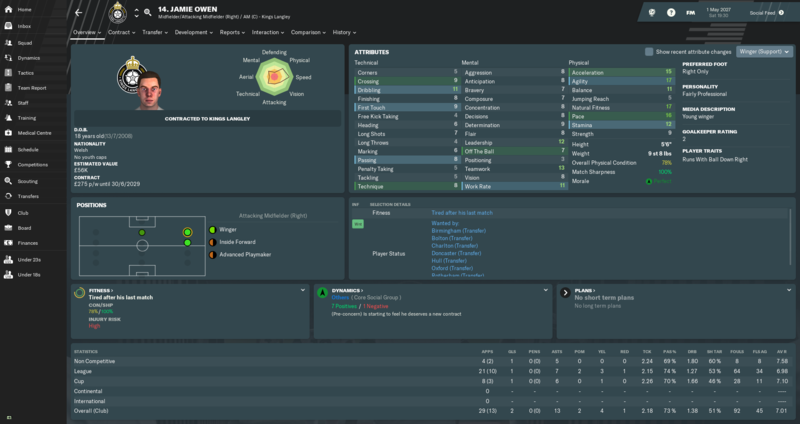 With no quality CBs available on loan or free we made a rare purchase for Rice who went straight into the starting 11 and was solid enough. We had an injury crises late January with our other CBs which saw Rice partnering with some youth players(which didn't do bad). Annerson was our starting GK and Seal and Harris also came in on loan and were starters as well. Williams came in November after failing to land a contract else where and became our number 1 striker. He was solid and is our first player to play in a World Cup! 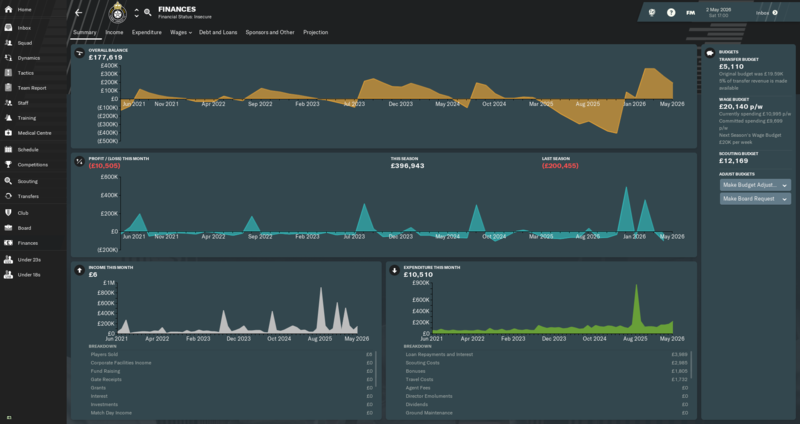 Finances - Down $400k even after the revenue from League 2 was distributed to us. Before that we were near -$900k, this next year will be tough on us financially unless we pack out or stadium, which we don't come close to and haven't had a sell out in a League game yet. we have insane season starting off very strong again. we compete for 1st place in first 10 matches and then our bad run strike us again but this season I get out off bad run by try out a lot off player I transfer in a lot off player this season and we finally bounce back into playoff zone after struggle in the middle table. Our playoff run was so intense.Firstly we beat our rival Braintree 3-2 and then we beat Wealdstone 1-0 in the extra time by super sub Rhys Kavanagh after our ace striker Kurtis Russell play so badly. In the final we fought against Maidenhead who beat us home and away in regular season and again super sub Rhys Kavanagh score and absolute drama winning goal in stoppage time earn us a surprise promotion. 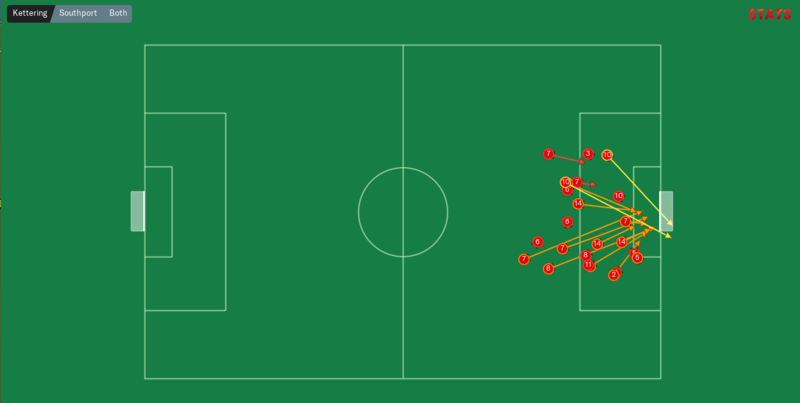 We use 4-4-1-1 Asymmetric this entire season play short passing football and dominate possession in most of the time. It was a season of unlikely yet jubilant success for Tamworth, who consistently defied the odds from the outset, and were eventually crowned champions"
The preseason odds had us marked for dead last and relegation, though considering I got almost all my targets bar two I was hopeful for nothing less than a Playoff spot. An opening day away draw against title challengers Queens Park Rangers where we more than gave a good account of ourselves and could have won by a big margin if the finishing was good gave a good indication that we had a good squad to compete for the season. The first half of the season was pretty good, as we kept good form despite losing 7 matches we still managed to hang in and kept yo-yo-ing around 2nd and 3rd place as we chased Fulham who had a strong hold over the top spot as the opened up a good lead. The match against Southend United was a memorable 6-0 win at home giving us our biggest win. 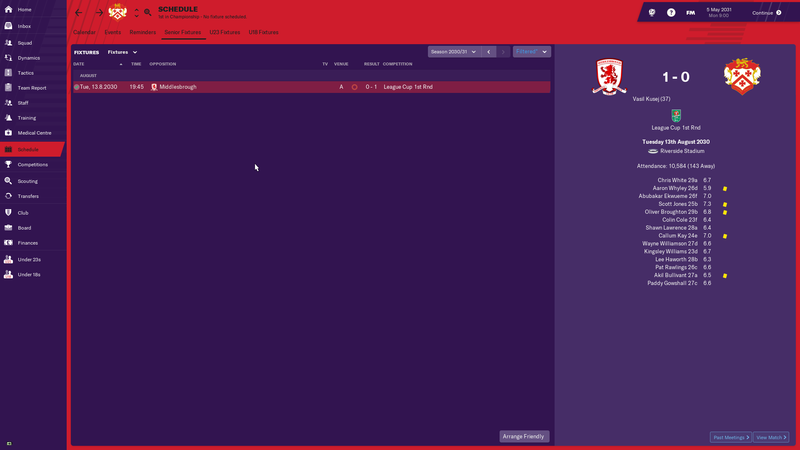 The second half of the season saw us find another gear as we lost only once away from home at Middlesbrough, we finished the match with 9 men after getting an early red card and another just before half time. Despite being outnumbered we still controlled the match and could have earned a draw if not for a debatable penalty and the goals they scored from set-pieces ending the match 1-3. The home match against Fulham was one for the ages as both teams played with abandon scoring freely in a match that ended with us winning 5-4. 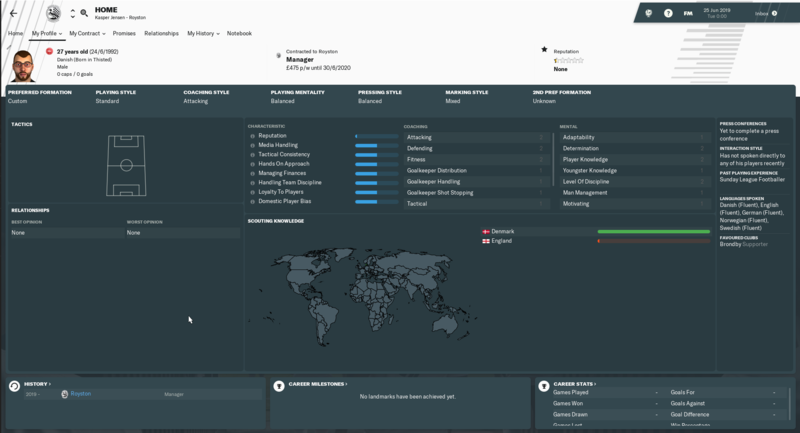 By April, we had made the 2nd spot firmly ours as Queens Park Rangers had a horrendous month of March as they dropped off before recovering in April to get back into the title battle. Heading into the final weeks, we had a 6 point lead over Fulham who had a game in hand on us but had to face a resurgent Queens Park Rangers, who themselves had a tough run to the season end with both teams facing in the final match. With us being in imperious form having not lost since 1-3 loss at Riverside Stadium and an easier set of matches we would be crowned champions as long as we won them all which we did with ease. Luck of the draw saw us line up against League two team title challengers Gillingham and League One title challengers Portsmouth winning both the games at home with ease. The fifth round saw us visit Premier League title challengers Manchester United we were expected to get beat by a huge margin and were on track to do so before ten minutes of crazy play at the end saw us score 2 goals in quick succession earning us a credible 4-2 loss. The Carabao Cup for us was a series of penalty shoot-outs as we finished all three matches 1-1 draws needing the lottery of Penalty to decide the winner. 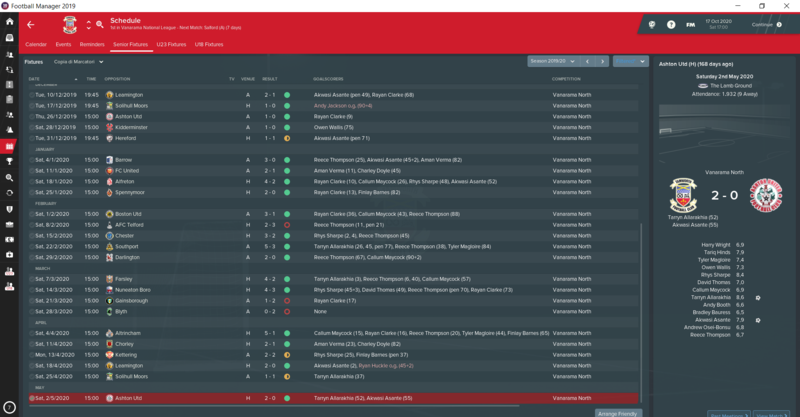 We beat League Two Crawley Town 3-2 on penalties in first round before facing Championship side Norwich City in the second round finishing the shoot-out as 5-4 winners. The third round match was away against Premier League team Watford and we were knocked out of the competition on 5-4 penalty shoot-out loss. 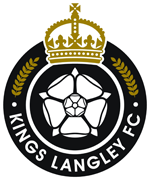 George Legg and Josh Vickers were a competent goalkeeping unit keeping 18 clean sheets in total giving us a much better upgrade over the previous unit. The arrival of Deen Pirbhai gave rise to a new defensive partnership with Jordan McGhee with both the pacey defenders allowing me to play a high defensive line. Neco Williams gave us an attacking full-back and while performing his defensive duties admirably managed to get 8 assists from the deep. Shane Burke as the left full-back was deployed more in a more defensive position and performed great as he had won more tackles than the next two highest combined. As the squad started taking shape according to the DNA I am trying to build, it was vital the midfield duo were able to open up play and allow us better possession as well recycled the ball quickly. Our inspirational captain Jordan Rossiter was a vital cog in the machine as a box to box midfielder he helped us get an upper hand in the matches in many matches. In the final third of the pitch, Josh Baker was an unstoppable machine as he scored 26 goals and probably would have crossed 30 if I had him set as my primary penalty-taker. 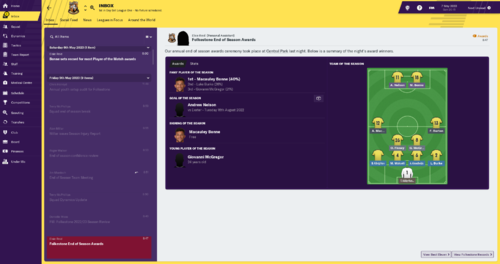 No other player crossed double digits in goals or assists, yet we ended the season with a goal tally of 90 in the league, out of which about 40 were scored by the strikers so an astonishing 50 goals were scored by the rest of the squad. This season more than any other for me has been one where I can't identify one single player baring Baker and is an evidence that finally we are getting there where the squad as a whole is able to push rather than be dependent on one single player or maybe I misreading it and probably the rest all were average while we rode our luck! Josh Vickers and Josh Baker were selected in the Championship Team of the Year, with Josh Baker missing out on the Championship Top Goalscorer Award by a whisker finishing second. No other player apart from Jon Osman featured in the first team squad. He was not yet ready for the level of football that the championship offers but our inability to get a strong Left-wing player turned out to be good for him as he got to play 22(1) games ending the season with 6 goals and 2 assists as he made great progress. However, a minor injury in November and then a few weeks out injured in January put the brakes on his progress as he did not feature much in the second half of the season. Yours truly won the Championship Manager of the Year. Finally, the board has finalised the location of the new stadium and construction of the new Tamworth Stadium begins to be finished in two years. Disappointed they did not name it after me, their only legend rather going for a generic name. While the new stadium is being built we will move to the 30,000 seater Trillion Trophy Stadium which should bring us good matchday income. 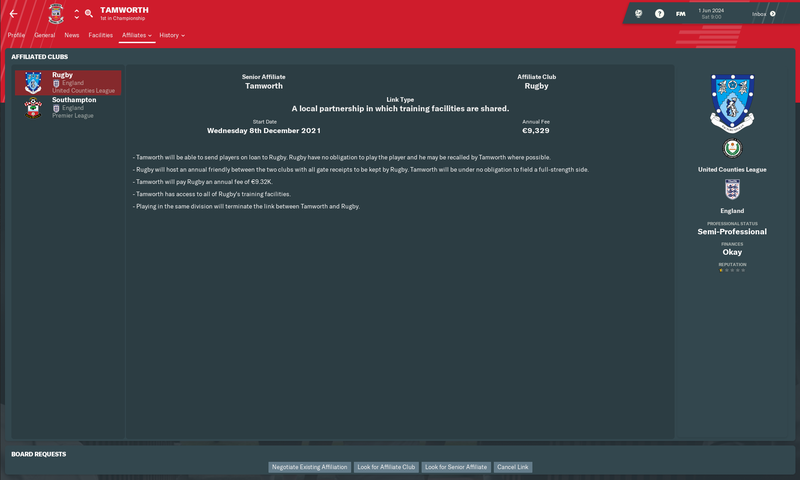 The club went through a few failed takeovers before we got a new owner and I am hopeful I will have a better relationship with the new owner. We also got a cash injection of 24.5 Million euros to cover for the stadium building cost I assume. Next season I am positive of being able to get in quality players which will help us stay far away from a relegation battle and hopefully secure a mid-table finish with ease. Manager favourite Reading FC had an indifferent first half which saw them lingering in mid-table spots earning their manager the sack in November. The hot favourite to take over them was yours truly but had to decline the interview. Their second-half form found them quickly climbing into the playoff spots before finishing the season in 6th place. They finally broke their playoff curse as they won the playoff final winning promotion to Premier League. Liverpool, Real Madrid, Paris SG, Napoli, Bayern Munich, FC Porto, PSV Eindhoven, KAA Gent won their respective leagues. Tottenham Hotspurs won the UEFA Champions League and Borussia Monchengladbach winning the UEFA Europa League. India is ranked 92nd in the world. 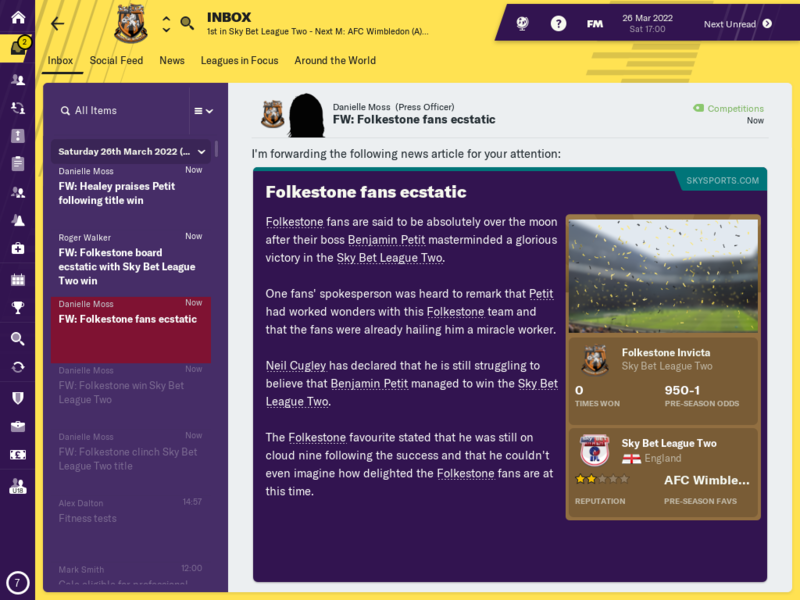 Just got my first win as Royston manager. Won the 5th league game. Finding this more difficult than any previous tries. Can't seem to find players good enough for the league. 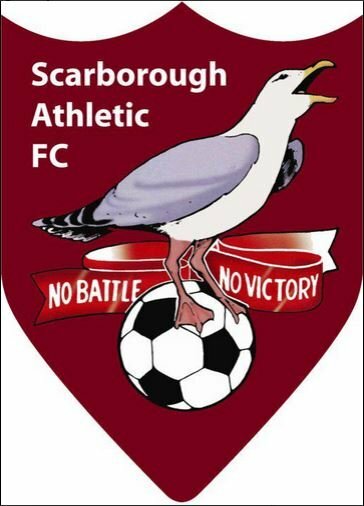 And one thing I have noticed is free kicks in either side outside the box tends to go in atm..
"Scarborough had been expected to be relegation certainties heading into the season and although that was the case, they will be delighted to have finished with their heads above water. Despite getting off to a good start and rising as high as 2nd at one point, The Seadogs weren't able to keep it going, and they eventually found themselves embroiled in a predictable relegation scrap." Compared to last season, this season was an absolute nightmare. I was hoping to build on last season but we regressed massively for some reason, and it all had started so well. By match day 8, we were in 2nd place, and even though we suffered a little dip in form after that, we were looking good in 4th place after Match 14. 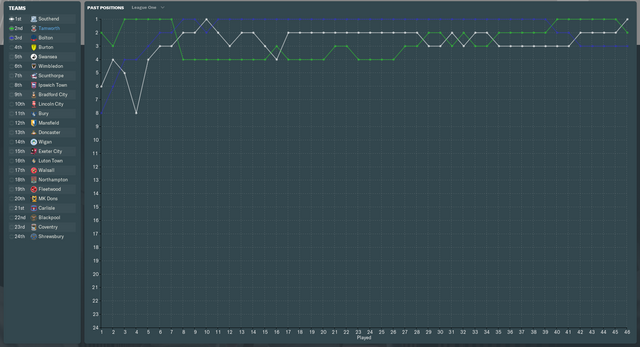 Then, the tactic I was using at that point (the same one I had used last season) suddenly stopped working. From the 28/11/2020 to the 6/2/2021, this was our record in all competitions: 0 wins, 5 draws, 6 losses. We finally beat Blyth 2-1 on the 13/2/2021, but by that point, we had dropped to 15th place, and we were well and truly stuck in a relegation battle. After various changes in tactics, the one I've posted above was the one I settled on, and it gave us the results we needed to stay up. We flopped in the cups again; a 2-0 defeat in the FA Trophy away to a strong Hereford was understandable, but a 1-0 defeat at home to Worcester (who play in the Southern Premier Central) was unacceptable. Our moment of the season was a 5-0 victory at home to Kidderminster (who had a poor season, finishing in 11th), while our moment to forget was a 5-1 defeat away to Southport on the final day of the season, but we were safe at this point, and could finish no higher or lower, so I didn't mind too much. A massive factor in the spectacular drop in form was an injury to Michael Coulson, our hero of last season; he ended up missing 26% of the season, and scored just 7 goals in the league, compared to 29 last season. The injury has really taken its toll on him; he's now only rated as a leading player for most Regional Premier Division sides. Another issue I had was strikers not scoring; Nathan Blissett, the beast of a man standing at nearly 2m tall and weighing it at 89kg, started the season well, but the goals soon dried up and his 7th and last league goal for the club came in a 3-1 win vs Stalybridge Celtic on the 21/11/2020. Florian Yonsian and Harvey Saunders both flattered to deceive, and in my desperation, I turned to Harry Hammett; despite him having a finishing of 13, he was overall the worst striker in the 1st team. However, he well and truly defied expectations by scoring an impressive 8 goals in 13 matches, and was pivotal in keeping us up, so much to the point I'm really considering going into next season with him leading the line. Another huge factor in the downturn in form was the departure of Will Annan. He was out of contract from last season, wouldn't sign a new contract, and left at the start of September, severely weakening us on the wings. 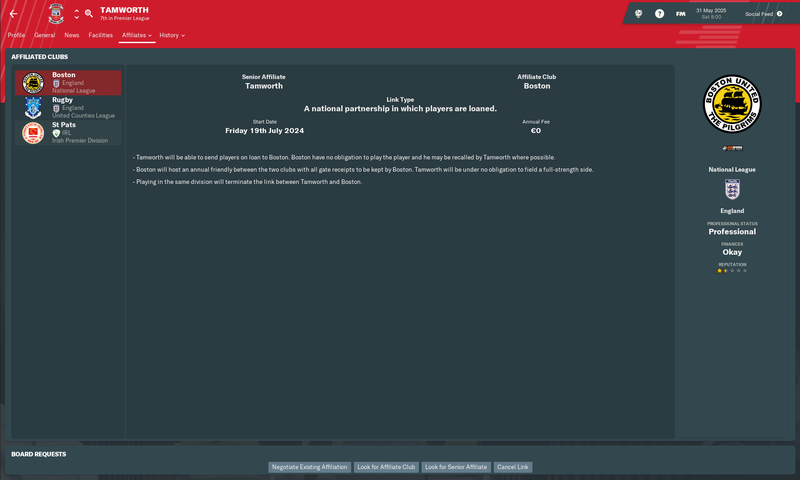 I have since tried to sign him back, but despite us having a close relationship and him having a high level of respect for me, he has no interest in returning due to the "acrimonious circumstances surrounding my departure" (you refused to sign a new contract and left us when we needed you but sure, it's my fault ). For now, he's still a free agent, so I'm keeping an eye on him, but knowing my luck, he'll probably retire at the end of the season. Our best performers this season were Harry Hammett, George Hughes, Sam Muggleton and Craig Mahon. Hammett's influence has already been mentioned. George Hughes was a player I mentioned in my last review as one to keep an eye on, and he has really blossomed this season; he finished as our highest scorer with 13 league goals and he is our vice captain. A technically gifted midfielder, who scored some belters from long range, he'll definitely be in our midfield for the next few seasons. I'm training him to play as an attacking midfielder for next season; hopefully he will contribute more goals that way. 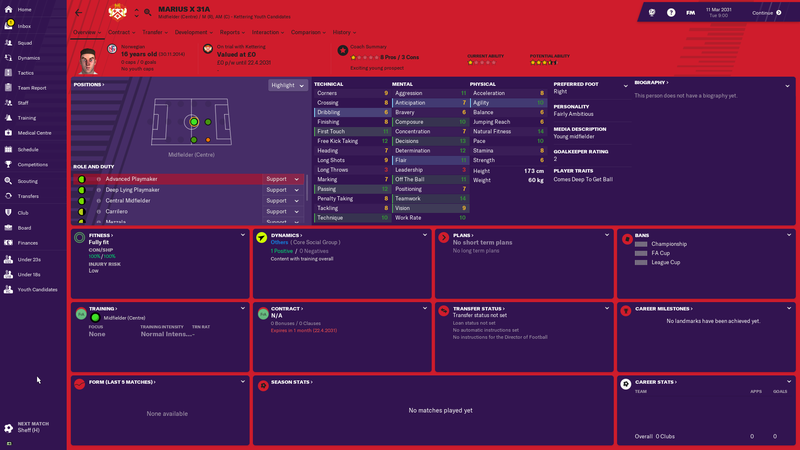 I signed Muggleton from Spennymoor for a fee of €5,000 (a record for the club) to sort out one of the troublesome full back positions, and he did a fantastic job, as he is just such a well rounded player, with his Penalty Taking of 3 his only blemish. What was hugely beneficial was his Long Throws of 20, which I didn't notice when I initially signed him; this led to us becoming deadly from throw ins, with a significant amount of our goals (and noticeably, Hughes' goals) coming from throw ins. He was also quite good at free kick deliveries, scoring directly on 2 or 3 occasions, while assisting a few more. Craig Mahon was signed as a free agent on non-contract terms in January as I was looking for a quality winger at a relatively cheap price, and while he wasn't what I was exactly looking for, he chipped in with 5 goals in 18 appearances, which was a obviously a huge help given our goalscoring issues. In my last review, I mentioned George Hughes, Mitchell Glover, Harvey Saunders and Jozef Pastorek as players I was hoping would impact this season. Unfortunately, Hughes was the only one who impressed me; Glover scored just one goal and assisted one other in 18 appearances, and was otherwise inconspicuous when he did play. Saunders' form was in the same boat, he finished with 5 goals in 13 appearances, with 3 of those coming in a 5-3 win against Hereford. 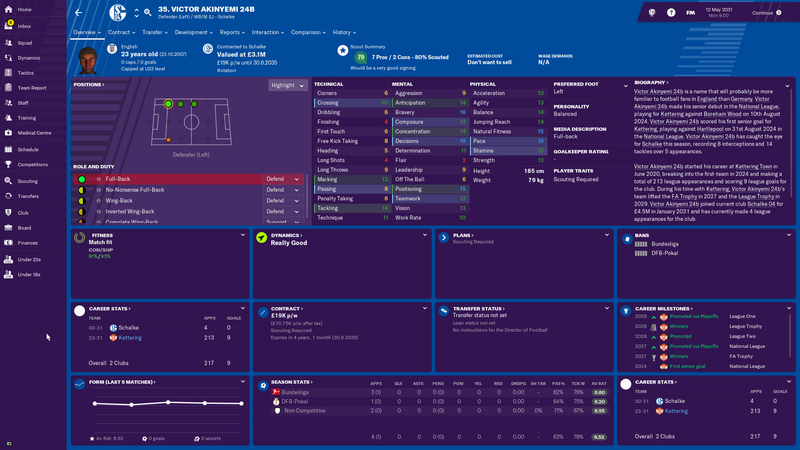 The issue with Pastorek is his lack of versatility; he can only play as a left midfielder, and I've tried training him in other positions with no luck so far. 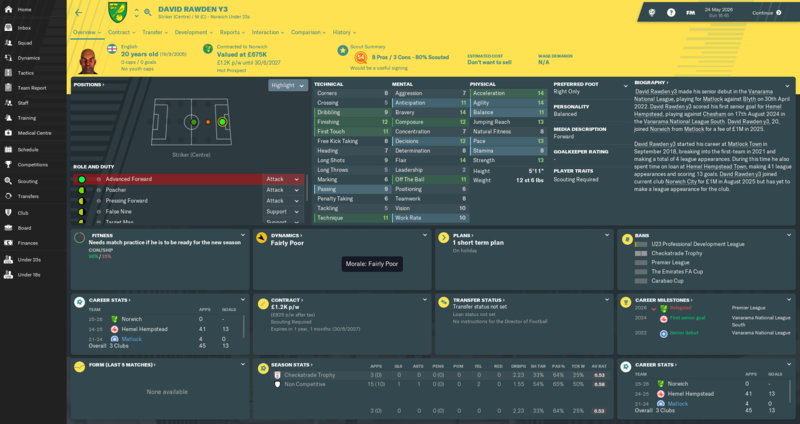 He's still a very good player in terms of his technical ability though, so I'm going to persevere with him; Corners of 12, Crossing of 14, Dribbling of 12 and Technique of 11 don't come along too often at this level! 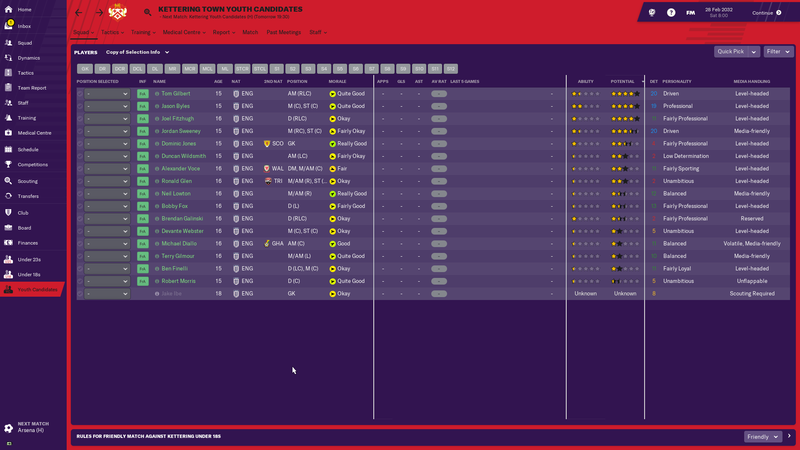 Willis, Patterson, Muggleton, Thacker and Adamson formed my new defence for the season and performed solidly for the most part, with Adamson now the best player at the club. Mahon performed well when he came in, while Ronan was a loan signing from Bury, who I'm considering signing permanently as his contract with Bury is up at the end of the season. Blissett and Best performed well in spurts, but were otherwise underwhelming. Wood ended up only making 3 appearances, while Cockerline, despite being a striker, didn't score once. I'll more than likely be releasing these four. Khius Metz was an odd one. I didn't expect too much from him to be honest, his only good traits are his acceleration, agility, natural fitness and pace of 14, 12, 11 and 17 respectively, with a Dribbling of 12 being fairly noticeable also. 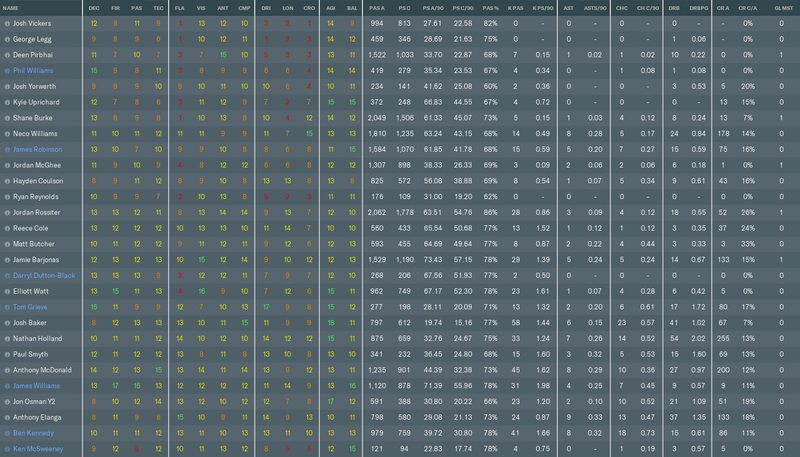 Outside of that, he's a shocking footballer even for this level, with most of his other attributes being 5 or below. Despite this, I feel like his pace offers us something different, so I'm going to monitor his progress over the next season or two. As for outgoing transfers, the departure of Will Annan was the only one of note, the rest of the outgoing players weren't missed. Sort out the goalscoring issues. 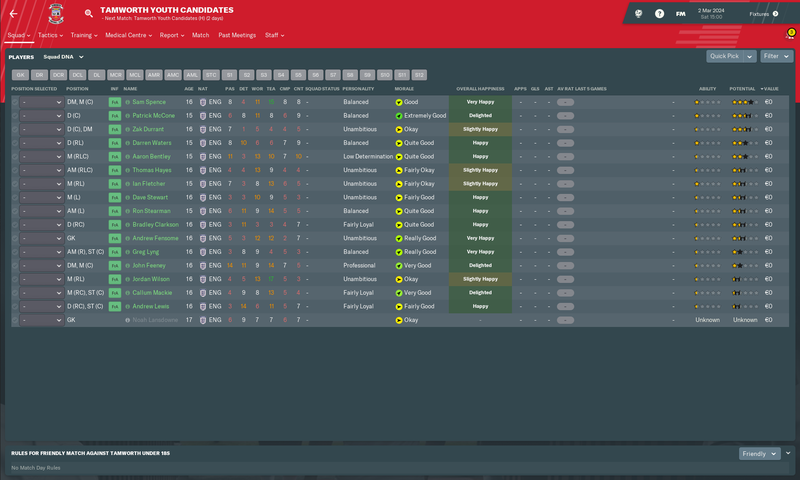 Hammett is looking likely to be my 1st choice striker, but I've my eye on a few others. Add some quality wingers to the squad. I've a few on trial at the moment, and I'm closely following a few others whose contracts are running out. Do better in the cups this season; our finances aren't looking healthy, so a decent run in the FA Cup would be welcome. Avoid getting drawn into a relegation battle. "Tamworth had been expected to struggle for much of the season and find themselves entrenched at the bottom of the standings but fared much better than many would have thought possible and secured an unlikely continental qualification spot. 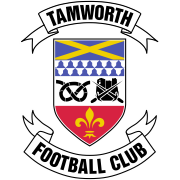 Tamworth were one of the competition's surprise package, consistently defying expectations and, owing largely to an impressive spell of form between December and January that saw them rise to 9th, were able to celebrate a successful campaign." 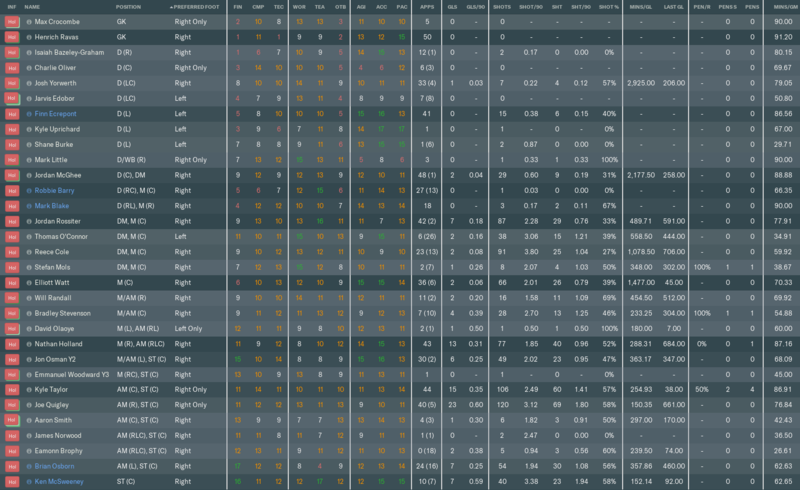 The preseason odds had us marked for last place finish but with a pretty successful transfer window I was confident of not being any near the relegation spots and aimed for a mid-table finish. The opening month saw us face 3 title contender teams which we expected to lose but we got a real beating and the drop in morale meant we lost matches which we could have won. We won only one match in the first two months against Sheffield United with literally the last kick of the match from a quick counter neither did we do any better in October or November. December saw our form get much better as we registered 4 wins one of which was against Arsenal,1 draw and 1 loss including a highly entertaining 6-3 win against Reading FC. The second half of the season we fared much better as the good form in December saw us grow in confidence and morale as we were able to limit our losses to 4 matches and drawing 2 matches on our way to winning 10 matches. One such win came away from home at reigning European Champions Tottenham Hotspurs as we dominated them all match and outplayed them in all areas. We finished the match 3-5 winner thanks to a superb hat-trick by Josh Baker. Considering we were marked for Relegation and I myself had at best mid-table finish aim, considering we finished 7th above Arsenal and just 4 points more could have seen us finish in 5th. has to count for me one of the best seasons despite not winning anything like previous seasons and we rightly tagged Overachievers of the league. We had a dream run in the FA Cup as we narrowly missed out on a visit to Wembley for the final. We struggled on our way to 1-0 win in the 3rd round, we needed a replay in the 4th round against Nottingham Forest and even then we could not get the job done as we needed extra time goal to get to the next round. 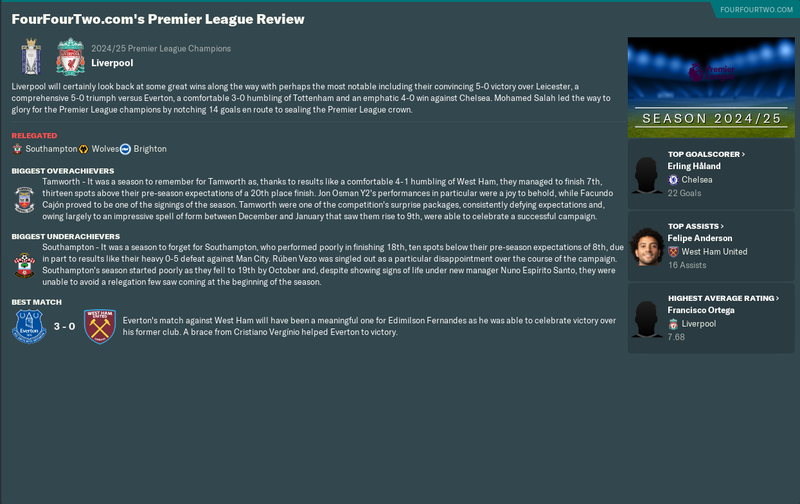 The fifth round saw us line up against Premier League relegation candidate Brighton & Hove Albion and we were on our way to a one-goal win before getting pegged back in the last 15 minutes of the match requiring penalty shootout to progress to the next round rightly getting revenge on them for knocking us out of the Carabao Cup. 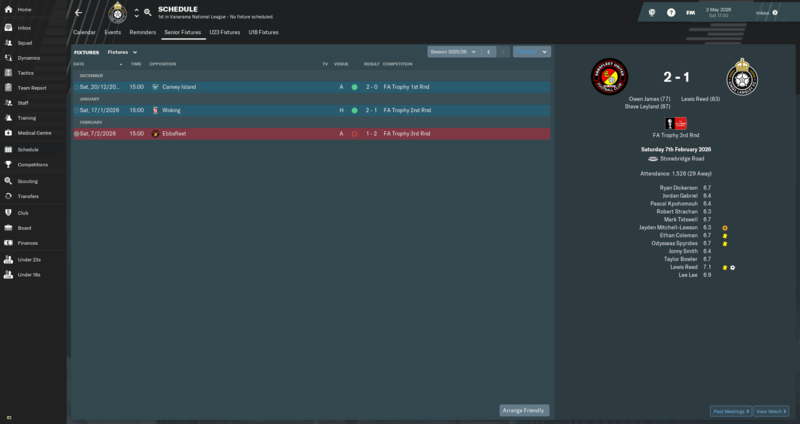 The next round was at home against European Champions Tottenham Hotspurs and we finished the match 4-4 before winning it through penalty shootout. The Semi-Final match against Chelsea we were 2 up after 35 minutes going into half-time leading 2-1. They came out all cylinders firing in the second half as they sneak ahead before we pulled them back to finish the 90 minutes at 3-3. The extra-time saw my defence take leave from the match as we shipped 3 goals to lose the match 3-6. In one of the most disappointing EFL Cup campaign, we were knocked out in Second round by fellow Premier League relegation candidate Brighton & Hove Albion. We lost 4-1 away from home, however, it would have been a different result if the match had not come during our worst month and form as we were low on morale, considering how we did in the FA Cup the right draw could have seen us go all the way here as well. We would have fared much better if we had not shipped as many goals as we scored in the league. Josh Baker and Jon Osman were without a doubt our two best players as without them we would have fared miserably this season with both of them leading the club scoring charts and Osman even topping the Assist list. Daniel Bentley struggled to give me any hope that he can stand like a rock even if my defensive wall failed and every time they failed he failed, which means we might need a better replacement. Facundo Cajón was brought in January with an eye on the future and performed admirably but did not really make the position his own. Neco Williams continued his form from last season as he came second in the assists list but did not find any consistency as he was rotated with James Robinson who while strong defensively did not quite offer the same sort of option. The central defence saw a new partnership form between Martin Kraus and Milan Nikitovic while both were equally competent in all areas however Kraus did not have the consistency in his performance and Nikitovic stood out almost all matches even where the defence disappeared. Club Captain Jordan Rossiter after serving admirably for 3 seasons lost his place to newcomers David Nicolas and Claudio Gomes. Every match that our midfield duo bossed saw us come up with a favourable result as they were all over the pitch helping defensively as well as slicing open oppositions. No player was able to make the attacking midfield position his own before Alejandro García was bought in January who immediately made a world of difference to our play and result in us having a much better second half. Josh Baker missed out on the Premier League Top Goalscorer Award by a whisker finishing second. No other player apart from Jon Osman featured in the first-team squad. While his performance last season gave me hope I was going to use him as a rotational option on Left Wing, however, Osman successfully kept his place as he featured in 25(2) games scoring 12 goals and assisting 8. 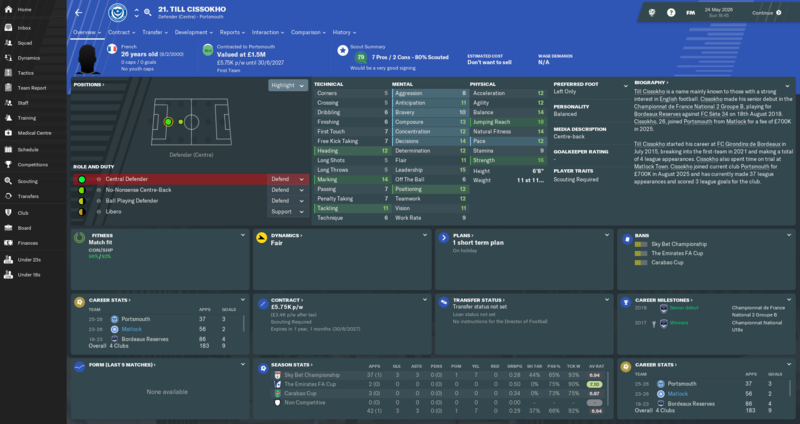 He was certainly one of my top contender for player of the season. Emmanuel Woodward and Samuel Mohammed are developing really well and getting close to jumping to the first team squad, next season might be too early for them but I can see one of them breaking into the team by year end if not on loan. Yours truly won the Premier League Manager of the Year and also complete 300 games in my career. 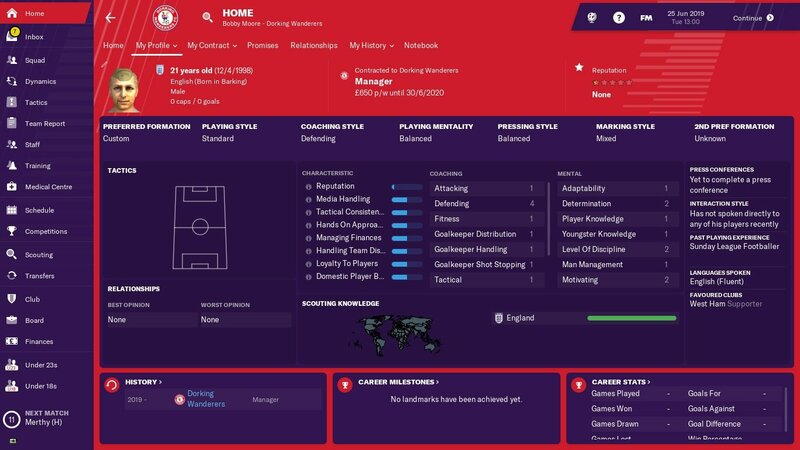 My career record at the end of the season is 327 games played with 208 wins, 57 draws and 62 lost giving an impressive 63% win record as we climbed the leagues. 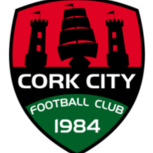 Next season the aim is to build on this year's performance and try to push for a Europa League qualification. In terms of squad building, I am looking at getting at least 1 world class striker preferably English as I have my eye on a young striker at Fulham. 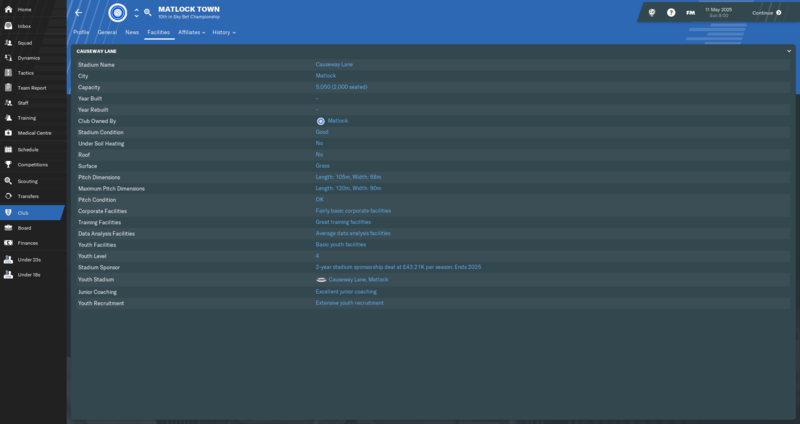 Since with continental qualification the aim I need to build a squad with sufficient Home Grown players. While at the same time I am hoping to add at least 1 quality player across the board in defence, central midfield and attacking midfield. We have made a cheeky offer to free transfer Eden Hazard and as of right now we are the only team trying to sign him, getting him would be a coup. Manager favourite Reading FC lost their manager just before the start of the season to Ajax and the new manager found the initial months difficult as they could manage only 2 wins in the first half of the season as they were rock bottom till early January. 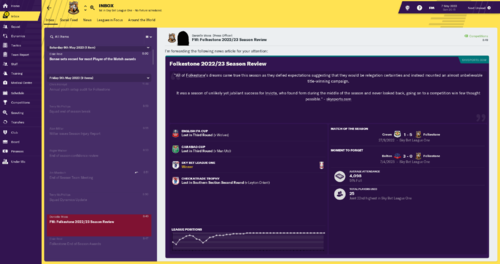 A much better second half of the season saw them slowly reel in fellow relegation candidates and finish the season a credible 15, dropping two places on the last day. Liverpool, Real Madrid, Olympique de Marseille, FC Internazionale Milano, FC Bayern München, FC Porto, AFC Ajax, RSC Anderlecht won their respective leagues. FC Bayern München won the UEFA Champions League and Arsenal winning the UEFA Europa League. India is ranked 89th in the world. Oh, and I almost forgot. In December we sold another couple of important players. 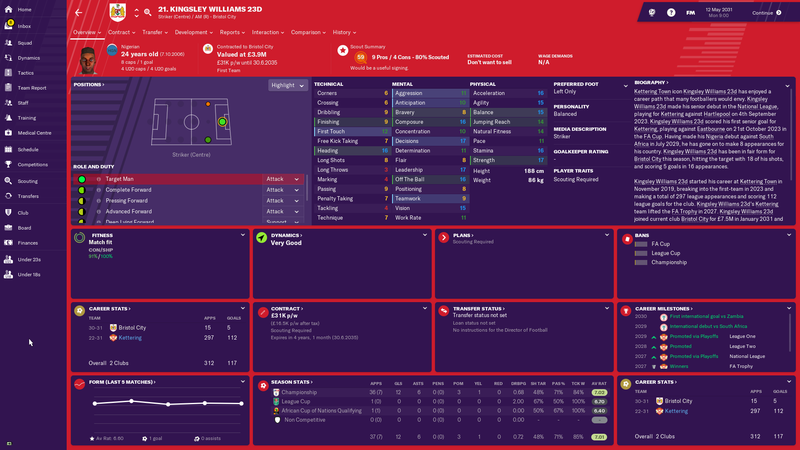 Kingsley Williams 23d were sold to Bristol City for £7.5M + clauses, Robbie Healy 23e were sold to Leeds for £4.8M + clauses and Victor Akinyemi 24b were sold to Schalke for £4.5M + clauses. 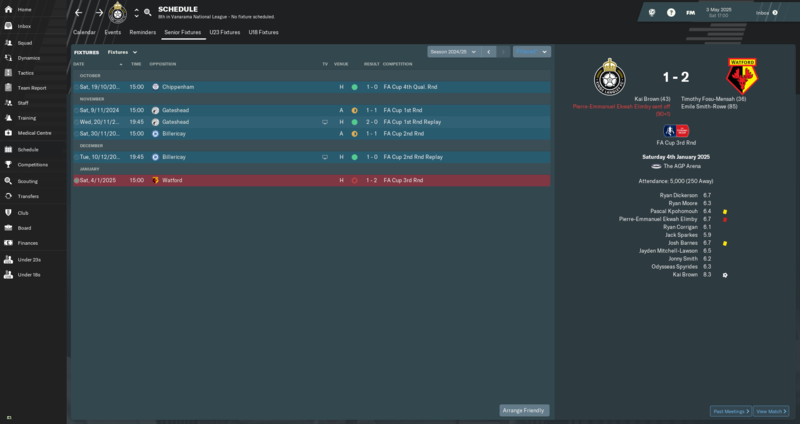 In the FA Cup we lost in the 3rd round to Brentford. In the League cup we lost away to Middlesbrough in the 1st round. 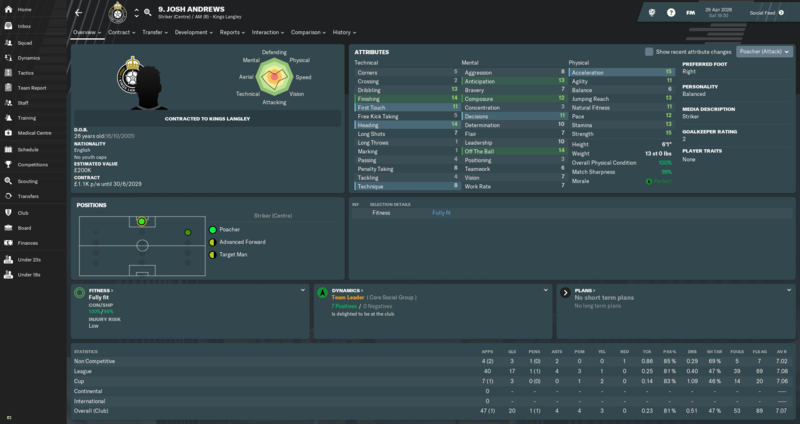 We had a decent youth intake, but I did get a son. And a decent one at that in Marius 31a. 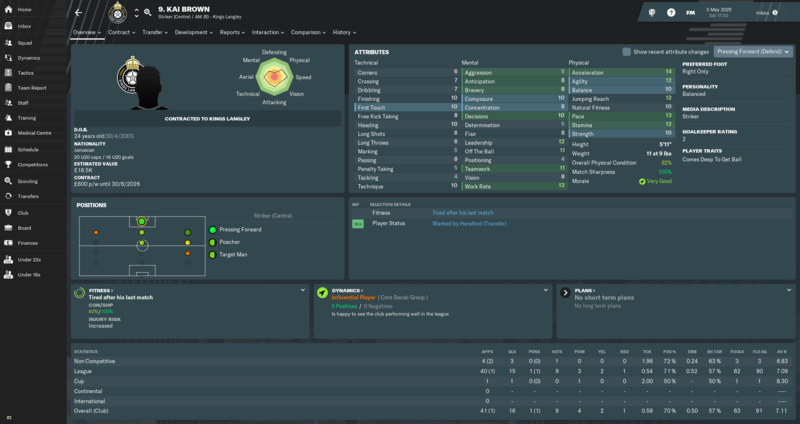 I've already given him his debut and he will continue to feature in the main squad as often as possible. I hope to nurture him into a great midfielder. 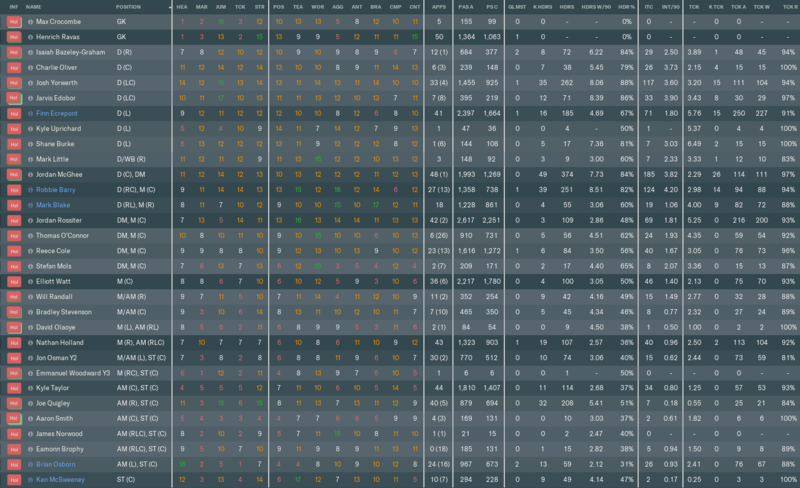 The fun part is that his positions are the ones I actually played when I were active in real life. 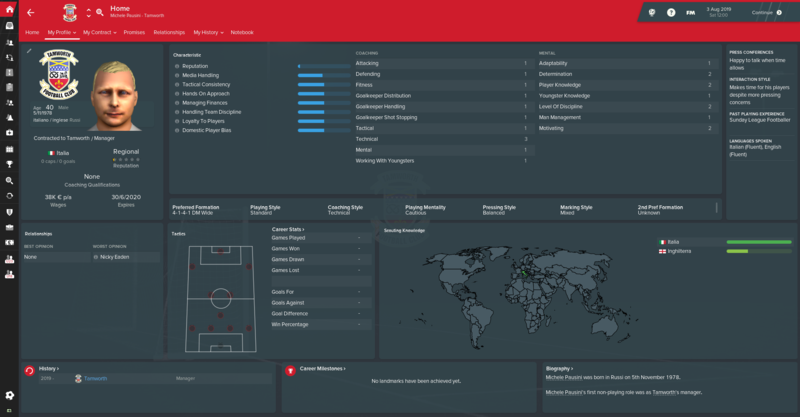 Though I didn't father a son in 2014 as far as I know, FM have gotten this alternative reality quite on point here. Almost eerie. Aaaaaand relegated... Worst try ever at this challenge..
A different season compared to the others. The first season where we were hit with mutiple injuries, some rather long and unfortunately for Yann Song'o it was also a career ending injury. These injuries forced us to make quite a few transfers that wasn't planned for. Some worked out good, and some as subs at best. We did happen to have the best goal scorers and best defense over the season. With 6 games to go, we were comfortably sitting 3rd and hoping for automatic promotion, which was a tad higher than the medias 9th prediction. With 3 losses, 1 draw and only 2 wins we ended in 5th place and went to the playoffs. In two poor games we were fortunate beat Stevenage 1-0 away and drew 0-0 at home - sending us to Wembley, where Doncaster waited. 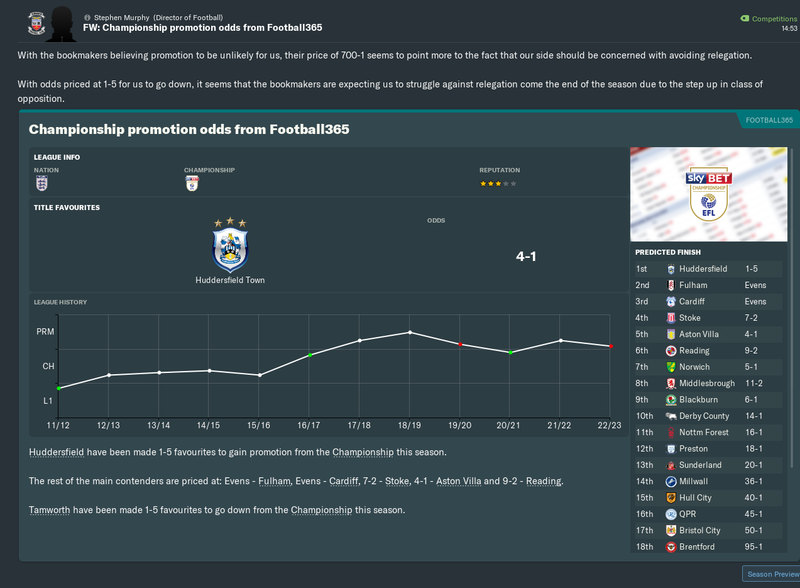 They were so busy trying to beat us with fouls, but we managed to get away with a 1-0 win and thus gaining promotion to League One. It was higher than expected for sure, but with our outstanding defense and and amazing keeper the team stats really tells the story. We had a good cup run all in all - In the FA Cup we went on to the 4th round and had a great draw of Chelsea away. Only loosing 2-0 in this game was a particular highlight. 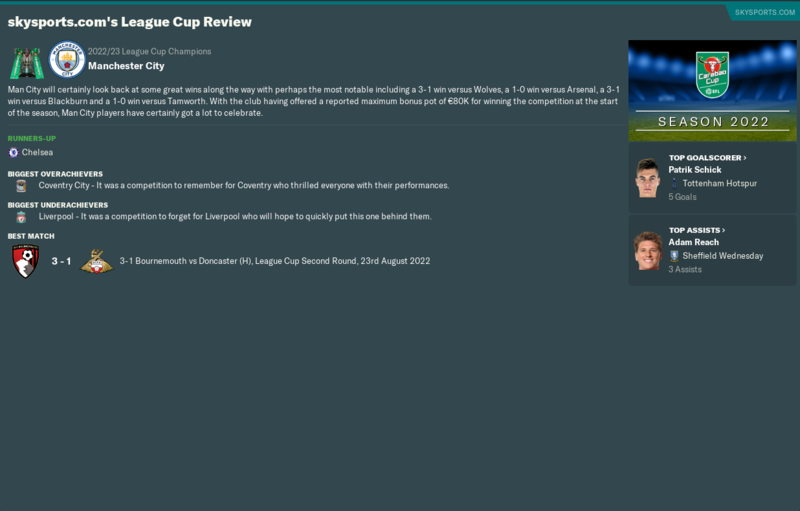 In the Carabao Cup we only got to the second round where we lost 2-0 away to Lincoln. 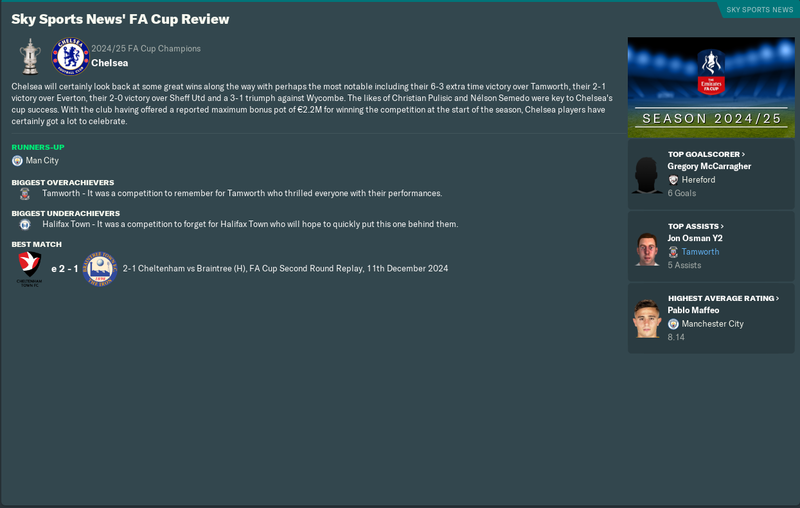 The Checkatrade was the seasons cup highlight going all the way to the semi finals where Portsmouth proved too strong and we lost 1-0 at home. Adam Maguire (GK) Had an amazing season and luckily for us no injuries. He managed a total of 29 clean sheets and beating the League Two record in the process. 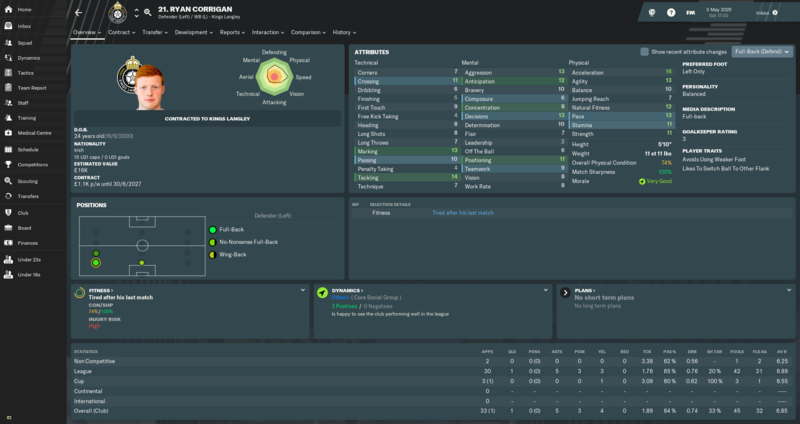 Quite a few clubs are after him and I am really happy he agreed to sign a new contract. It can only be a matter of time, before the board accepts an offer on him. Ricky Smith (AML) Free transfer from Wolves looks really interesting stats wise, and have great hopes for him. Robbie Fitzpatrick (AML/SC) Was our super sub this season with a great 16 goals and 8 assists. Alex Gilbert (SC) Had his first semi bad season. This due to injuries and to the fact I often went with a 4-3-2-1 formation, where he attacking counterpart just played a little better. Owen Gallacher (SC) Turned out the become our topscorer this season with 27 goals in 43 games. A secondary "highlight" was the stadium being upgraded to an amazing 6100 cap! Pretty amazing season really, struggled to get anyone in in the break, ended up grabbing a few decent freebies in the run in to Christmas and just went for it in a full-on attacking, high pressing kamikaze sense with a 343 system or occasionally a 424. Spent the whole season playing at some strange ground in Sittingbourne while the club is searching for a site for our new ground. 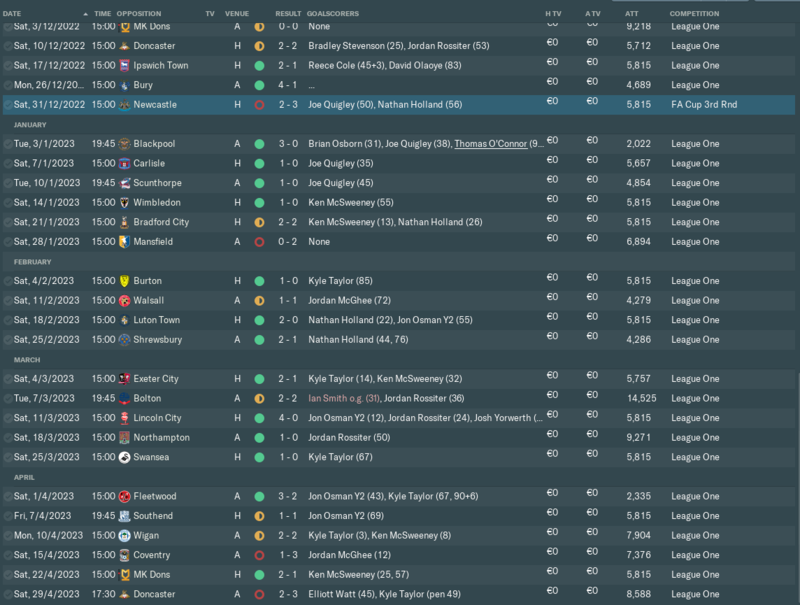 Finances have been pretty poor and despite a decent FA cup run and selling our best player mid-season i have constantly been battling with a tiny playing budget. It was weird that after we sold our best player i was told i would get 120k back in the transfer budget but no money ever materialised (maybe a bug?). 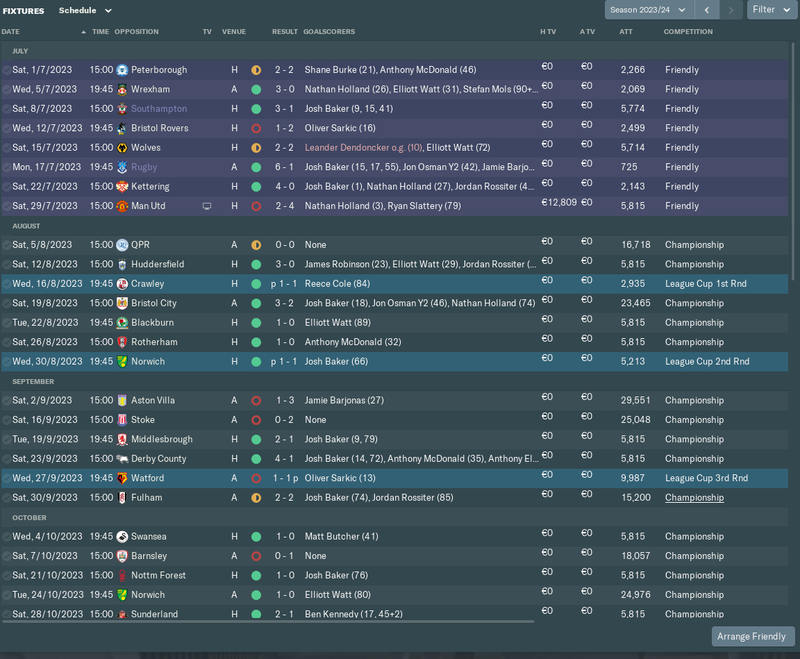 Eitherway we managed to hold it together and finish champions with plenty to spare, it seemed that no other clubs below us could put together any sort of consistent run and so we found ourselves 19pts clear at the end of March and totally uncatchable. Lets see what we can do on a shoe-string and a prayer in League 1 next year! 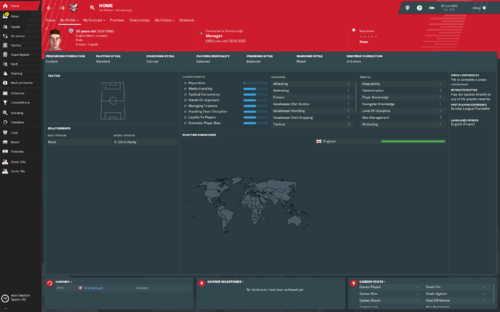 We turned professional as we entered the Football League, so this was the start of a new era for the club. League Table - we had a blip after ten games, but we regained our form and secured our second successive promotion. Checkatrade Trophy - the squad players got us through the early rounds despite losing the first two games, the first team went on and made history for the club. Carabao Cup - this cup run didn't go so well. FA Cup - the win over Everton was probably the highlight of my career, and we didn't embarrass ourselves against Spurs. Squad - we have great strength all round, so hopefully I can find a couple of players to make a difference. Transfers - the three youngsters were exceptional signings. Finances - despite the loans, we are still in debt. Josh Andrews - top scorer, but he's not really good enough for league One. Kai Brown - consistent in the supporting role. Roger Brookes - the goalie has been superb. Robbie Irving - this new signing really impressed. Jamie Owen - another impressive signing. I've signed most of the squad up to long term deals, so I'm hoping they are good enough to move up a division. Anyway onto this season . . .
As you can tell from the timings of the goals I thought we would slip to extra time and penalties for the 3rd time in our playoff run follow 10-9 penalty shoot out win in the 1st round and a 5-6 in the semi's !! 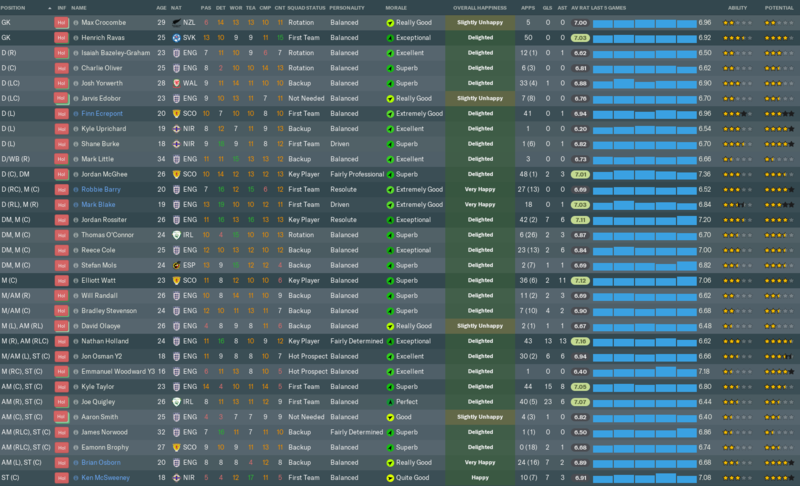 We were certainly a lot more consistent this year which probably had a lot to do with me only tinkering with a couple of downloaded tactics here and there rather than wholesale changes I made last year. Not a bad goal tally for someone who swapped between AM in a 4411 and ST in a 442 !! 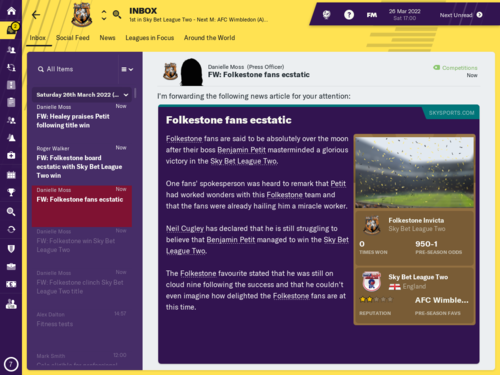 We did also make it to the FA Trophy final but I threw the game by playing only U18's as it was 3 days before the playoff final and for the last month of the season I had been battling fatigue. Bloody fixture planners. So, the Premier League huh? With a full squad of former youth players this were a major challenge, no doubt. 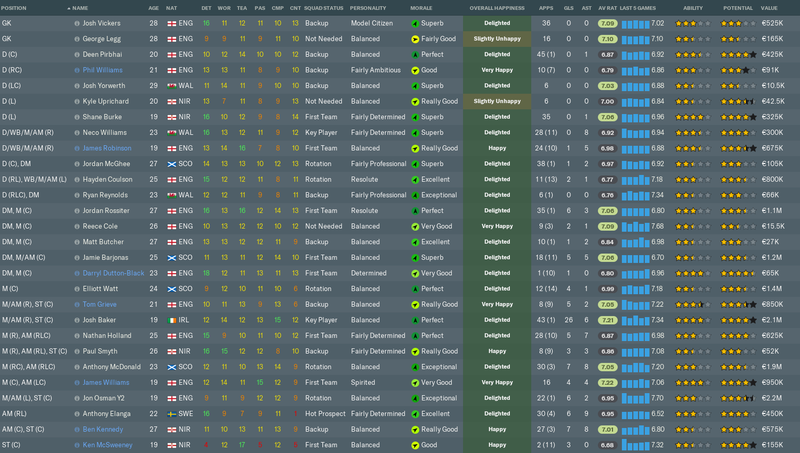 I managed to keep hold of all of the important players this season, and no one have thrown a fit about leaving. I did have to hand out quite a lot of new contracts though, but I expected as much. We are expanding the stadium to 10k, so most of the season we played at King Power Stadium in Leicester. The season started quite good though, as we won a bit and picked up more points than I expected we would. Of course we struggle quite a bit against the big teams, but we got some good results throughout the season. A win over Chelsea at Stamford Bridge, however undeserved, were a welcome encouragement for the team. So we kept our spot around mid table for the whole season, something I were more than happy with. 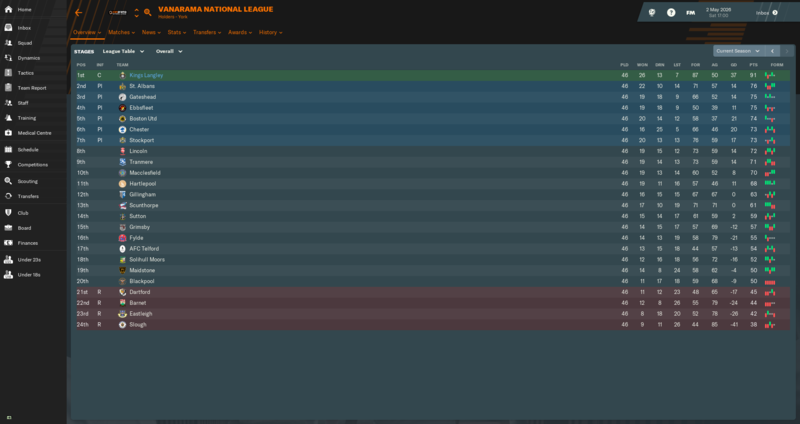 In the end we actually finished in 8th place, only a few points behind a European spot. In the FA Cup we beat Bolton, Middlesbrough and Fulham before we lost away to Man City in the 6th round. In the League cup we beat Ipswich before losing to Reading in the 2nd round. We are building another new stadium! Only 4 years after we built the Brett Solkhon Stadium we are building a new one with an unknown name as of now. And it should be done within a year! We will continue to play at King Power until the completion. 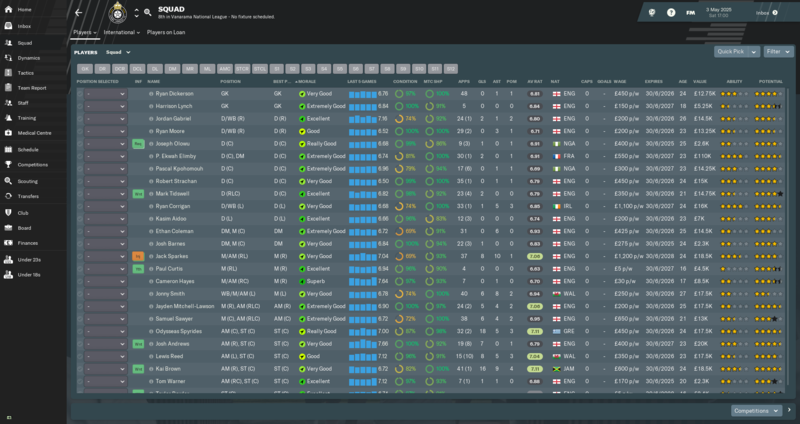 A pretty good youth intake this season. The best seems to be Jason Byles 32b. My son played a lot of games this season, but he didn't play very well. Of course he is far out of his depth at the moment, but I've always been a firm believer of trial by fire. He also played a couple of times for Norway U19s and got a single U21 cap and scored. For some reason, there wasn't the usual two lines summing up our season in the season review that pops up in the inbox at the conclusion of a season, so obviously, it won't be included in my season review. Going into this season, I strengthened the squad, particularly on the wings, but to be honest, I was expecting more of the same as last season, and so was the game: we were predicted to finish rock bottom in 22nd place. 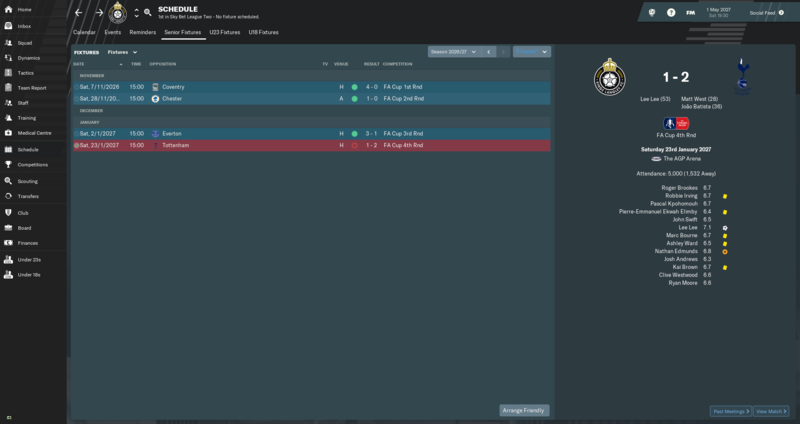 A mixed pre-season which included a 7-0 defeat at home to Newcastle (I arrange these friendlies solely for finances), we kicked off our season with an impressive 1-0 win away to Telford. This was followed up by a 4-1 win at home to Spennymoor, which led to my optimism for the season ahead increasing. 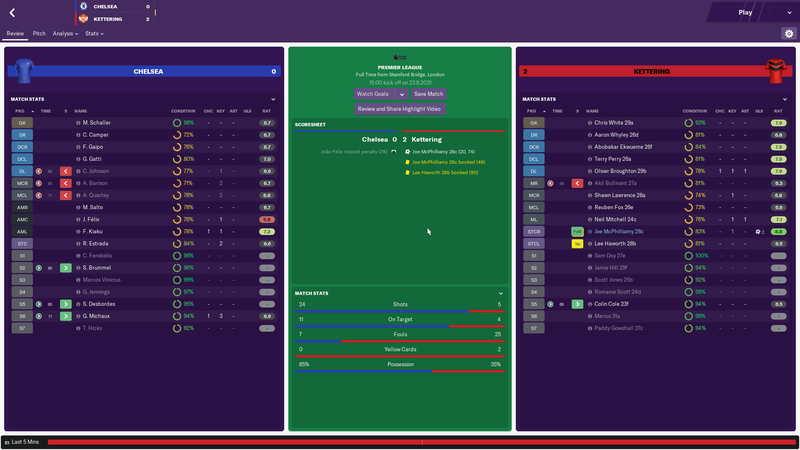 Unfortunately, this was followed up by a run where we won 1 match (a 3-1 win at home to Hereford) in 10, and this run included an extremely frustrating 1-0 defeat at home to Redditch United in the FA Cup, made all the more galling by the fact that we had our strongest side out. 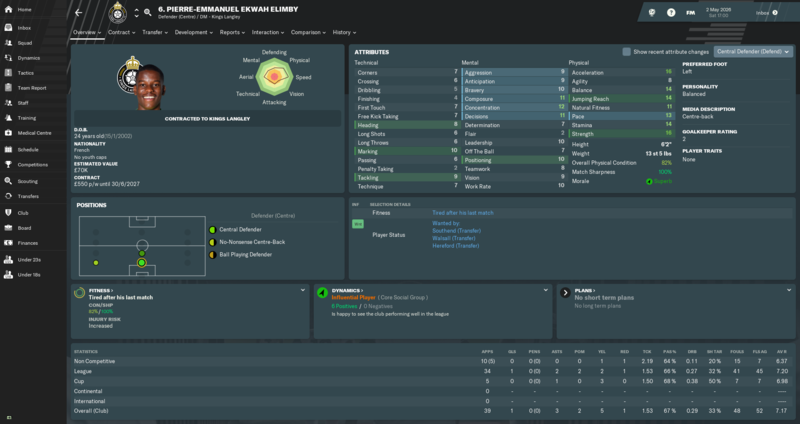 In my last season review, I said I was considering going with Harry Hammett as my first choice striker; I had to abandon this idea and sign a new striker (I eventually settled on Dan Maguire) as poor Hammett couldn't hit a cow's arse with a frying pan. 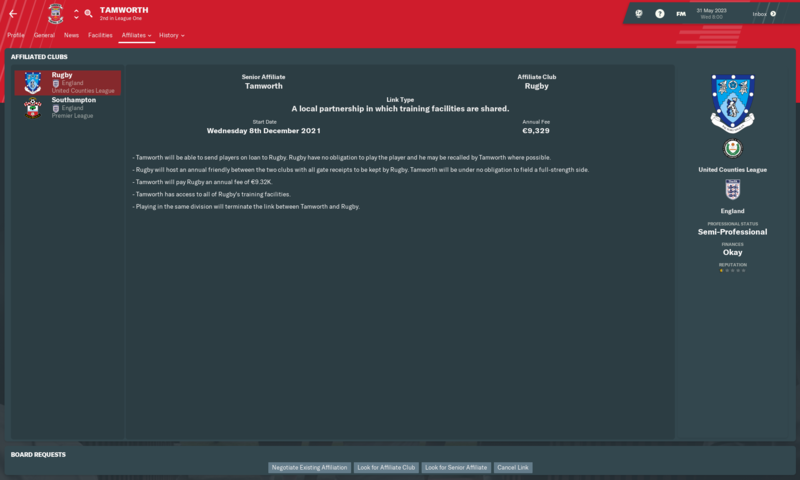 The signing of Maguire, coupled with a slight change in tactics, led to a massive change in our fortunes, as we went on a 12 match unbeaten run (although this run did include throwing away a 5-1 lead at home to Kidderminster in the FA Trophy but fortunately for my players, we won the replay). Our run was eventually ended in a 3-1 defeat at home to Halifax of the National League, and we pushed them all the way, with them scoring twice in the last 15 minutes to finish us off. We finished the year in 7th place, just within the playoffs. In the second half of the season, we were a little bit more inconsistent. We swung wildly from the unstoppable in the form of an 8-3 demolition away to Tamworth (which funnily enough wasn't our moment of the season, our 4-1 win at home to Brackley early in the season was), to the appalling in the form of a 4-1 defeat away to Brackley who were flirting with the relegation zone at this point. Between the 12th of February and the 12 of March, we picked up just 2 points from a possible 15, with both of those points coming from 0-0 draws. It was at this point I began fearing we'd miss out on the playoffs altogether, as we had slid from 5th place to 9th place and we didn't look like improving any time soon. Again, I altered the tactics slightly, favouring a more defensive approach as I sought to grind out wins. 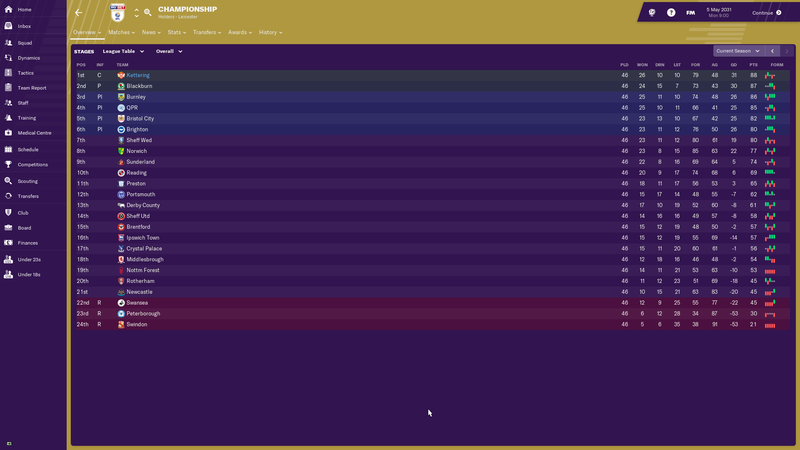 We won our next 3 matches, but then lost 2 and drew 1 after that, and we fell to 8th place with Spennymoor overtaken us in the final playoff spot. We scraped past Halesowen 3-2 in our penultimate fixture, leaving us on 64 points, with Spennymoor on 65 points going into the final match. 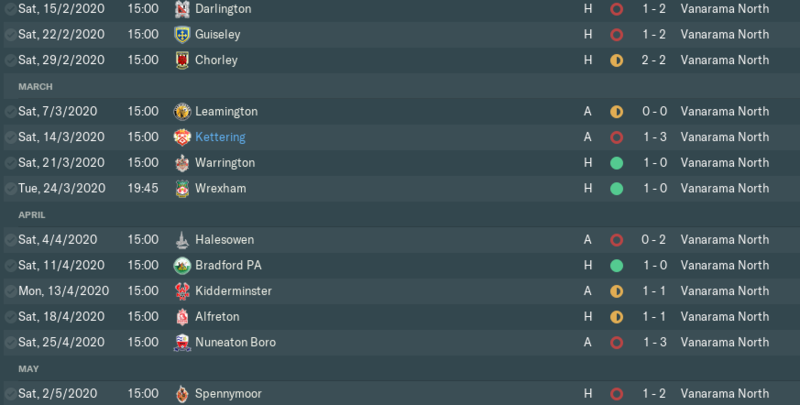 We had a tricky match away to King's Lynn, while Spennymoor had a straight forward match at home to Leamington, so I wasn't confident that we'd get the results we needed to get the playoff spot. We won our match 3-1, and while Spennymoor initially went 1-0 up in their match, the capitulated and had a man sent off, eventually losing 2-1, and we snuck into the playoffs. Needless to say, I was stunned! Our first match in the playoffs was away to Kidderminster. We were given no hope, but we came away with a 2-1 win, with George Hughes netting both goals. Our next fixture was again away, this time at Hereford. 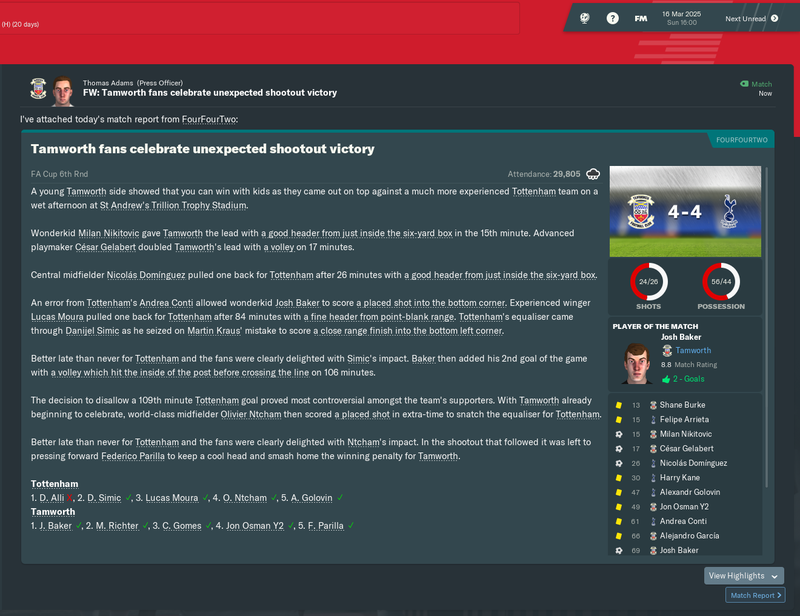 Everyone, myself included, expected us to get walloped by Hereford, but we completely and utterly FM'd them; we took the lead early on direct from a Jack Johnson freekick, and despite them throwing the kitchen sink at us and having two goals ruled out for offside, we eventually grabbed the winner on 81 minutes, and we were through to the final. The final was again away from home, at Telford. 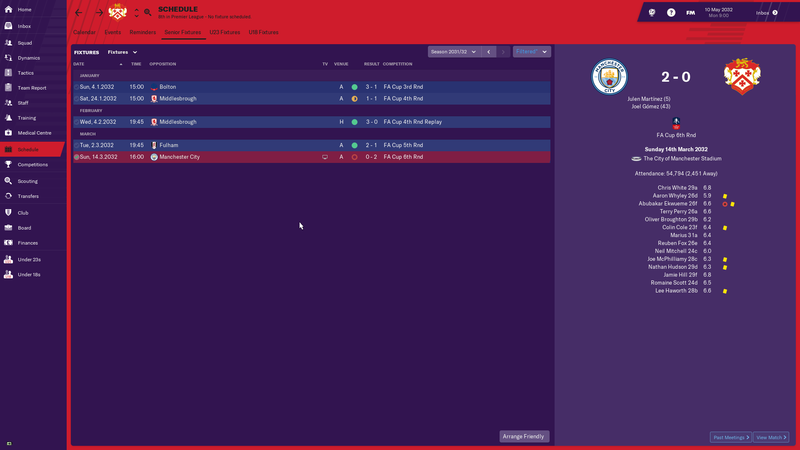 We raced into a 2-0 lead, and I was faced with the scarcely believable prospect of playing in the 5th tier of English football, despite being predicted to be relegated to the 7th tier at the start of the season. However, just after half time, Telford scored through Lee Shaw, and of course, it was the transfer listed striker's first goal of the season. It didn't looked to matter too much though, as we were holding out. 5 minutes of added time went up. In the 93rd minute, a long ball over the top ripped our defence open, and we conceded a penalty. Who stepped up to score and level the match at 2-2? Only Lee Shaw. I was speechless. As not much happened in extra time, penalties was required. We went first. First up for us was Jack Johnson, our best penalty taker by a mile with penalties of 16. He began his run up... and missed. The awful feeling of it wasn't going to be our day was growing. It was as if the game was paying me back for robbing Hereford blind in the previous match. We scored our next 4 penalties, and they missed 1 of their first 5, so sudden death arrived. We both scored our first 4 penalties, and missed the 5th one. It was now time for the keepers. Up stepped Willis, but he hit his penalty straight at their keeper. Their keeper stepped up, composed himself, strode up to the ball... and coolly placed it into the top corner. The Telford players and staff ran off in celebration. We trudged off heartbroken. Telford won 9-8 on penalties. It was such a cruel way to end the season, and ending we just did not deserve. In saying that, we can look back on the season with a lot of pride, and the defeat may also prove to be a blessing in disguise; we really weren't ready for VNL football, so another season of building the squad in the VNN may be just what we need. Ronaldo Brown, Sam Muggleton, and Finley Shrimpton were our star players this season, with average ratings of 7.24, 7.12 and 7.12 respectively. Brown in particular was outstanding this season; signed prior to the beginning of pre-season, he finished with 15 goals and 21 assists in 47 appearances in all competitions this season, and he won the VNN Player of the Year. Muggleton continued his fine from from last season, further justifying my decision to spend €5,000 on him, with his long throws causing panic among the opposition. Shrimpton, a very good player for this level, was signed on loan from Scunthorpe. I signed him in January to inject some more quality in midfield and also to allow me to play George Hughes in a more advanced role, but he surprised me by contributing 6 goals from a fairly deep position, made all the more amazing when you consider he has a finishing of 2 (it was 1 when i signed him!). Mitchell Glover, Jack Johnson, Sam O'Halleron, George Hughes and Elliot Newby also deserve some praise. Glover came in towards the end of the season to replace Newby who had started the season very well but a drop off in form and eventual injury finisged his season earlier than expected. Glover made 11 appearances, scoring 3 goals and assisting 4 more. Despite being rated as only a leading player for most Regional Premier Division sides, Jack Johnson started the season as the first choice right back, mainly due to him being deadly from set pieces with corners of 12, free kicks of 13 and penalties of 16. He was actually at the club when I first took over as manager but I didn't rate him to be honest. Now, I'm sorry I didn't include him sooner, as I have the "Play for Set Pieces" instruction selected for my tactics. Sam O'Halleron was signed on loan from Fleetwood Town (who we have an affiliation with but up until this season I hadn't loaned anyone from them) and while I signed him to play in the centre attacking midfield position behind the lone striker, I moved him into the striker's position towards the final third of the season, and he finished with 15 goals in the league. George Hughes again showed why he is one of my favourite players; while he didn't contribute as much in terms of goals this season (8 goals and 4 assists), his all round efforts were crucial to the side, and he as already mentioned, he scored twice in the playoffs. Elliot Newby started the season well, and along with Brown, was one of our best players in the first half of the season, but for some reason, his form dropped off from the end of January after getting a rating of 8.6 against Tamworth, and only on 3 occasions after that did he record a rating above 6.5, the highest of which was 6.9, before an arm injury against Guisely in the middle of April finished his season. Harry Hammett and Zayn Hakeem were our biggest under performers this season. Hammett scored just twice in 14 league appearances, and didn't get any minutes on the pitch at all from the end of January. While Hakeem mainly came off the bench, I still expected more from him, and an average rating of 6.66 was underwhelming to say the least. That being said, both players are handy players to have around the squad, so I'm considering giving them another chance. The rest of the squad aren't really worth discussing in detail, as they either performed to expectations without being spectacular, or didn't make enough appearances to have a major effect. We're currently looking to build a new stadium (it was actually announced last season, I just forgot to mention it), as the board wish to relocate to Scarborough. They have plans to build a 3,000 all seater stadium, but right now, they're still searching for a site. Currently, we play in Goole, which (accordinging to Google Maps) is over an hours drive from Scarborough. Our finances are looking very unhealthy, which is why I was surprised when the board announced the new stadium. 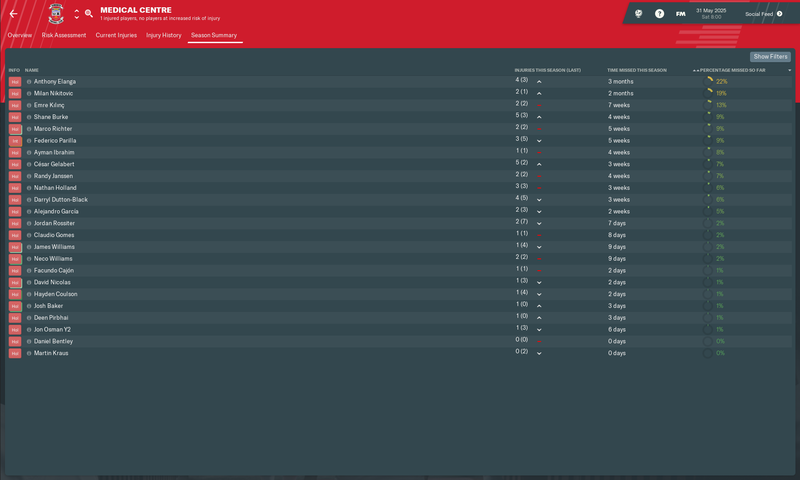 We are haemorraghing money (mostly on player wages even though I'm not overspending), and are currently €270k in debt. Looks like I'll have to arrange more glamore friendlies to plug the flow somewhat. As expected, Will Annan retired after not being able to find a club. F*ck him anyway, he would have been a very good player to have at this level. 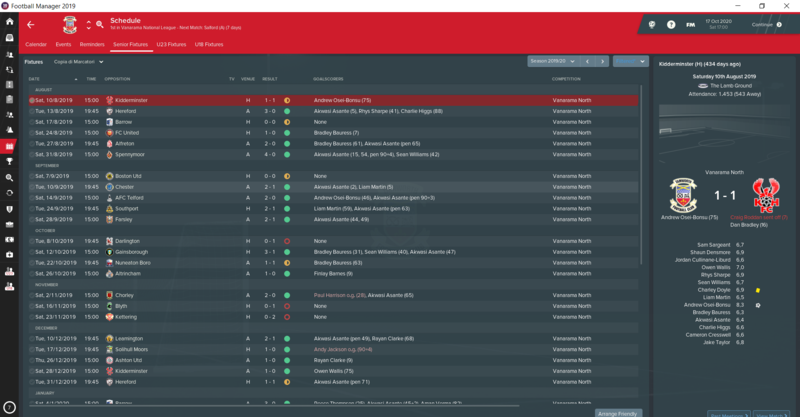 In addition to Brown winning PotY, I won the Manager of the Year award, which was a nice touch to the season, and my job status is currently untouchable. Long may that last! Sign a quality striker who we can rely on for the near future and will enable us to finish teams off (we drew 13 matches last season). 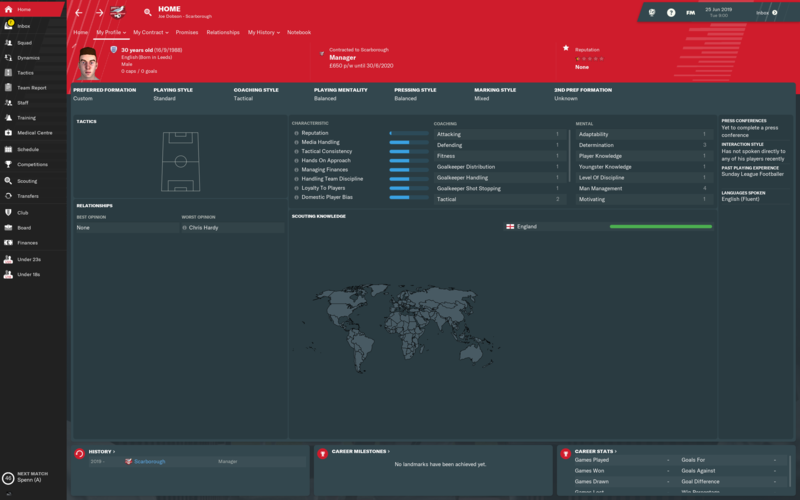 Add some strength in depth to the squad, particularly in centre midfield and and attacking midfield. Go on a run in the FA Cup, our finances are gagging for a cup run. Make a serious push for promotion, I don't want to stay in the VNN for too much longer or else we'll never get out of here. 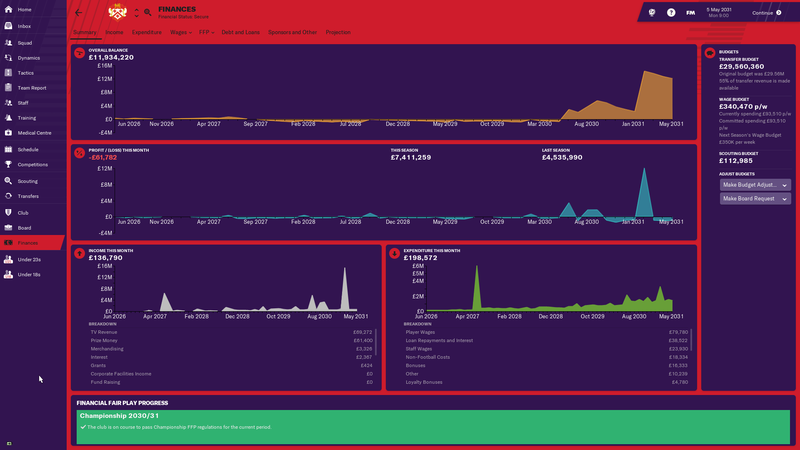 There has been a lot of progress made in the last few pages of this thread, unfortunately none of it has been by my team. They started well and then fell away before recovering. With 15 games to go they were 3 points from the playoffs, but the defense fell apart and the team only gained 18 points with 7 from the last 3 games. With the standard lower this year this was a missed chance. 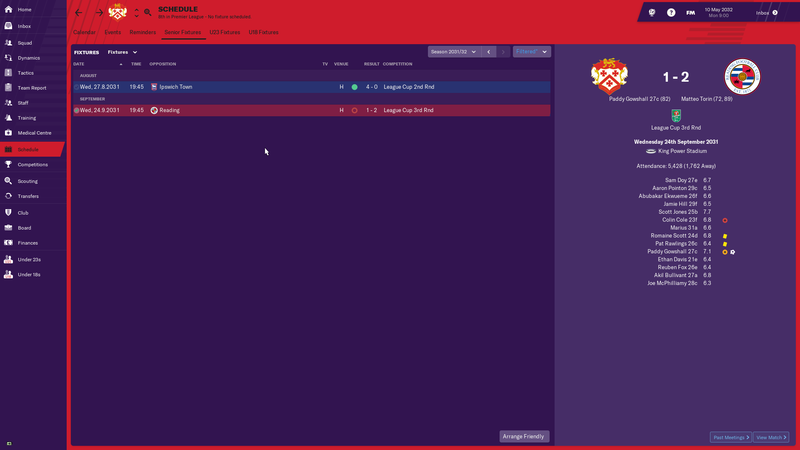 In the cups there was no progress at all, comfortably losing in the FA cup to L1 Colchester and then falling to struggling VNL side Newport in the FA trophy. 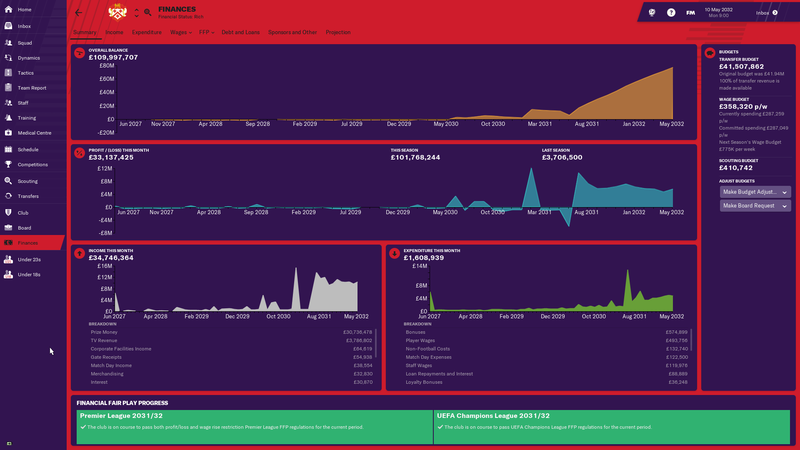 Finances took a real nosedive this year with the complete lack of success, this was in spite of setting a new average attendance of 1733. Some ridiculously low offers came in for Vernon at the start of the season, i ended up selling him to Celtic for 250K + 50% sell on which was as much as i could get. Only 3 players stood out, Klass who did well when not suspended or injured, Payne who stepped up as a creative force and George who in spite of his inconsistent form still only finished 1 goal behind the league top scorer. The squad needs an overhaul as the defense seems not good enough and the strikers are incapable of scoring enough CCC especially one-on-ones at critical times. A lot of players are out of contact and want too much money to renew them. 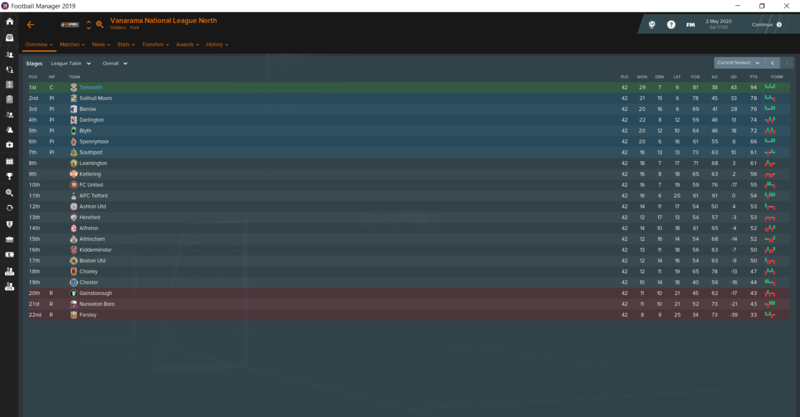 Following the success of last season, I gave the squad the chance to prove themselves in League One. League Table - we were 19th after 14 games before a pair of new signings changed our season. Winning the league with a game to go was unthinkable. 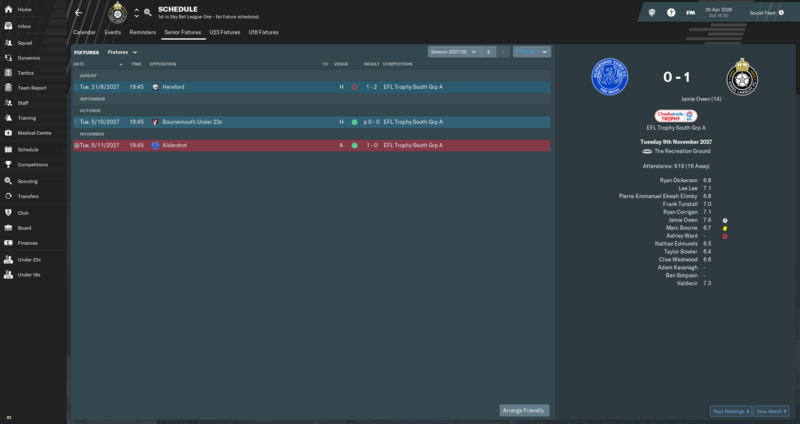 Checkatrade Trophy - last season we lost two group matches and qualified, this time we won two and didn't! Carabao Cup - we got the dream cup tie that took care of our finances, we even gave them a decent game. FA Cup - we went on a giant killing run, knocking out two Premier League sides to book a trip to Wembley. We lost on dramatic fashion, but the money has made a huge difference. Squad - this is mostly the squad from last season, with a few new faces. Transfers - five of these signings made an enormous difference to our team. Finances - the cup money was huge, some of which has already been put aside for new facilities. Josh Andrews - top scorer, but found himself out of the team later on in the season. Samuel Garba - this player made a huge difference. Valdecir - the other signing who changed our season. John Swift - I honestly didn't think he'd be good enough, he's now one of our best players. Roger Brookes - he won us so many matches. For three seasons now I've wondered if the squad will be able to step up to the new league, surely this time we are going to find it a bit more difficult? Competitions- Didn't do very well in either of the cups but I met my expectation of staying up in the league, by finishing lower mid-table. It could have been so much more as we had two long losing streaks which if we had maintained form throughout those we would have definitely made playoffs and maybe even won the league. David Lynch- The Irish central midfielder was very consistent and could always be relied upon to get a few goals and assists throughout the season. Scott Pengelly- Ross Hannah's strike partner, who was on loan from Oldham after we failed to sign him after a trial at the club, got a tonne of goals+assists throughout the season and won us a few games single handely. I thought the challenge had rules about only loading the English league and no edt DB? Have they been lifted? No edited database's but you can load other leagues. 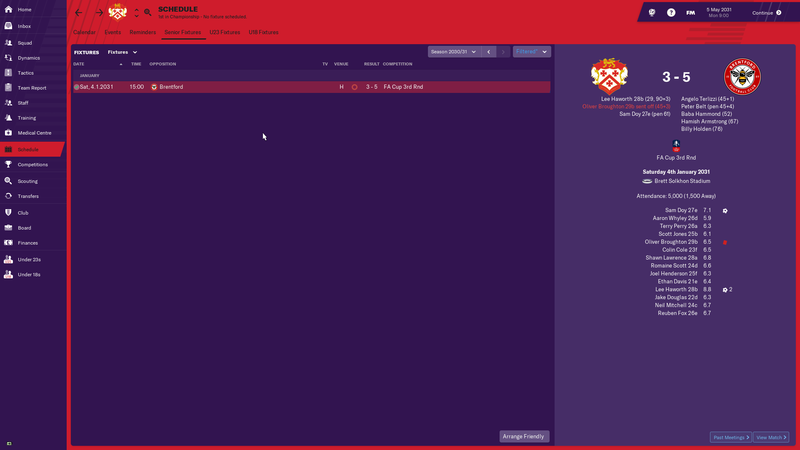 So shortly after our playoff promotion to League 2 my laptop decided that I had been to lucky with penalty shootouts and it would screw itself so I lost the save . . . but not to beaten after 26 reloads I have finally got AFC Hornchurch showing again on the 25th June to start this challenge again, but with a twist. I was so impressed reading about what @Mr U Rosler has achieved with his Stockport Academy Challenge I am going to try that with AFC Hornchurch. Now this is my entire clubs worth of players that I have till the next intake, Senior, U23s and U18s. 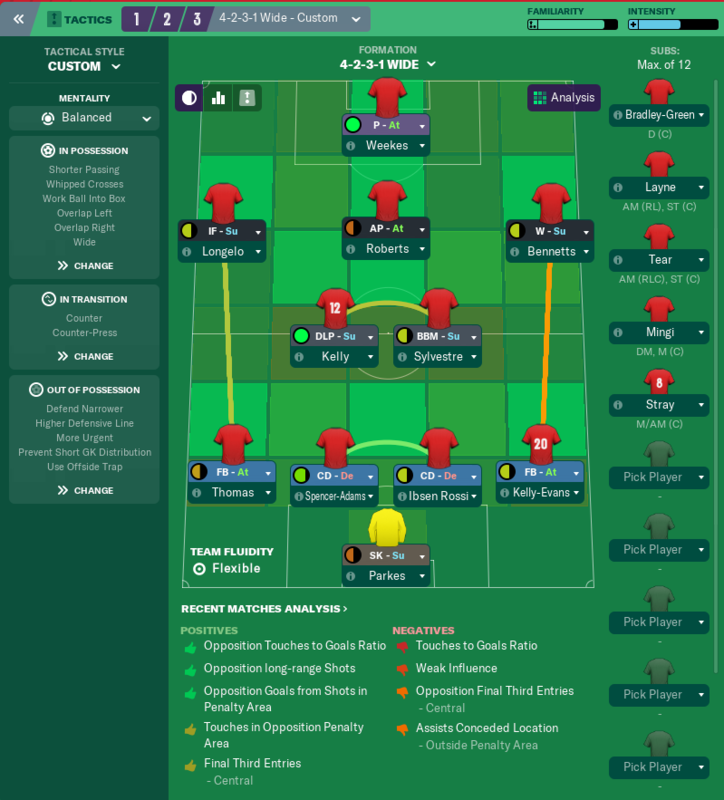 Now the glaring issue I have is only 2 GK's across all 3 squads so that's gonna be fun when I get an injury to one of them and have to rely on 'grey-gens'. Thankfully all over positions are 'covered' unless I have a major injury crisis. The AI had recognised this to as there were 3 GK's down as pending transfers that I have cancelled. After losing my Met Police game since I coudn't get my save across to my main PC I've decided to start again. 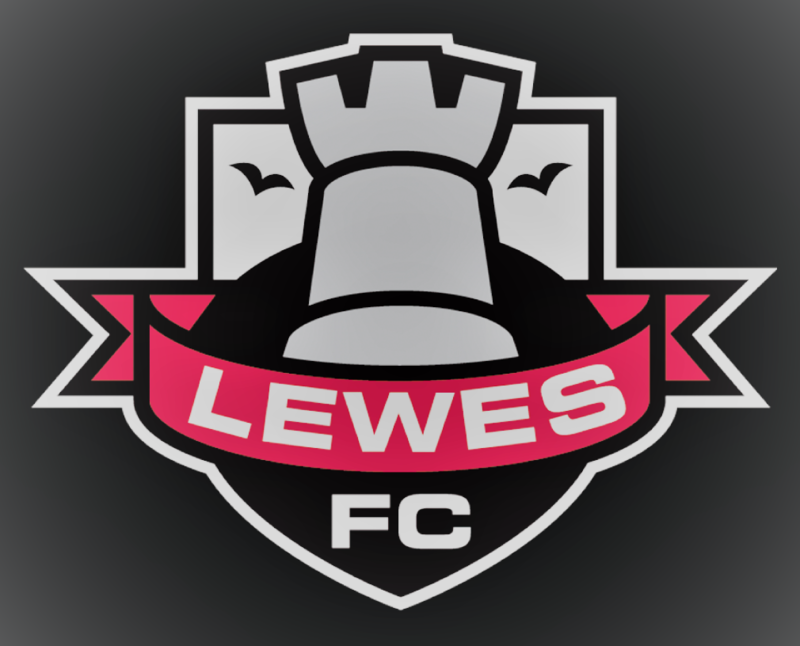 The team will be Lewes. 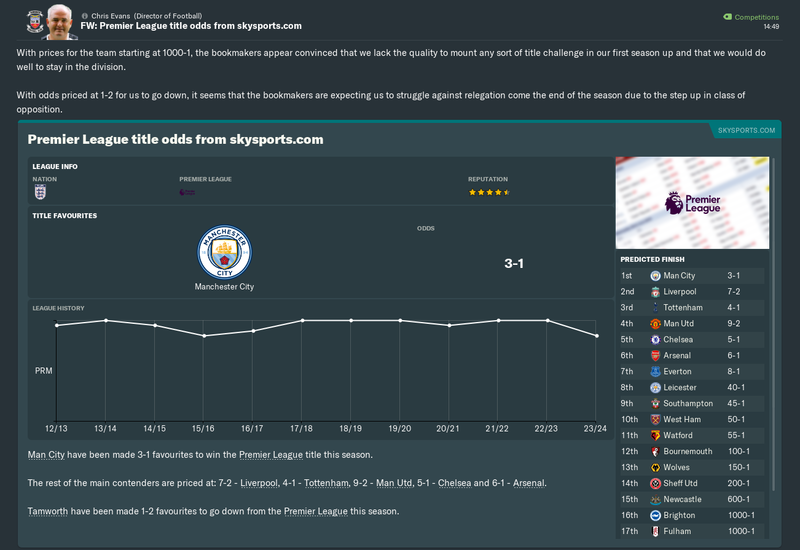 To say this season went better than I could have expected was an understatement, recording only one lose in the league all season it was one to remember. 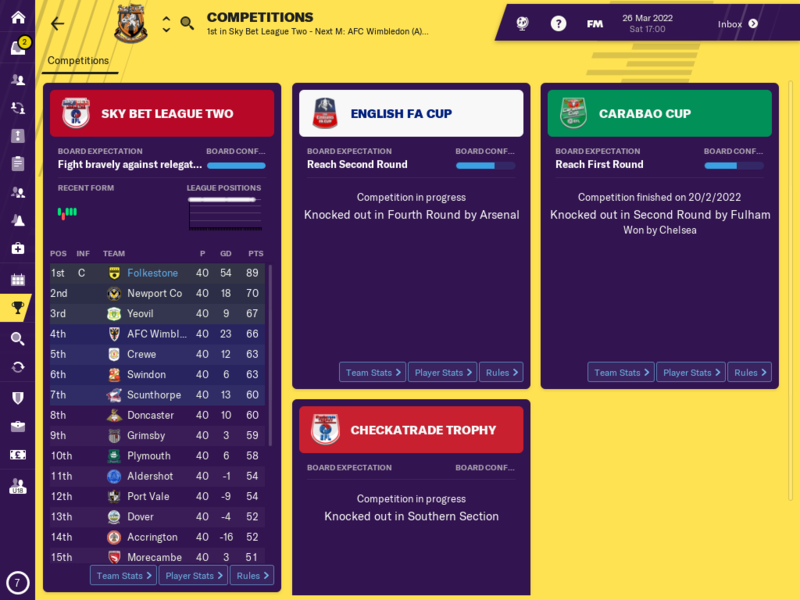 I was expected to be battling relegation but with a squad overhaul and a decent tactic I was able to win the League without to much hassle. The FA Cup went well and managed to reach the First round but AFC Wimbledon were just to strong in the end and beat me 3-0 away from home. The FA Trophy though was a better hunting ground as I went on to lift the cup. The 2nd round against Crewe where it took two legs and penalties to decide was a crucial game, then a home first leg 2-1 defeat to Sutton Utd seemed to indicate my run would go no further was overturned with a 5-3 victory in the away tie. 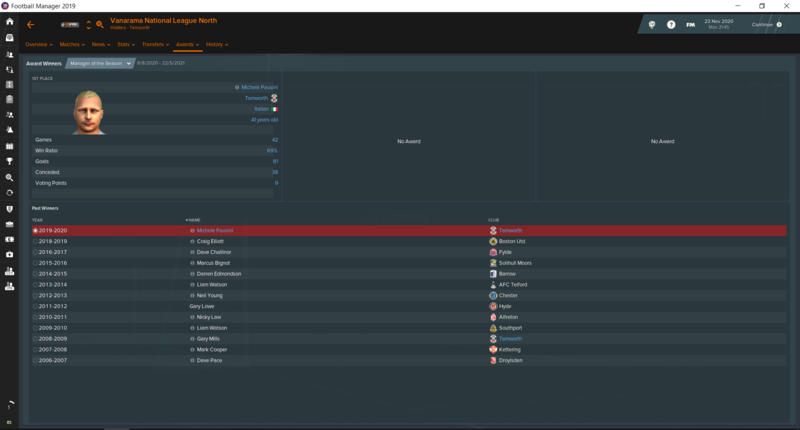 The final was more straight forward and I claimed the League and cup double. 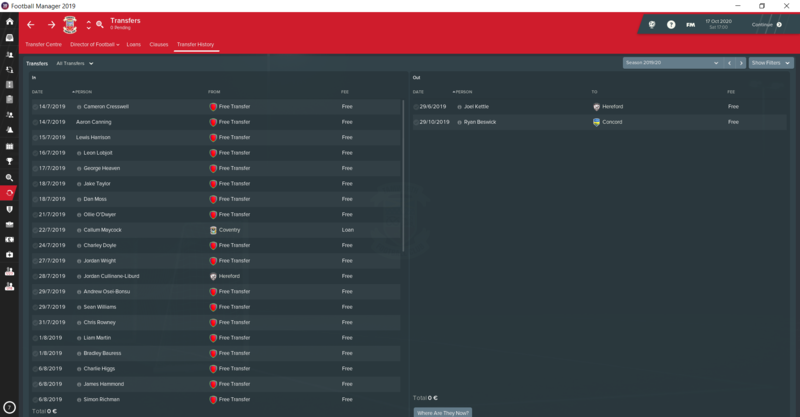 In total 17 were added to the squad, 13 in the Summer and then another 4 around Christmas. 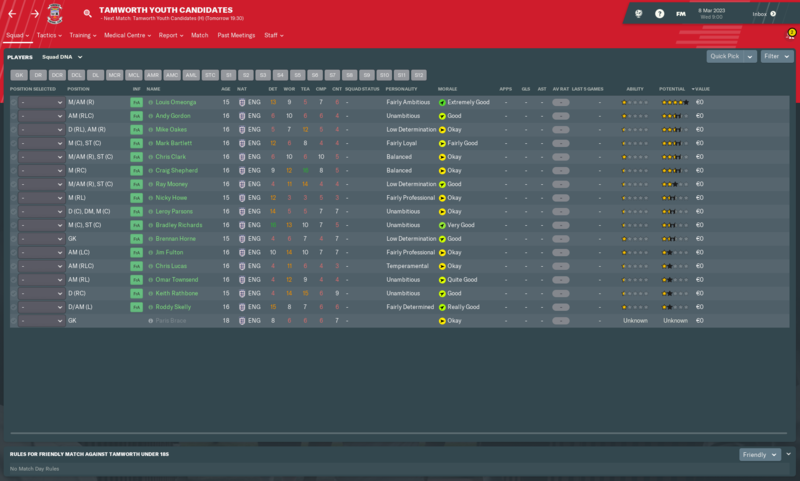 The 4 included a Keeper and three defenders to bolster my back line, all 4 are now starters, All in all the transfers helped build a good squad for rotation but I only expect to take maybe 8 of these signings into the National League next season. 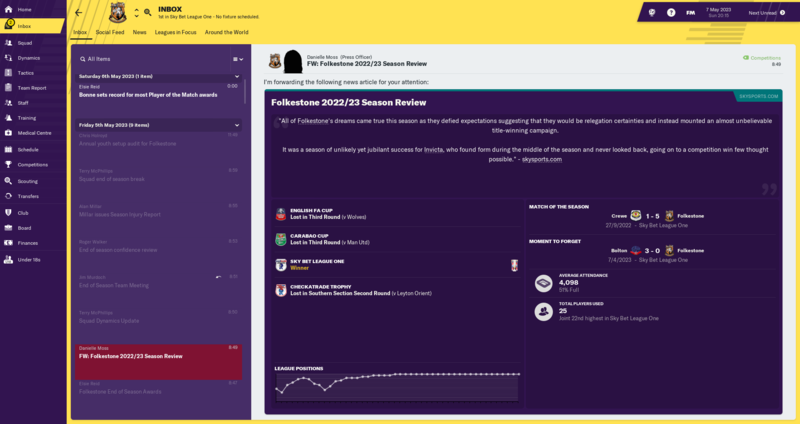 Finances were not looking so hot in the middle of the season and the hope of some nice FA Cup monies and a dream 3rd round tie disappeared quickly. 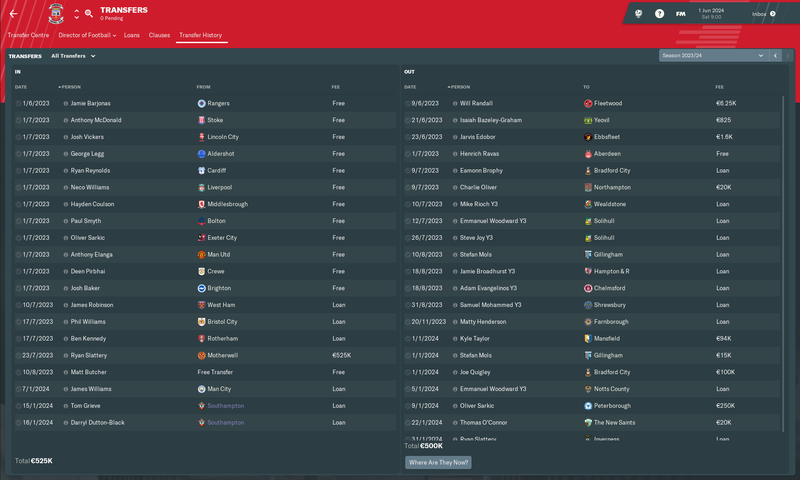 I was making plans for next season in December at how much to reduce the wage budget to use next season as a platform for financial stability. 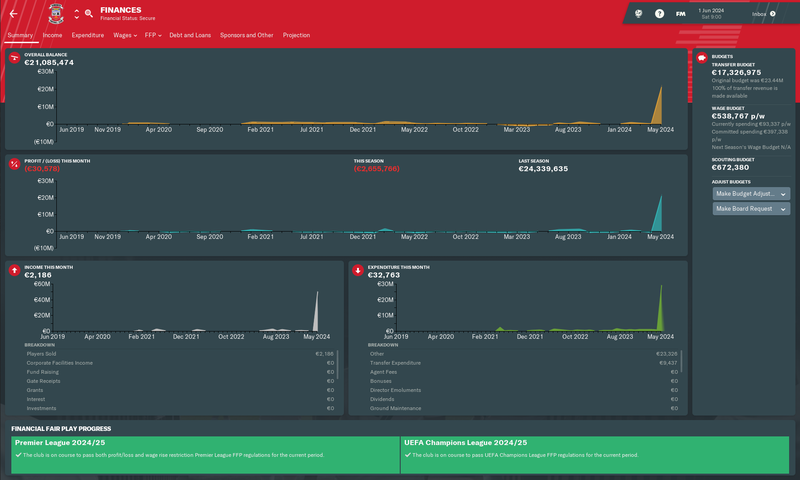 That subsequently changed with a the FA Trophy run and I now find myself in a more stable 160k balance, next season is looking better already. 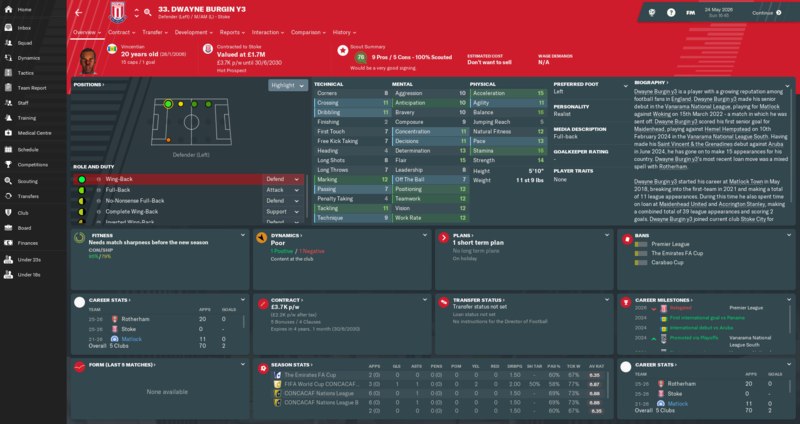 Sam Warde - Key midfielder with 11 goals and 5 assists in the league this season meant he was my best player this season. He subsequently won both young player and player of the season at the club. 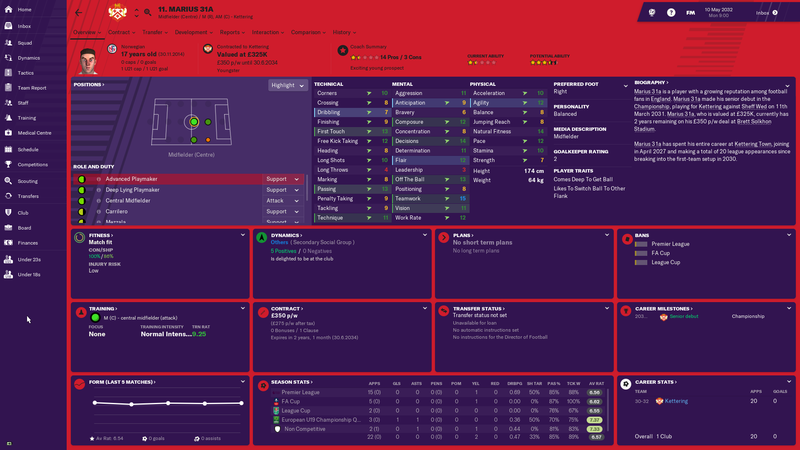 Dan Darbyshire - Main striker for the entire season and ended with 14 goals, despite that I was never entirely convinced by him and will probably find himself a bit part player in the future. Nick Cotton - Had a very good season out on the left wing picking up some of the scoring responsibility. Suffered a major broken ankle injury in the last month of the season and will be out till Christmas. 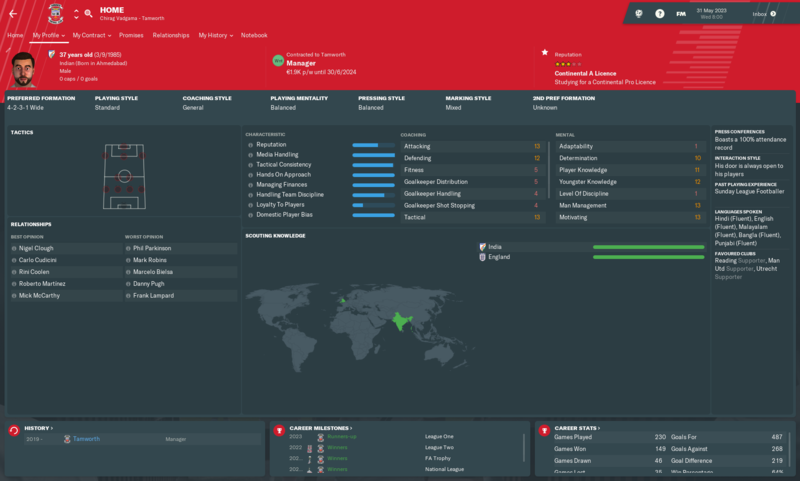 I will decide on renewing his contract after I evaluate potential replacements. Ryan Suckling - Was a November recruit to add more depth to my defence, turned into my main centre back almost straight away and will be aiming to keep for the coming season. 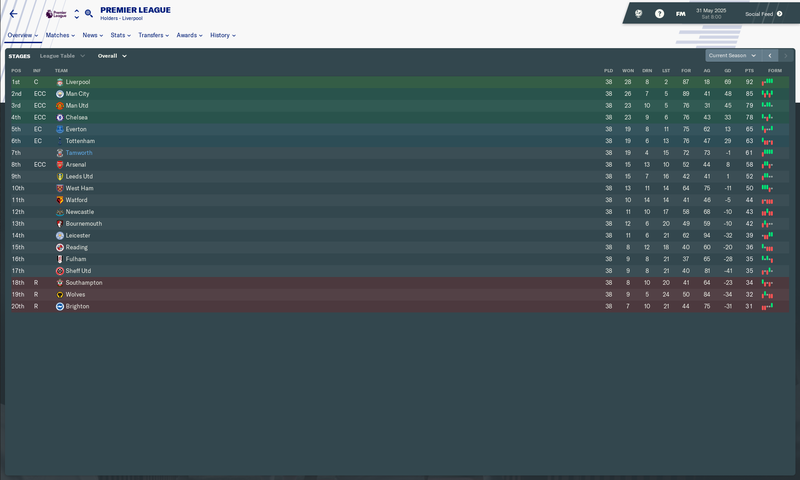 Well, quite frankly ridiculous, some how we've only gone and done it... consecutive promotions all the way so far. 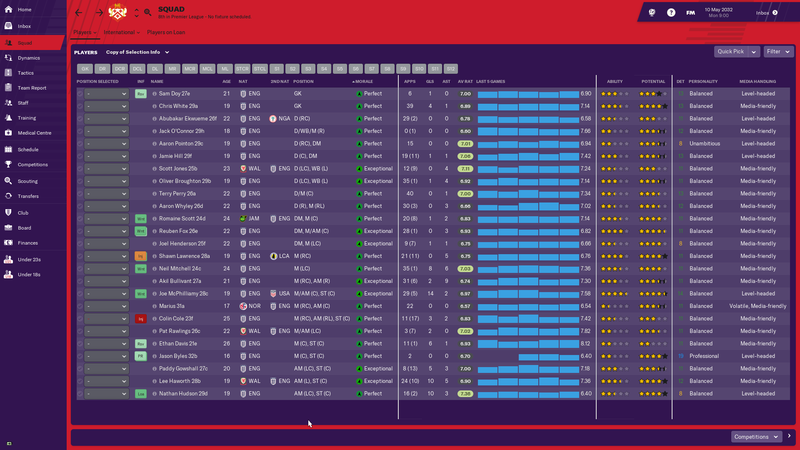 Made a few quid selling a couple of players and replacing them with loanees at christmas. 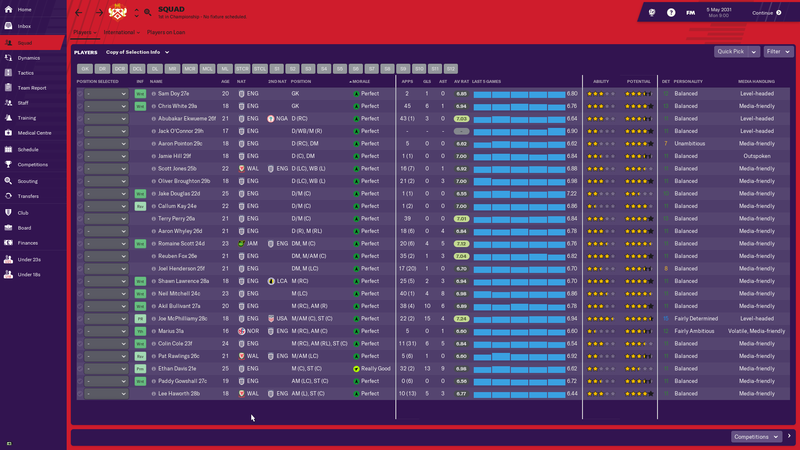 Once again managed to build the squad without paying a penny for a player and they seem to have pretty much worked out top drawer. 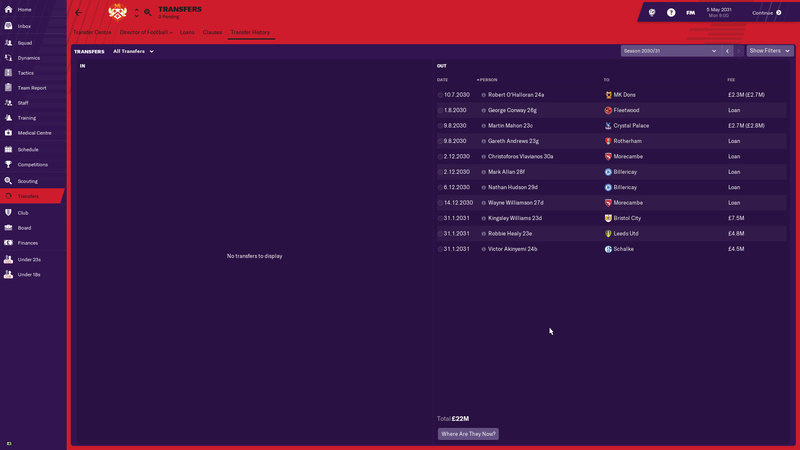 Still having issues with our stadium though which seems to be taking forever and my biggest fear is that we won't get anything until we get to the premier league and then get lumbered with a tiny league 1 size stadium. Anyway, I've just got on and managed the team, they've done amazing! Tactically i just went all out attack, rotating between a really attacking 4222 and an even more attacking 343, had some really odd results but mostly we blew teams away by 3 or 4 goals but with lots of different players contributing rather than just a single striker. 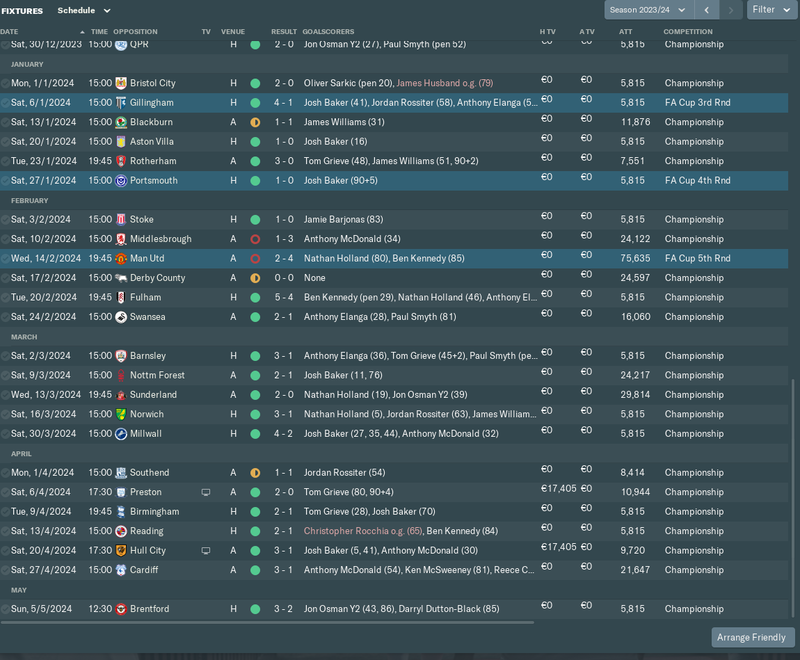 Hopefully we can stay up in the Championship next season, up with the big boys where i think just having good tactics won't cut it and I do worry that i won't be able to create a balanced or defensive system to cope. At least the board has continued to back me by paying for more training and now I'm on track for my continental A licence! To the Flamingo Land Stadium we go. The Seadogs were one of the competition's more unpredictable teams, enjoying an impressive spell of form between November and December that saw them rise to 12th, having sunk as low as 17th earlier in the campaign that ultimately ended with them exceeding expectations." Our seasons are beginning to follow a familiar pattern; a bright start in the first 4 or 5 matches is followed by a massive drop in form in September resulting in early cup exits, which is then followed by an upturn in form towards the end of the year, before plateauing from about February onwards. 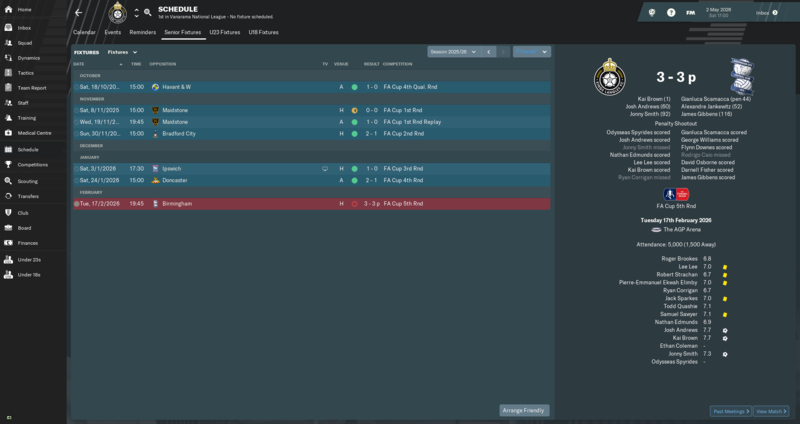 While I wanted to finish in the playoffs again this season, my tactic which had brought me 6 wins from 9 in pre-season, including wins against Crystal Palace and Bradford City, suddenly stopped working and we went on a 7 match winless run, which included 3 losses in a row. 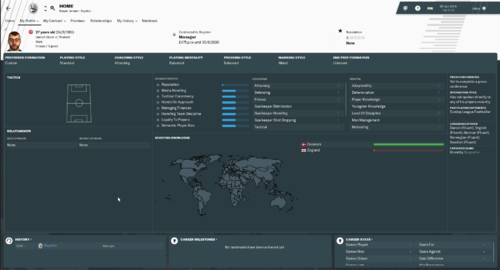 After the 3rd loss, I created a few new tactics which brought us some stability and more importantly, results. 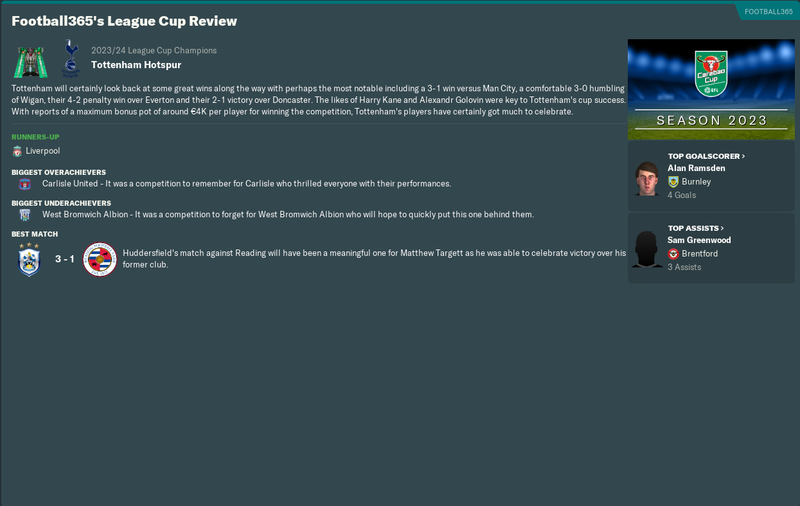 We finally managed to get through the 2nd qualifying round of the FA Cup this season, beating Stratford 5-0 away, only to lose on penalties against Nantwich in the next round. 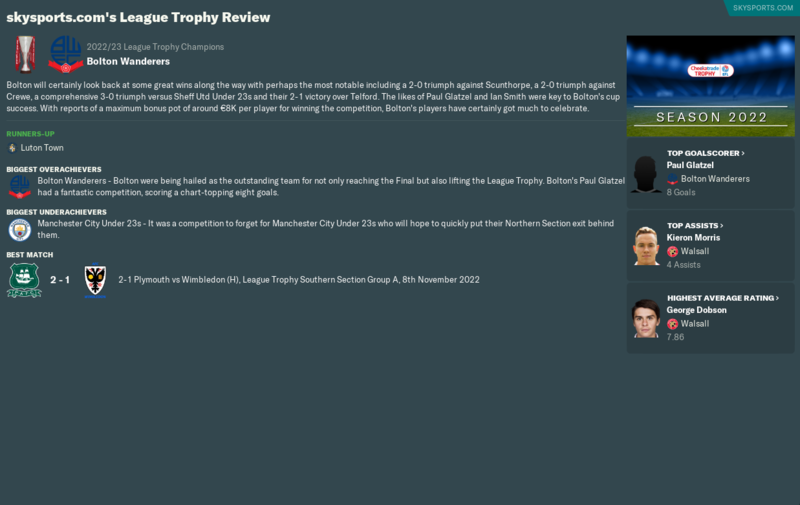 We also exited the FA Trophy at the first hurdle, losing 3-2 away to Halesowen. 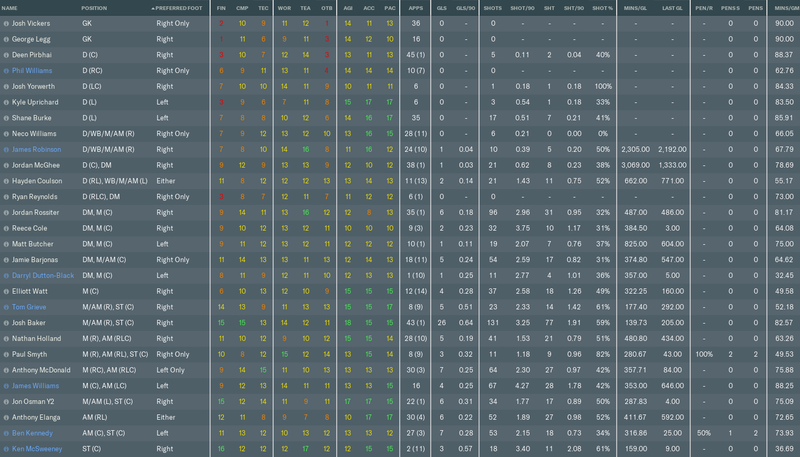 We eventually finished in 15th place, 16 points clear of relegation, but 21 points below the last playoff spot. 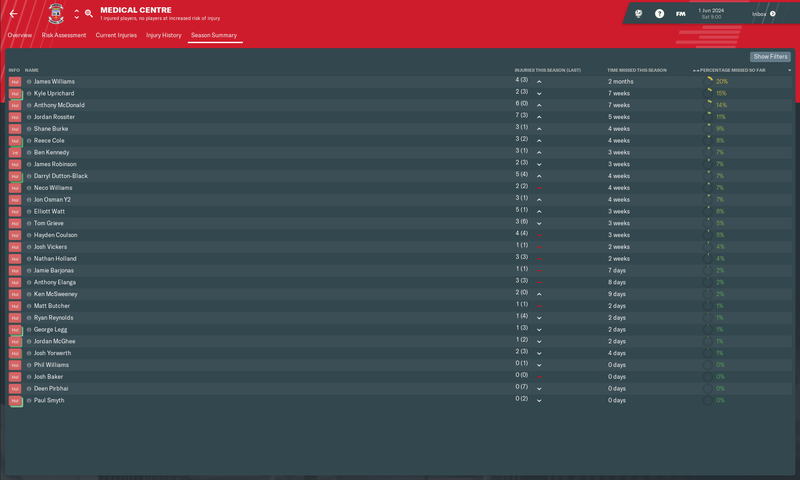 I had constant issues with player unhappiness this season due to the consistently below average player morale all season, most of the issues being players who were nowhere near the first team demanding more minutes despite not deserving it. In the end though, I kept the ship steady, and I will be trimming the squad considerably in the transfer window. 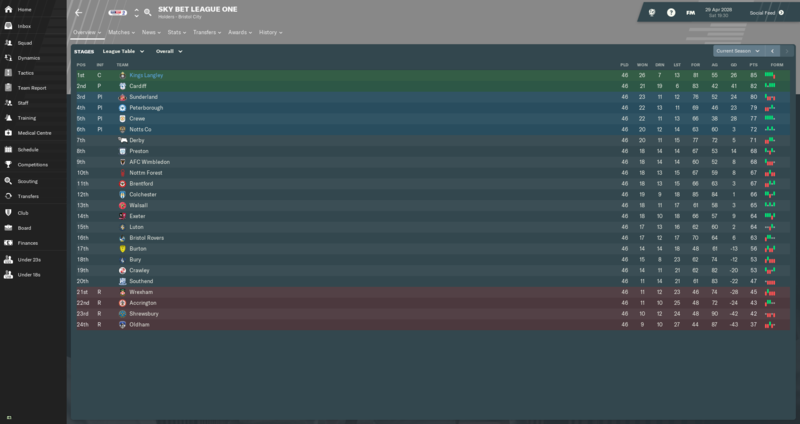 The first season went very well and we comfortably won the league. It took a bit of time to find consinstency, I played all the season with a 433 (4141DM) formation but changed the roles until january. 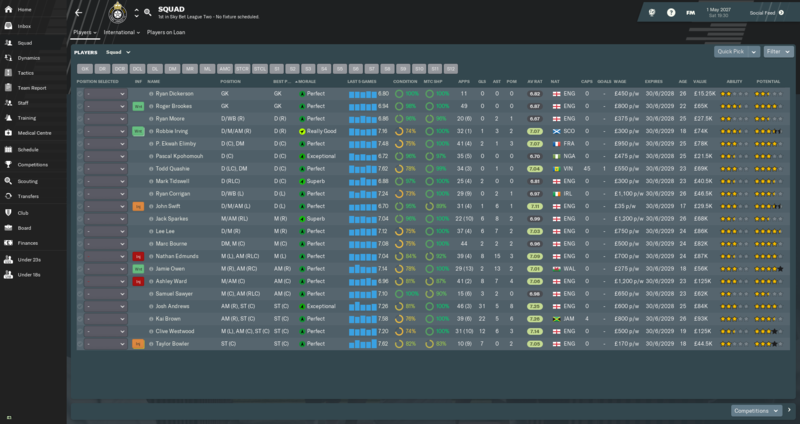 I signed too many players, but most were on non-concracts, so I released most of them when I found someone better. 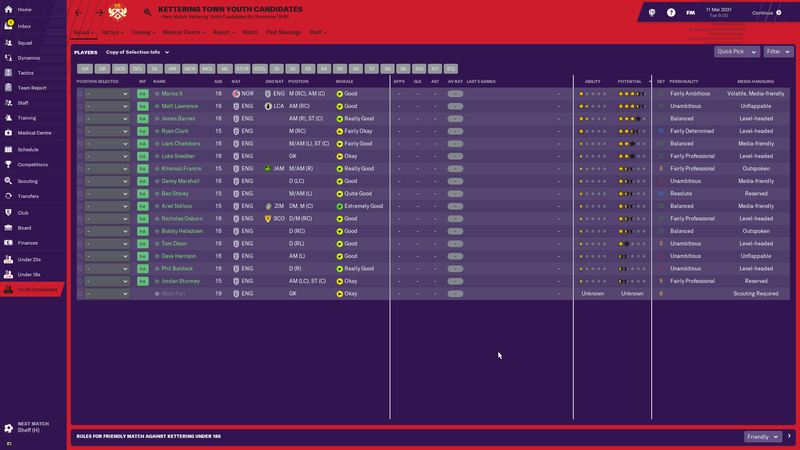 I kept 4 players of the original squad, Asante, Wallis, Sharpe, Verma, in my starting XI. Left back Sharpe won the player of the season award. 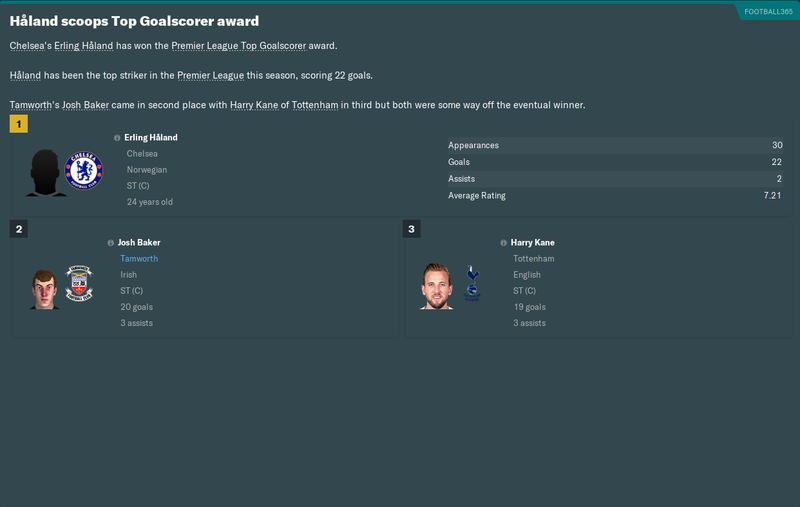 I also won the manager of the year award.